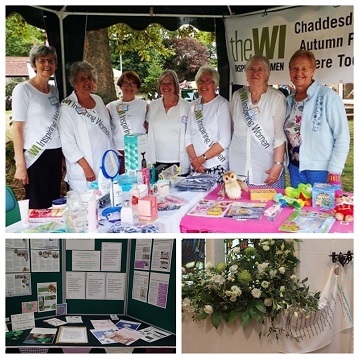 A page full of interesting articles and information on WI activities from around the County. 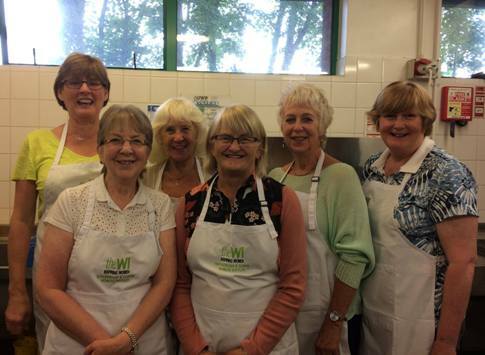 Members can scroll down to see just how different and varied our activities and WIs are. 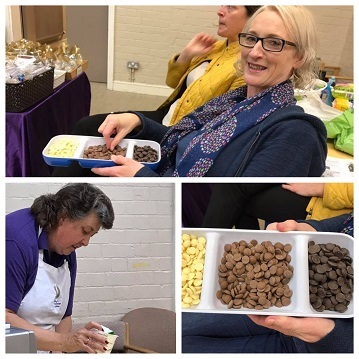 Repton WI had a GINTASTIC EVENING! - Tthanks to Stuart & Herbie for a very entertaining evening introducing everyone to some botanical gin mixes and giving a brief insight into the history of gin. It was a really social, fun event with coffee and delicious cake to finish off the evening. The photo says it all! Pentrich WI - It was a big Aaaaah moment when we met Alice and her handler David last night. She is an ambassador for the charity Medical Detection Dogs. These dogs do some amazing work with sufferers of Type 1 diabetes and sniffing out a variety of cancers. 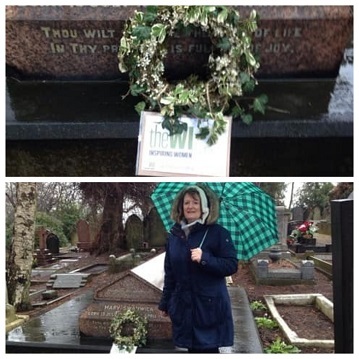 Chesterfield Town WI - We were honoured to be invited to Friends of Spital Cemetery International Women's Day service this year. Unfortunately, the adverse weather today means the event has been postponed. Nevertheless we persisted! 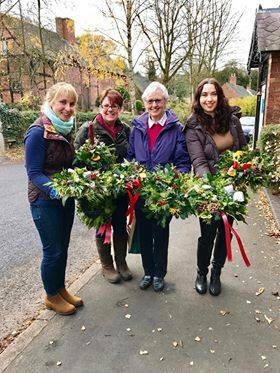 Mandy and Ann joining together with Lyn to lay the beautiful wreath Mandy has made for the occasion. Thank you ladies for representing us all and for celebrating one of the extraordinary women buried in the cemetery. We look forward to hearing more about some of them in our June meeting! 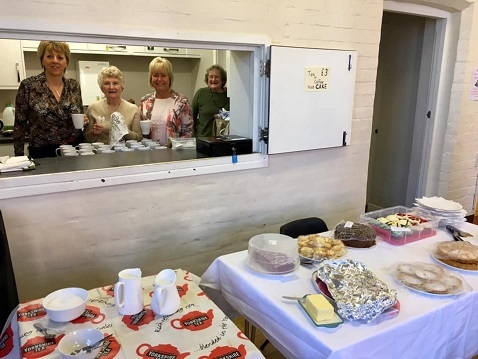 Despite the intermittent rain, Breaston WI had a packed hall at their coffee morning - obviously eager to enjoy the delicious home made cakes baked by our WI ladies. Another successful fund raiser ! 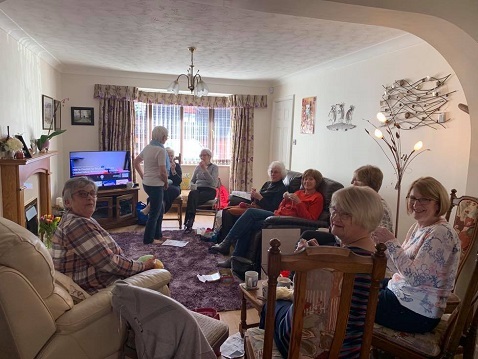 Uffa Magna - Mickleover WI spent a very enjoyable afternoon learning to crochet with the help of Gill James and YouTube! 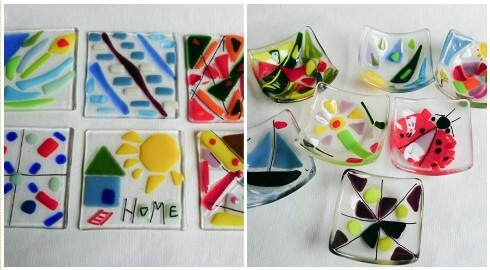 They decided to change the name of the craft group to the Monday Makers, to encompass lots of different crafts. Next month they will be painting stones to ‘hide’ in various locations around the village. 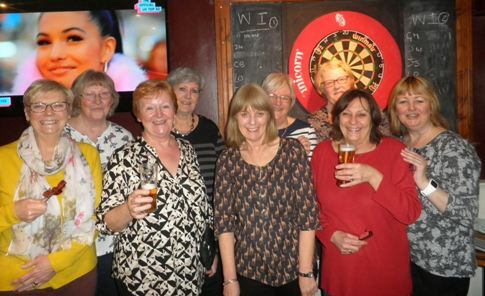 Willington WI - Last Monday of the month- it must be darts night! The general opinion was - we are improving... slowly!! 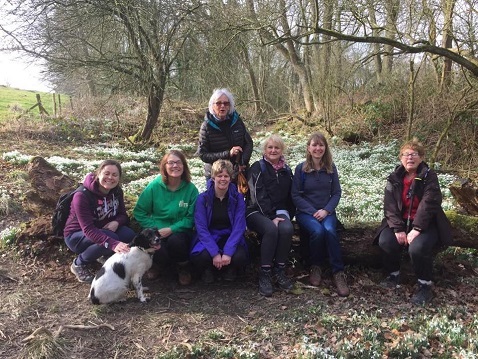 Breaston WI visit to snowdrops at Hopton Hall. A bevy of Breaston flowers amongst the Hopton flowers ! 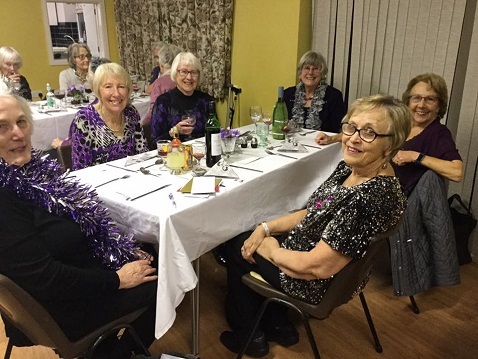 Heanor WI had a very enjoyable quiz evening fundraiser and the profit will be in the region of £300. This will be donated to Heanor Vision, who do such sterling work for the people of Heanor. 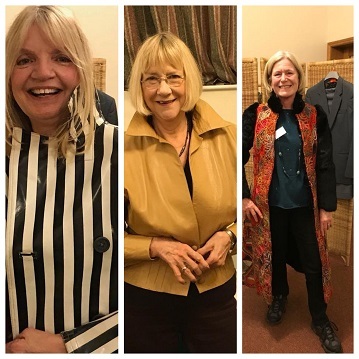 Janet Green came to talk to Bakewell WI members about her eclectic mix of clothes she has collected over the years. 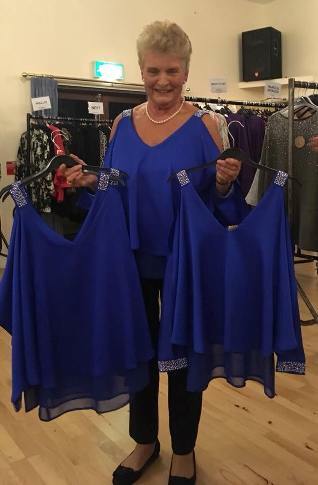 Absolutely brilliant, and our members enjoyed trying them on too! 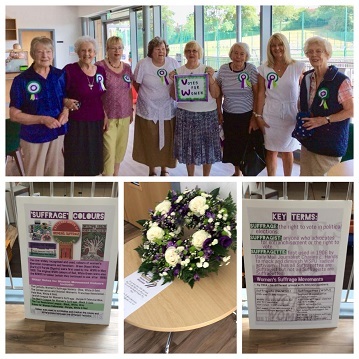 Breaston WI 5 ladies went to Denman for an event to celebrate the first year of the Walking Netball programme . (Sue, Sally, Cherie, Melody and Helen ). They were privileged to meet Ama Agbeze captain of the England Netball team and NFWI chair Lynne Stubbings. Looking good ladies ! 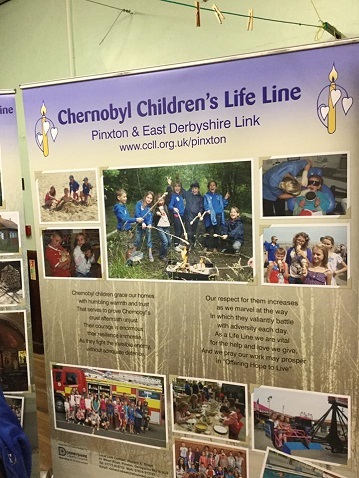 Heanor WI had a talk from members of the Chernobyl Children Lifeline, who gave them an insight into the valuable work that is undertaken every year by the trust! They heard about the living conditions of people who live in the area where the nuclear disaster took place in April, 1986. 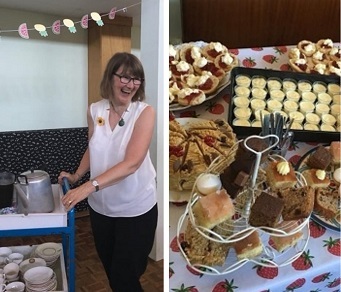 The group, based in Pinxton and East Derbyshire, raises funds all year to bring several children from Belarus over to the UK for a month’s respite and to build up their immune systems with good food, fresh air, and multivitamins, which sets them up for the next two years once they go home. The children are all looked after by host families. 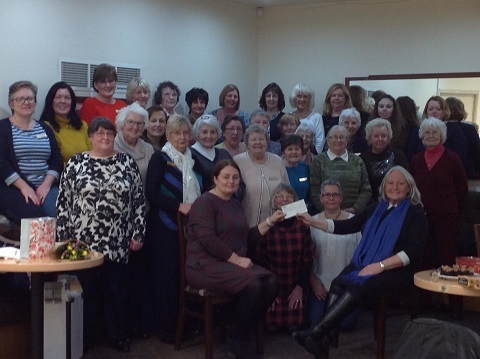 Ravensdale WI enjoyed listening to speakerJo Golby at their February meeting. .Her talk ‘A postcard from the past’ travelled through the bygone age of holidays. She had members involved, talking about where they went for holidays,what sort of accommodation they stayed at and their mode of transport, adding her own funny memories to the talk. A nostalgic trip down memory lane. 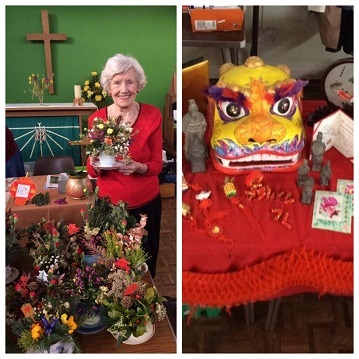 Old Brampton WI celebrated the Chinese New Year for their WI meeting . Everyone dressed in red or gold and made flower arrangements in tea cups with a Chinese theme. They all had fortune cookies and the afternoon finished with red and gold cupcakes and everyone went home with a Chinese gift. 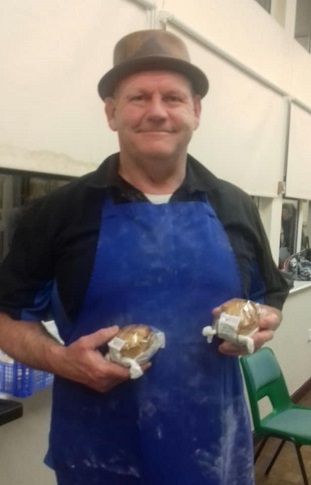 Risley WI - Ian Hartland with his handmade pies. Such an interesting and jolly evening. He even managed to teach us things we didn't know about pastry! Littleover WI - Just a normal Thursday night! 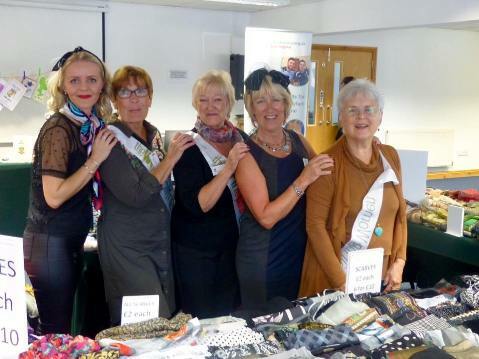 Chaddesdon WI had a very enjoyable time at Hanson ‘s jewelery auction. Hope they were not tempted to buy! 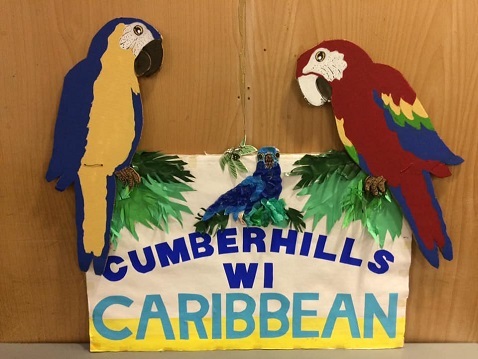 Duffield Cumberhills WI had a wonderful Caribbean night - great fun! Cocktails, mocktails, music, Caribbean recipe cakes and so much more! Hope WI celebrating their 30th anniversary party - what a great cake! 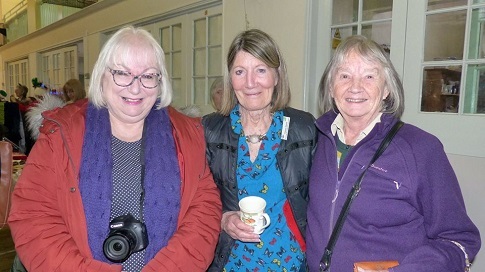 Briz Valley WI Judy Stanhope Trustee spoke to the meeting about the Derbyshire Federation archives. The Archives committee members sort papers and artifacts from WI's some of which no longer are running and date back years. It is so important to keep records,photographs etc from mothers and grandmothers and as we saw it is part of the WI,s history. 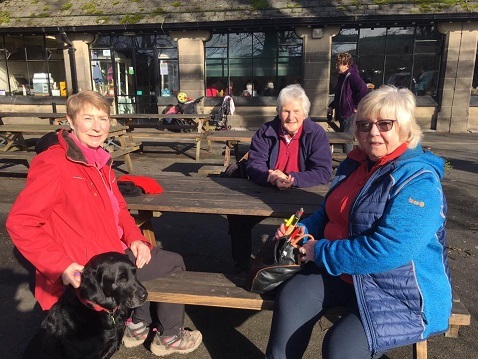 Baslow WI Fourteen “darlings” (plus dog )enjoyed the walk today along the Rowsley Trail to the Whitworth Park cafe for a very pleasant lunch stop before returning to the carpark. A mild, sunny day to enjoy the spring flowers, peaceful cattle and views of Peak Rail. 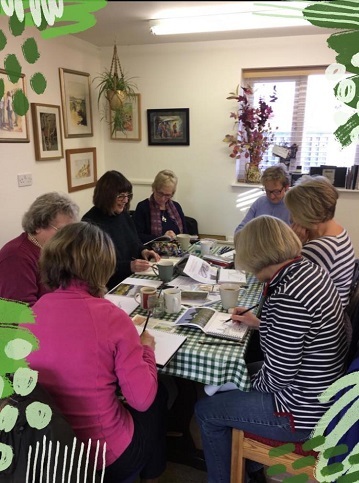 Breeston WI Art Club. Ania’s Doodlebags Group in action. Artists in the making ! 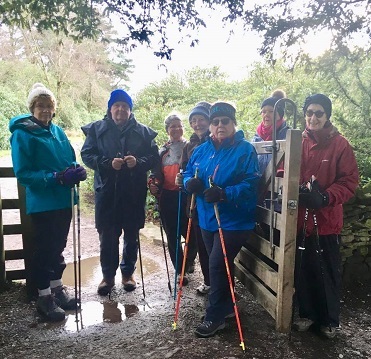 Members of Baslow WI very popular Nordic Walking at Longshaw in early February. Very windy outside but the hot drinks afterwards were vey much appreciated. 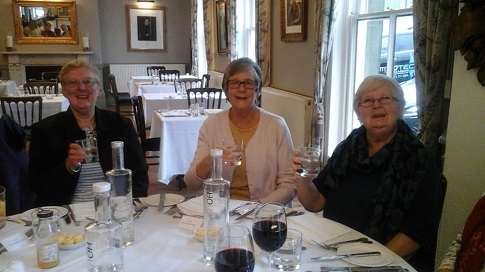 Briz Valley WI members at The Dial in Burton for their Birthday Meal. We think they all had a great night. judging by the photo!! 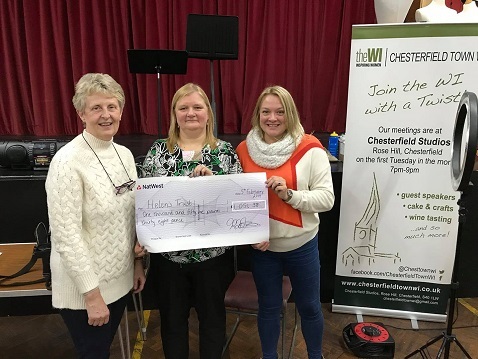 Chesterfield Town WI were very proud to present Helen's Trust, their chosen charity for 2018, with a cheque for £1,051.38 at the February meeting. Well done and thank you to all members for their generosity and hard work - especially those involved with the Garden Party. A big thank you to friends at Barlborough Hall School for all their help with and hosting of the Garden Party. 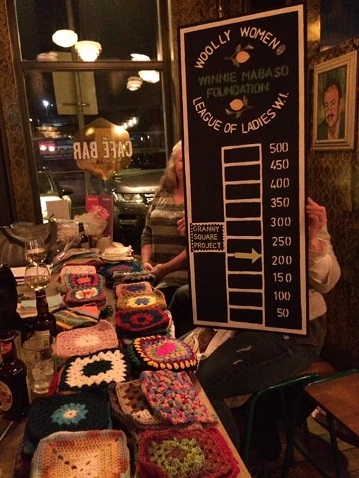 Glossop Woolly Women are making these beautiful squares which will be taken to South Africa and made into blankets by their granny club. Not too far to go before they reach their target. Burton Belles WI. 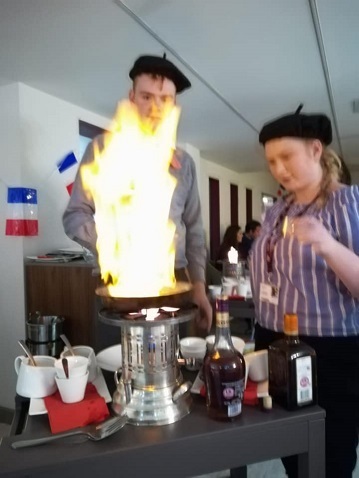 Some of our ladies enjoyed a French themed meal at Burton College recently. Great value dining. Supporting local students. Fun & friendship. 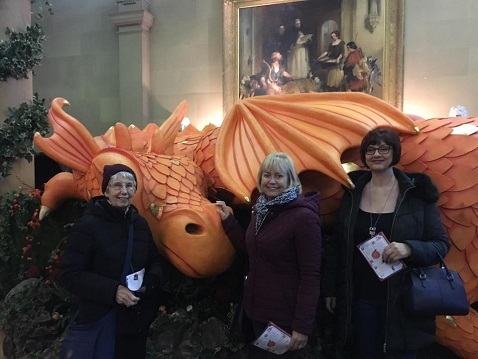 The Willington WI station team met to discuss some minor damage to plants in one planter but with such frozen conditions they retired to the warmth of The Dragon for future planning and coffee! Having got all togged up to leave and pay, they discovered an unknown lady had made a wonderful gesture in paying for all their coffees. A very big THANK YOU to you from Willington WI. 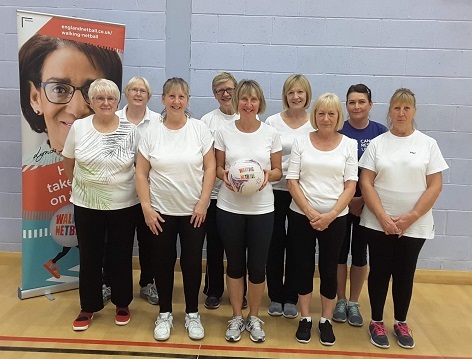 The Women’s Insitute and England Netball teamed up to run a national programme for WI members and following a successful taster session at Arc Clowne, Barlborough and Clowne WI member Sue Ammon applied for the group, now known as the Arc Angels, to be part of the programme and 20 funded sessions began in June last year. 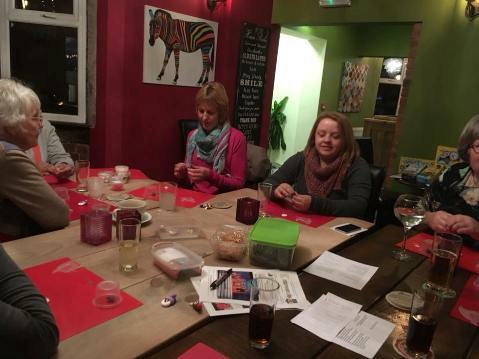 Eventually opened up to the winder community, the group now has around 16 members and is also now self sustaining after the funding ended but group members successfully negotiated with Arc Clowne to add it to their weekly timetable. 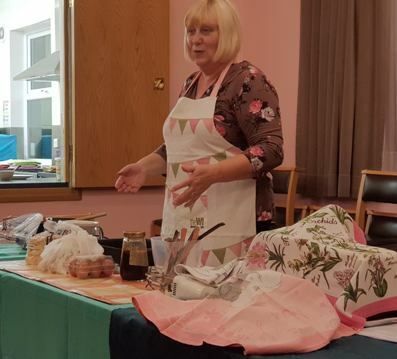 Willington WI held a small workshop where they started to make feminine hygiene kits after the DFWI ‘Days for Girls’ event in September 2019. 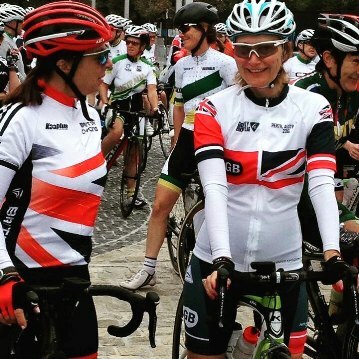 Well done ladies - it is not as easy as it looks at first glance! 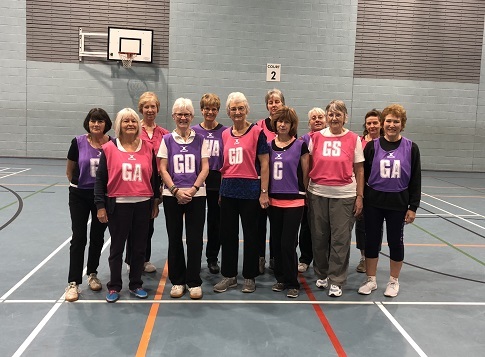 Members of Ashbourne WI enjoying Walking Netball. 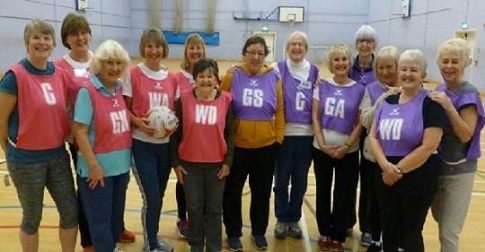 Walking Netball is really taking off in Derbyshire with new venues being set up.Anyone in the Ashbourne area is very welcome to come to the Ashbourne Leisure Centre each Friday from 10.30am until 11.30am and join in with the great group of ladies who have been coming to that session. A super fun activity 🏀👍come on down and bring a friend! 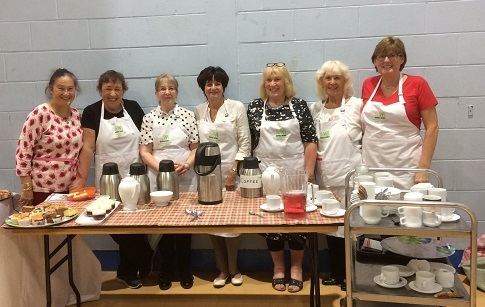 Barlborough & Clowne WI ladies once again supporting the Eats & Treats event this morning at Pinxton. A very busy morning and thanks to Anne and Liz for baking the gorgeous cakes. 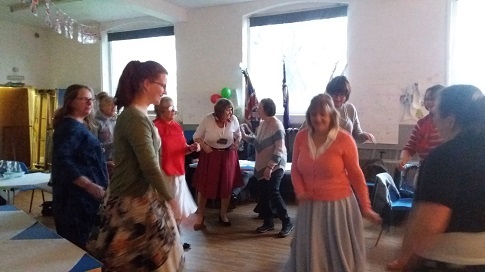 Members of Tibshelf WI had a great afternoon of singing and dancing with 'Harmony Plus' celebrating their 7th Birthday! 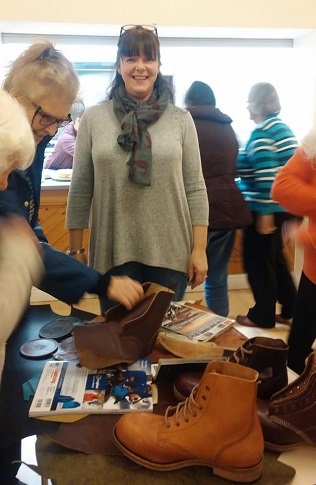 Thank you Libby Slattery for a very interesting talk at the Calver WI January meeting l. Members are all looking forward to visiting the Boot Factory! 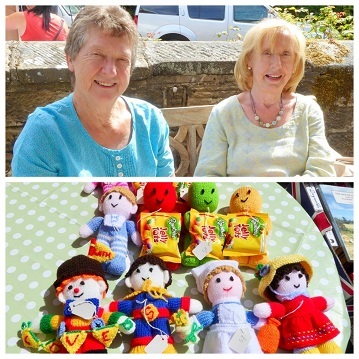 Baslow WI members enjoyed their first outing of the WI Centenary Year. IT was 'The Bakewell Pudding Experience'! They all made a pudding and whilst they were in the oven ate a late breakfast. 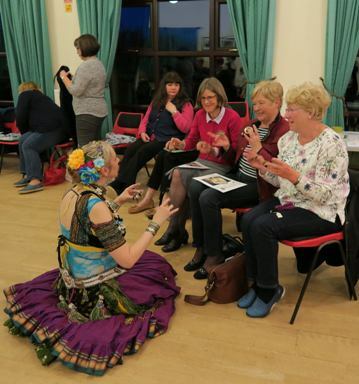 Photo's from Briz Valley WI January meeting. 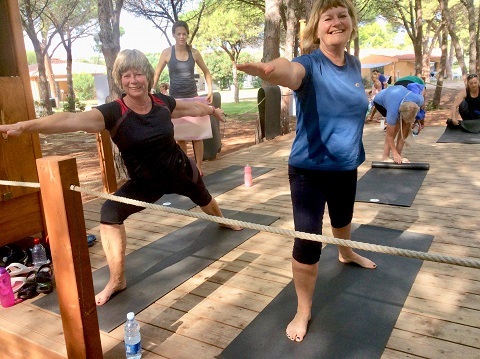 Laughing Yoga with Anne Huckerby, and what a laugh it was. Originating in India it is now world wide. Everyone interacted with one another and became a bee or a penguin!!! Evefyone was laughing at the end so it worked!!! 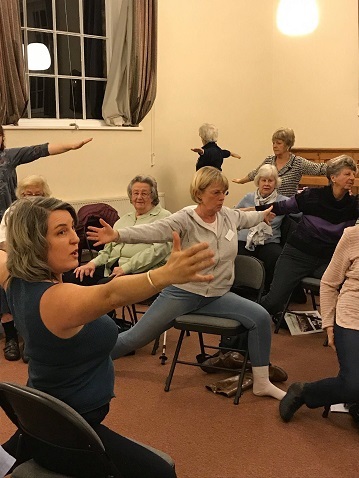 Chair Yoga with Louise Croome at Bakewell WI was a winner...thoroughly enjoyed by all, and a great turn out on a Winter's night. 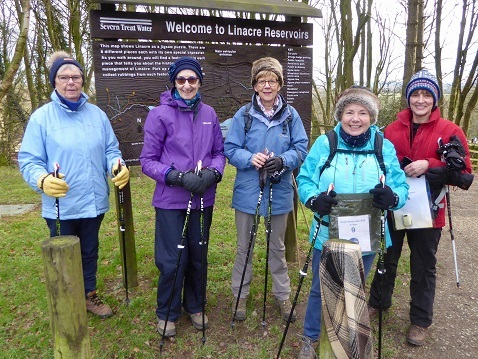 Four Baslow WI members and a friend met at Linacre Reservoirs to take up the challenge of the 'Virtual Runner Winter Walk'. They all achieved their goals and went home tired but happy! See @virtual_runners on Twitter. 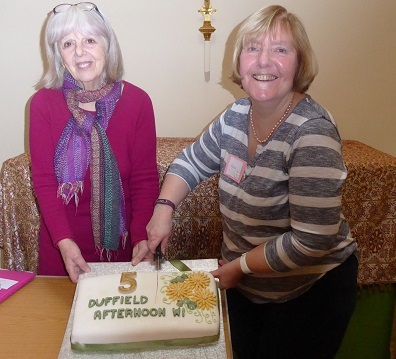 Duffield Afternoon WI celebrated their 5th Birthday with cake and prosecco! 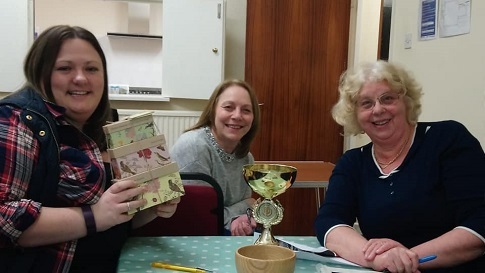 Congratulations to Sophie, Joyce and Pat of Tibshelf WI for winning their WI Big Quiz of the Year! 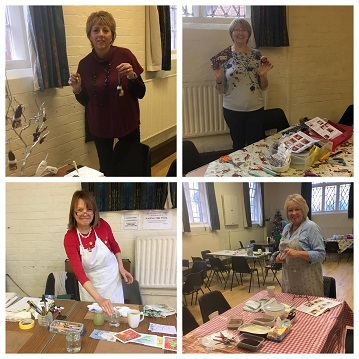 Members from Heanor WI found their first Crafty Ladies session of the new year very productive, with most ladies making four, or more cards. 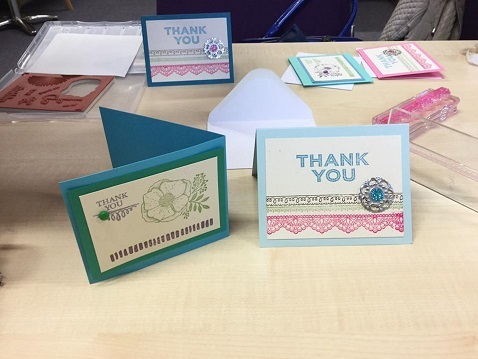 Very useful to send as thank you cards for their Christmas presents. 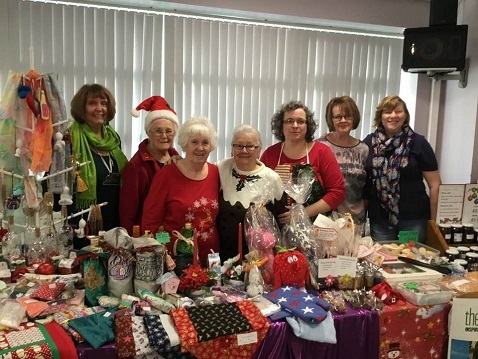 Over the last year Little Eaton WI members have raised a grand total of £1400 though social events, raffles and book stalls. 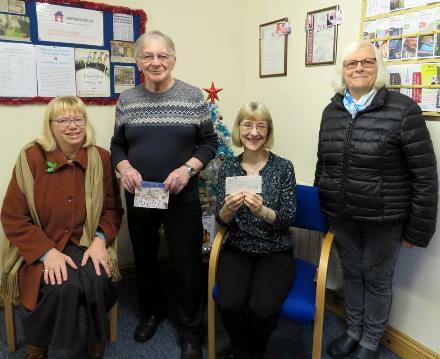 President, Sue Tulloch presented cheques to representatives from Little Eaton Playschool and The Village Pre-School Little Eaton for £700 each. Well done !!!! 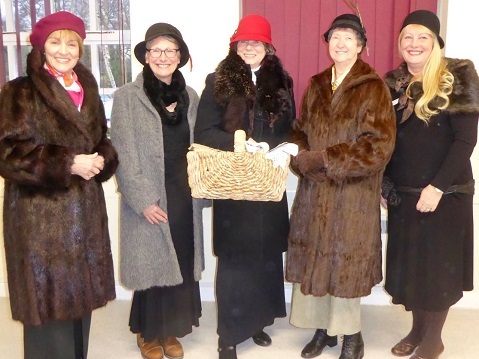 At the first meeting of their Centenary Year, five Baslow WI members acted out a sketch of how they imagined the meeting in January 1919 would have been. 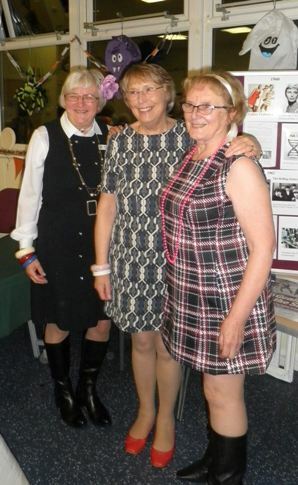 Great fun was had researching from the WI Record and Minute Books and dressing up too! 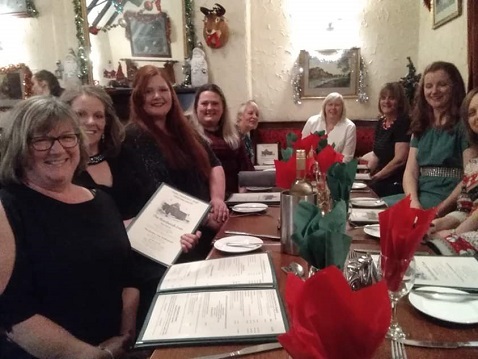 Pentrich WI Christmas dinner at the Dog Inn, Pentrich. Happy Christmas everyone, see you in the new year. 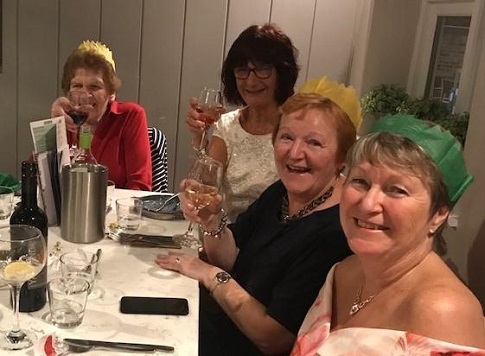 A lovely Christmas meal was enjoyed by members of Uffa Magna Mickleover WI at Mickleover Golf Club. Happy Christmas! 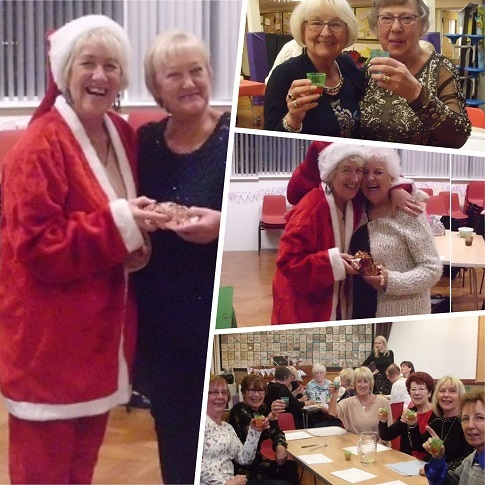 Members of Heanor WI spent a very enjoyable evening at their Christmas Party. 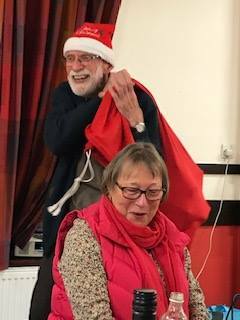 After the business, they played a fun game of Snowman Drive and then had a very tasty buffet, contributed to by all our members, rounding the evening off with carol singing, led by Sharon Howe, and a good time was had by all. 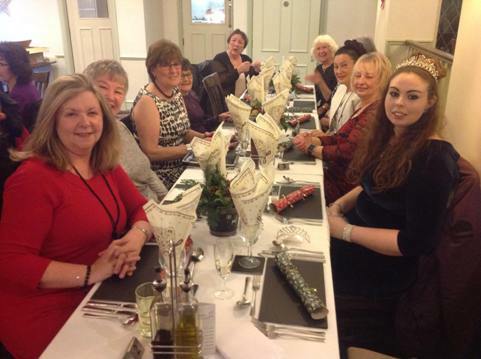 Willington WI members were in the Conservatory at The Dragon for their Christmas meal. A very good evening with excellent food. What a wonderful 'local', for coffee, cocktails, and special meals, plus they sponsor the WI in their work at the station. Happy Christmas to all. 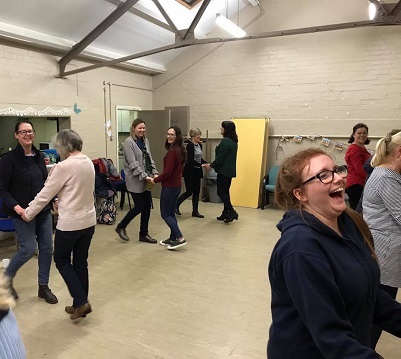 Breaston WI ladies like to have FUN! They like to do silly things, to try new ventures and they love to laugh. 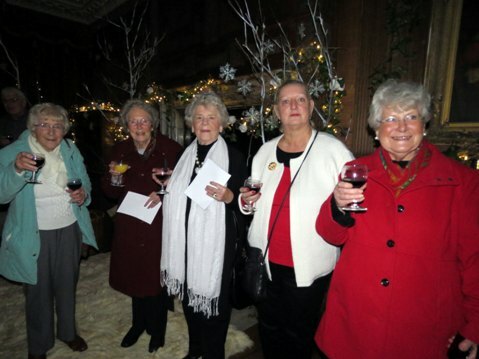 Mulled wine, cake and mince pies brought festive cheer to their action packed Christmas party. 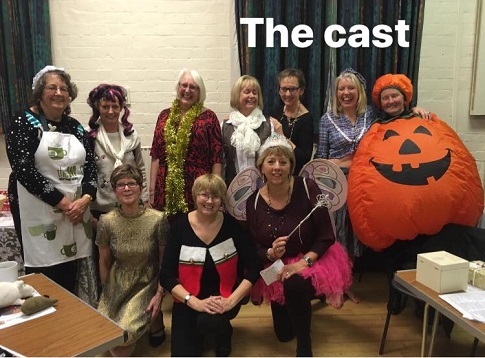 A scripted Cinderella play, performed by the committee with humorous ad-libbing was the order of the day , followed by a quiz testing our memory of advert slogans and products, followed by a Christmas sing song and the highly enjoyable 12 days of Christmas . 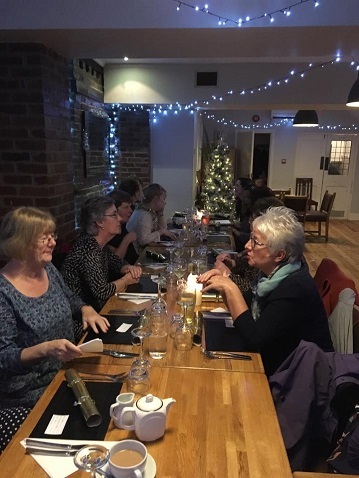 The tables were laid out with crackers and sparkles for Ashbourne WI Christmas party, where lots of chatter was accompanied by a buffet supper. 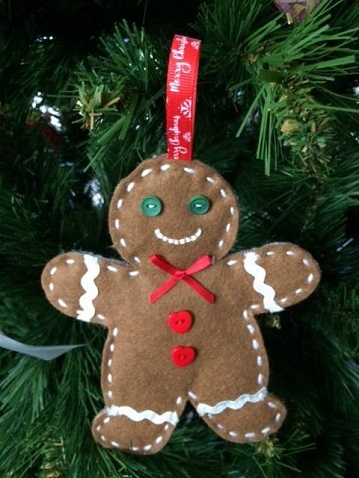 Afterwards everyone made gingerbread men to take home for their Christmas trees. A good time was had by all. 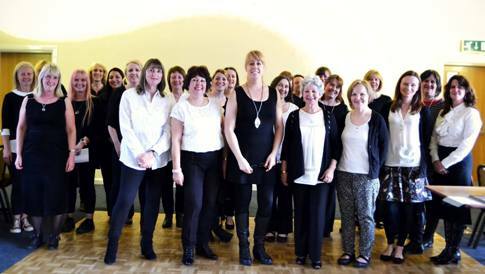 A lovely afternoon with Walton on Trent WI - didn’t they do well! 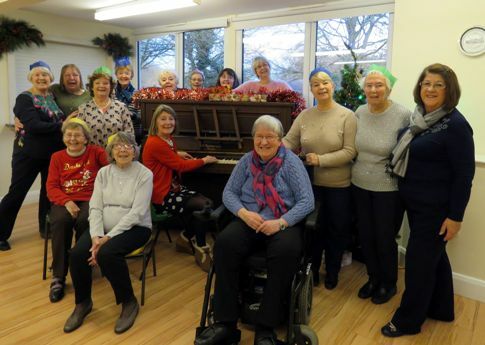 Christmas came early for Ashover WI when they were entertained by a group of ladies named Kelly’s Heroes from Woolley Moor. They sang various songs and members joined in the fun both singing and dancing along to the music. Refreshments of mulled wine and mince pies were served later. 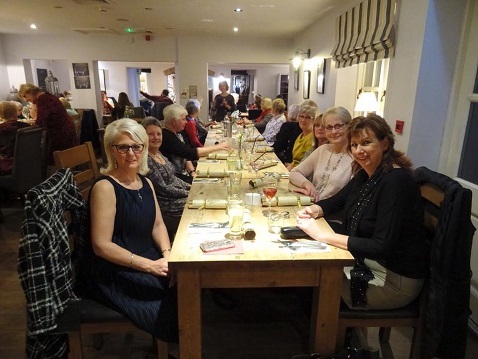 Baldock and Clothall WI had a brilliant evening at The George. The Christmas meal was great, the company was great and everyone enjoyed themselves. Many thanks to Nina for arranging such a successful evening. 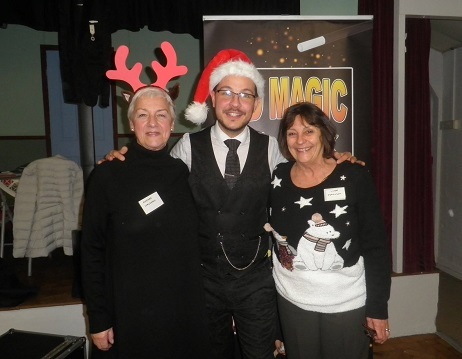 Wiilington WI had a touch of Christmas magic. Everyone agreed we had the best Christmas celebration meeting ever! 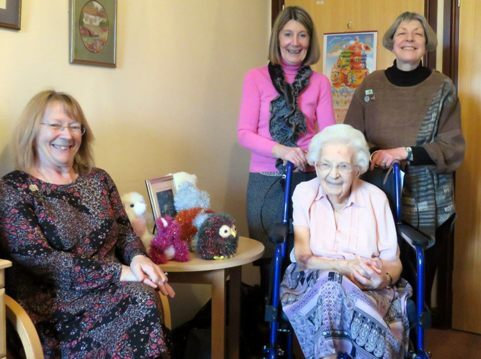 We'd invited ex-members as part of our 'kindness' initiative so it was lovely to share with them. Jack Dent not only performed some unbelievable magic, he gave us a bit of the history of magic and its different forms. 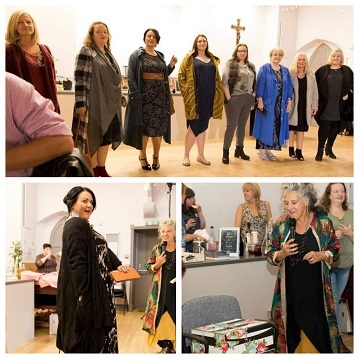 It was a fabulous show- and the bring and share supper with mulled wine was good too! Happy Christmas to all members and friends, past and present. 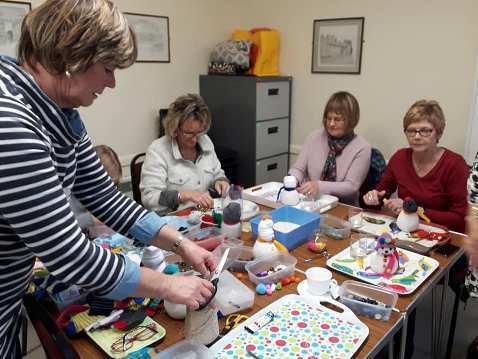 Baslow WI had a craft session and everyone who attended made a snowman! 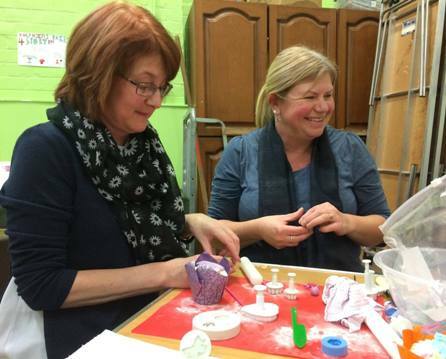 The craft session was led by our team members, Christine & Judith. 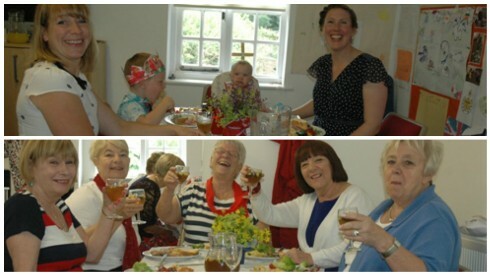 They celebrated the start of their Centenary Year with fizz and cake made by our former President Kate. There was a fabulous raffle with prints donated by Peak District Photographer, Andy Gill and raised £200 for Derbyshire Blood Bikes. Members were extremely generous with donations for the Elms Foundation. A great meeting. 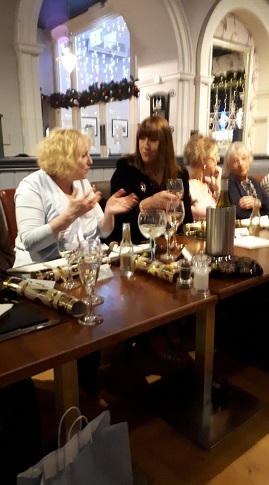 Pentrich WI Christmas party and final meeting of 2018, lots of laughter with Leisha and Ally from L&A Vocals, they got everyone singing. Hope WI had a lovely Christmas meeting. 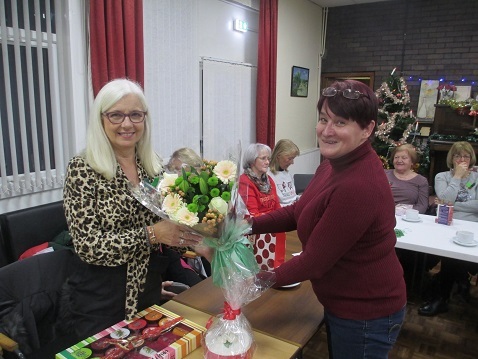 The new President, Sue, presented our outgoing President, Marcia, with a bouquet of flowers. 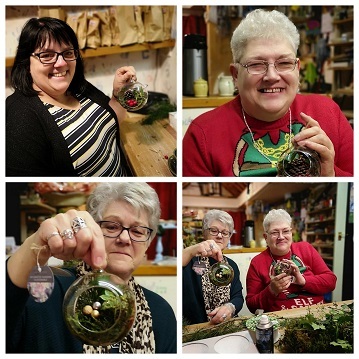 There was a craft class -with a demnstration of how to make a holly brooch, which was followed by opening the Secret Santa presents. Happy Christmas everyone! 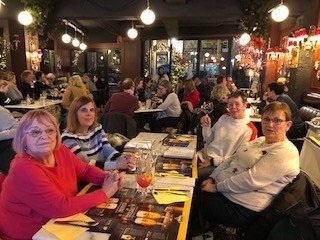 Baldock and Clothall WI hada great time in Gent, Brussels and Bruges visiting the Christmas markets!! Thanks so much to Debbie for organising. 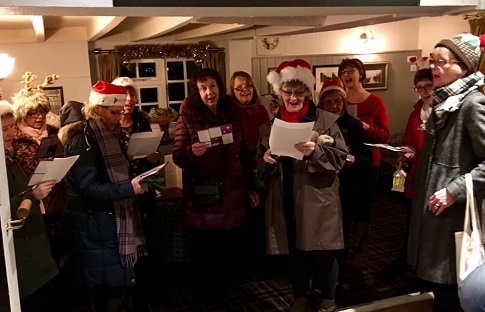 Breaston WI ladies were out carolling one evening in Decembr, visiting the Coop , the two care homes, then into the Navigation ending up at the Chequers. We were all in fine voice as we serenaded the people of Breaston and we collected over £80 for our charities. 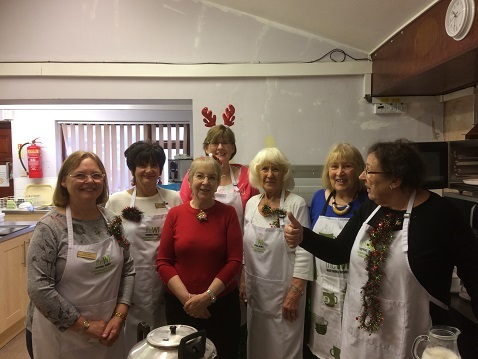 Briz Valley WI had a great Christmas meeting. 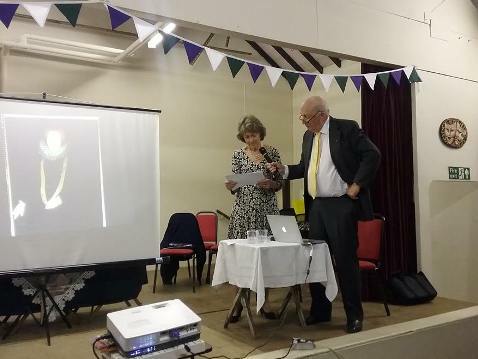 A presentation from Sam & Louise about their Denman Day. The photo competition was judged by the amount of pennies for friendship that was placed by each picture, the winning photo's will be made into a calendar for all to see in January. There was a visit from Santa who gave out the secret Santa presents, everyone said they had been good!! A lovely buffet that all contributed to, the table looked ( and tasted) amazing. Thanks to everyone for making it a great evening, and Happy Christmas to all. 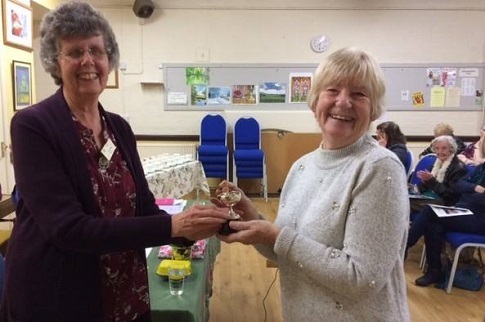 Old Brampton WI are so proud of one of our members, Gillian Gibson who recently attended the DFWI Awards evening where she was presented with the Dorothy Bonsall Art Trophy for the beautiful landscape she painted. Well done Gillian! 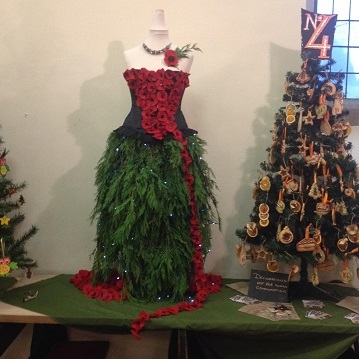 Baldock and Clothall WI had avery busy weekend displaying their Christmas Tree at St Mary's. The title of the entry was '100 years of progress, however, not there yet!'. 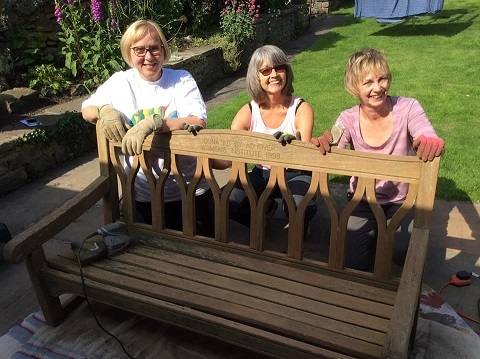 Thanks to Sue B for all her hard work putting it together and then dismantling it, Lucy for the donation of the branch and Celia and Jill for all their sewing. THURSFORD CHRISTMAS SPECTACULAR: Members of Baslow WI and friends travelled with London Tours to see the Christmas Spectacular at Thursford yesterday. What a great show! No photography allowed during the show, Google it for fabulous images! 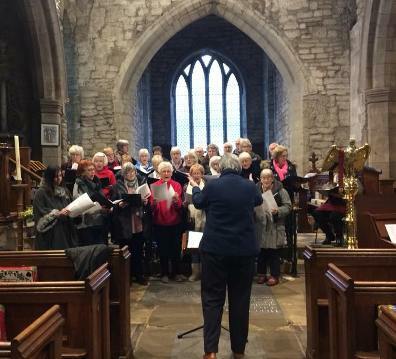 Barlow, Newbold and District WI say - Thank you Dronfield WI for hosting a varied Carol Service at St Swithin's Church, Dronfield followed by a Soup & Sweet Lunch on a cold & frosty morning. 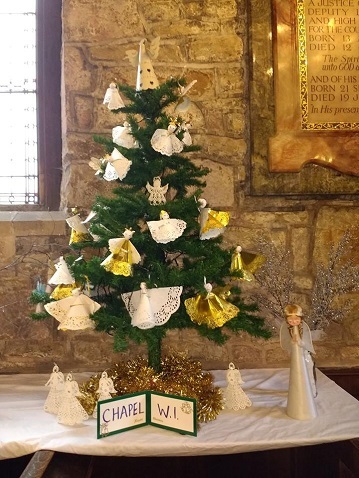 The Chapel-en-le-Frith WI Tree of Angels exhibited in the Festival of Christmas Angels at St Thomas Becket Church. 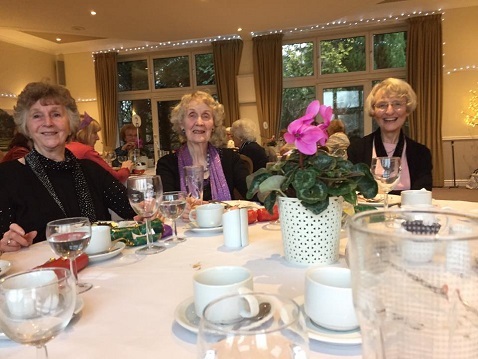 28 members of Ravensdale WI Social Group enjoyed their Christmas lunch at Mickleover Golf Club. 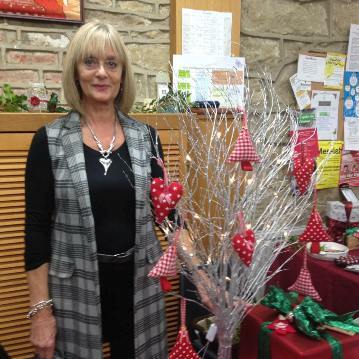 Helping to serve coffee, tea, mince pies and mulled wine at Bamford WI Christmas Fair today. Love the tartan pinnies! 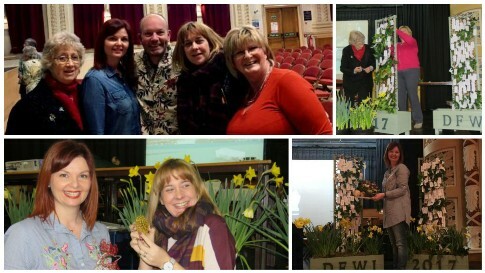 Breaston WI What a brilliant Dabble Day! 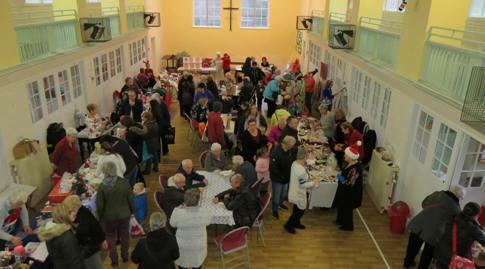 Lots of crafts, lovely refreshments and a room full of busy, smiling people. Here are some pictures taken just before everyone arrived ! 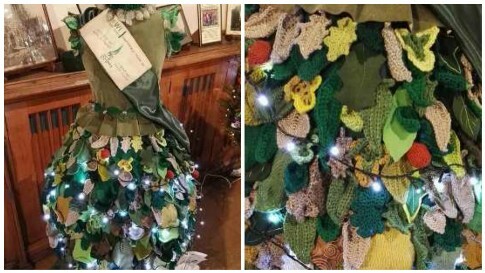 Barlborough & Clowne WI’s Christmas Tree at Barlborough St James Church Grand Christmas Tree Festival. Viewing 24-25 Nov, 1-2 Dec and 8-9 Dec open 11am- 5pm Refreshments available all day. 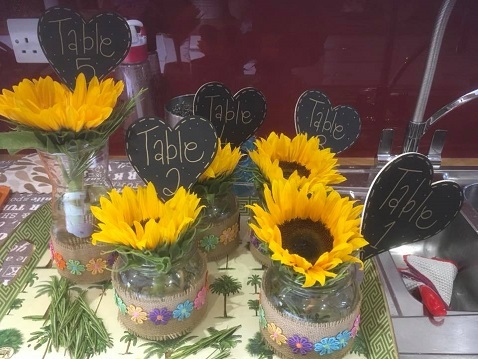 The November 2018 Eats and Treats event was held in Creswell. 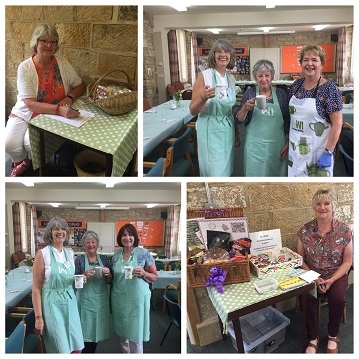 Once again ladies from Barlborough and Clowne WI supported the event by baking cakes, making tote bags and most importantly serving the refreshments during the morning. 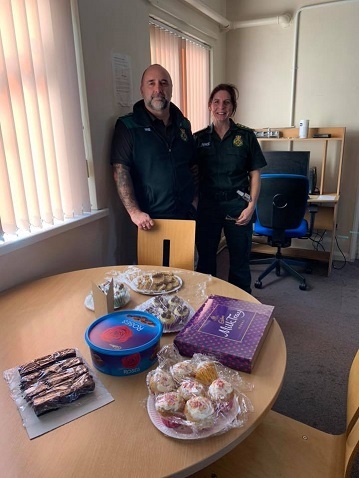 Uffa Magna - Mickleover WI -To mark World Kindness Day, the President and several members of the committee visited Mickleover Ambulance Station to deliver cakes and chocolates to show appreciation of all the hard work they do for the community. 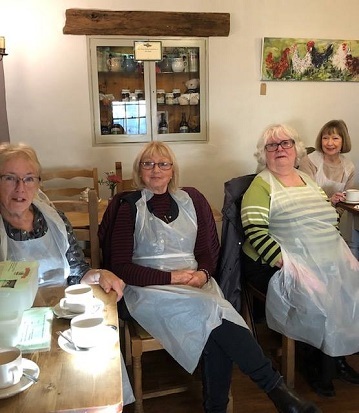 Littleover WI Coffee Morning November 2018 Everyone seems to be having a great time! 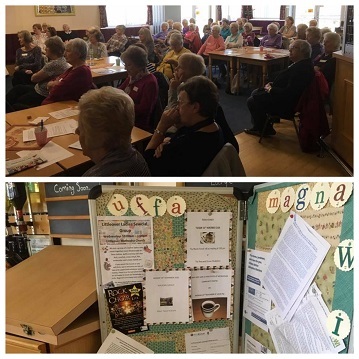 Uffa Magna - Mickleover WI welcomed 60 members and 5 visitors to their morning meeting - a brilliant turnout! Gay Evans gave a very interesting talk - The Last English Nobleman to be Hanged for Murder! Members were also given a brief report of the DFWI’s Federation Autumn meeting held on 20th October. 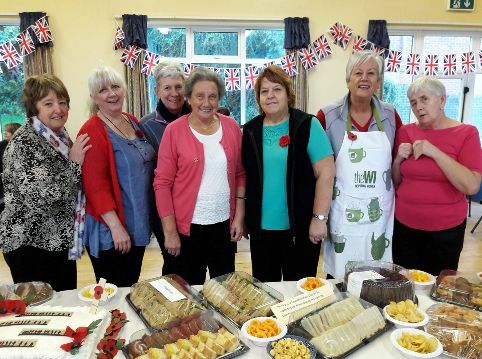 Baslow WI were active today helping at the Community Armistice Centenary Celebration in Baslow Village Hall. 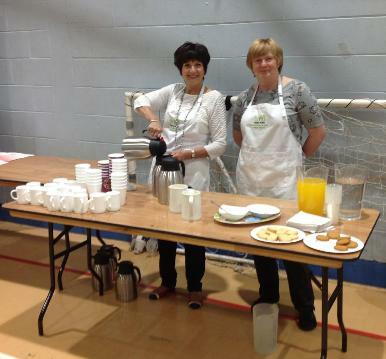 They were responsible for setting up the hall, providing and serving tea. 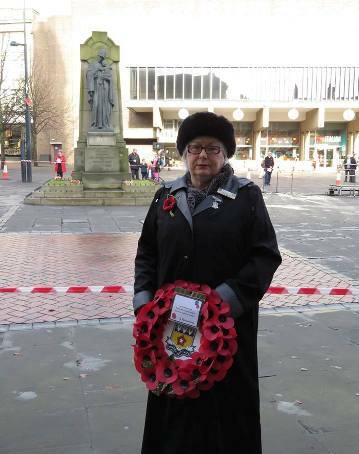 Chairman Chrissie Booth laid a wreath at the cenotaph in Derby on behalf of DFWI. FABULOUS! 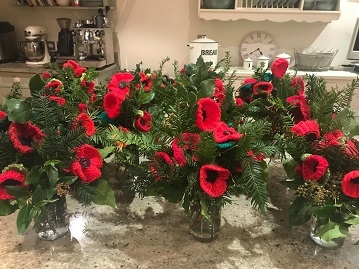 - 100 poppies in jam jars for table decorations at the Armistice Day celebration in Baslow Village Hall. 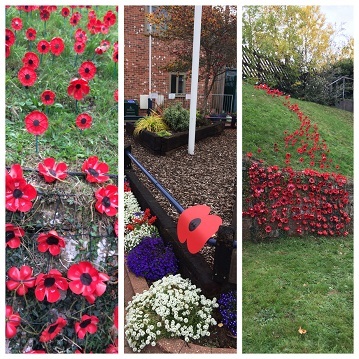 These poppies have been knitted by WI members and friends in our community and arranged by Iris a member of Baslow WI and Baslow Flower Circle. 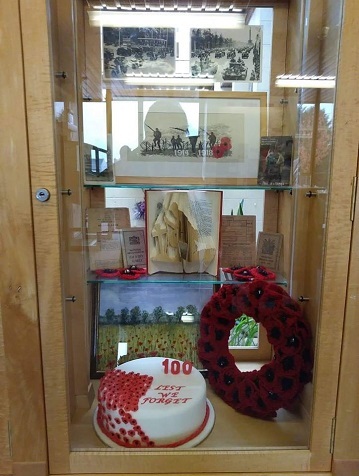 Alfreton WI's display in Alfreton Library, call in and see. The fence rail outside the library has also been poppy bombed by the WI. 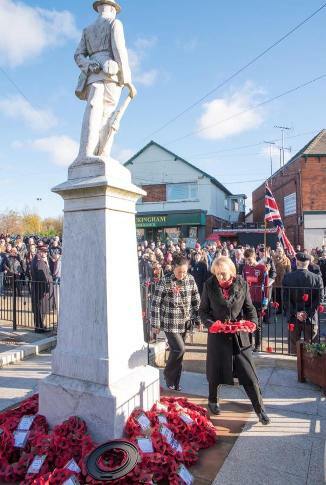 Willington WI Remebrance. Three members either work or volunteer at the RSPCA so heard about the purple poppy being in remembrance of the animals killed in war- horses, dogs and pigeons being amongst them. 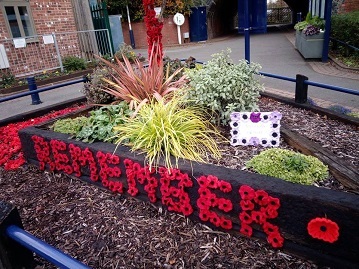 Their display is now complete with a plaque of knitted purple poppies. 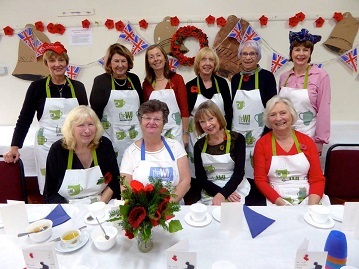 Alfreton WI World War 1 celebrations. What a lovely idea! 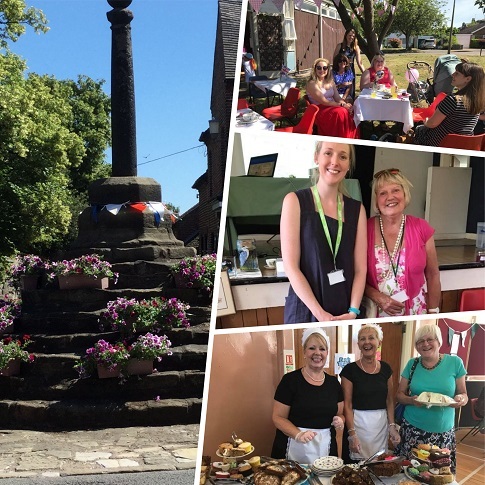 Barlborough and Clowne WI in the community holding a Coffee Morning in Barlborough supporting the Five ways to Wellbeing project being promoted by our local council. 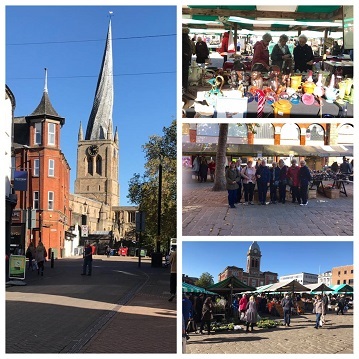 Nine members of Chaddesden WI enjoyed a good day out using their gold cards to visit Chesterfield market. 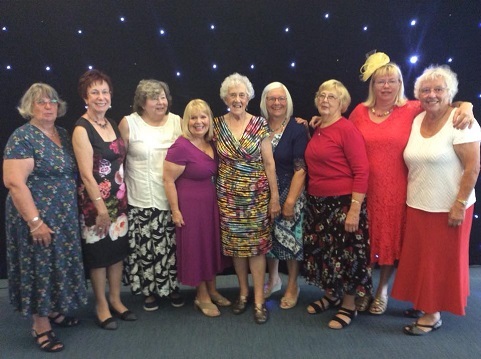 Heanor WI celebrated its 10th Anniversary at Morley Hayes. Good food and spooky entertainment afterwards by Ann Featherstone as it’s nearly Halloween made for an enjoyable evening. 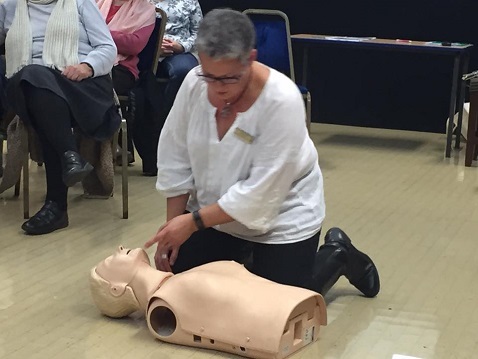 CPR training for Barlborough and Clowne WI members this evening given by members of the St Johns Ambulance. An opportunity to ask questions and test the procedure. 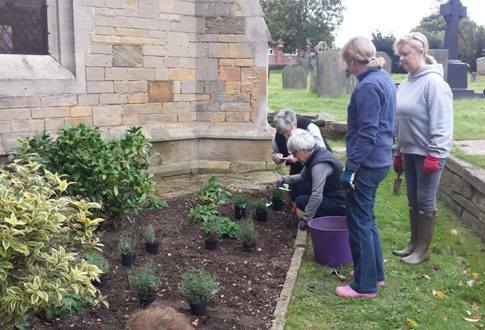 Shardlow WI - Construction commencing at the Cenotaph after many many busy weeks making poppies- a couple more sessions to finish off hopefully when it isn’t raining !! A true group effort! 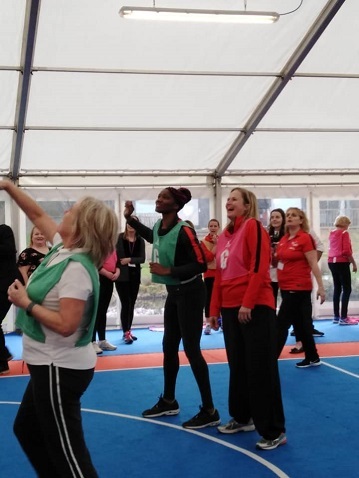 A good afternoon playing Walking Netball in the first ever East Midlands Festival. 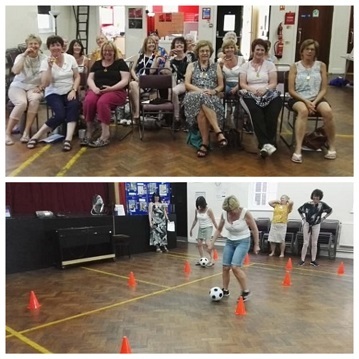 Our local group initially, set up by Barlborough and Clowne WI, includes players from Bolsover WI and several other ladies from local communities, (helped out today by players from Long Eaton) played against teams from Queens Park, Derby and Southwell. Queens Park were the overall, well deserved winners. 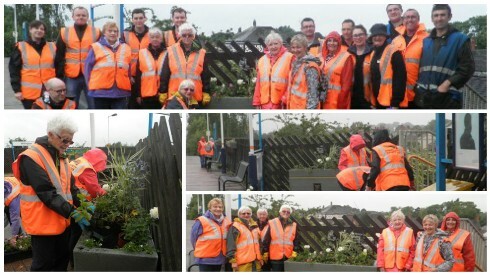 Well done to Willington WI - The area around the railway station looks absolutely stunning. Congratulations to everyone who has had a hand in making such a lovely display. Barlow Newbold and District WI had an interesting evening listening to Elizabeth Holloway on her five & a half years Narrowboat Life. 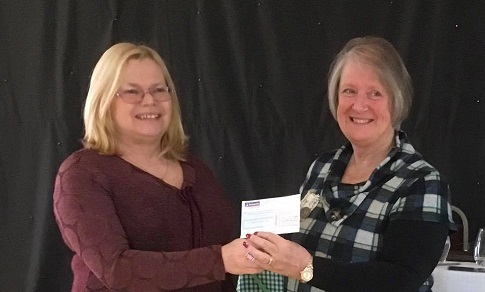 Following their Charity Spring Bonanza in March a cheque for £200 was finally presented to Jan Alcock representing the Chesterfield Branch of The Compassionate Friends; offering support & friendship to parents & families following the death of a child of any age. Their support will offer help to those who unfortunately suffer such a loss. 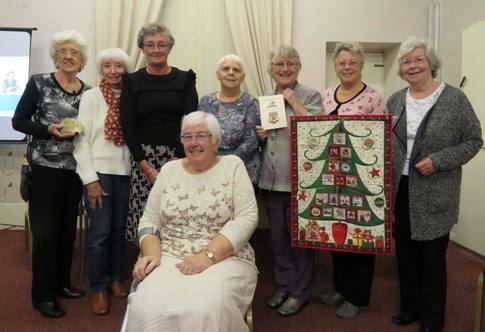 A project that Killamarsh WI members participated in this year, knitting squares, which were crocheted together by the talented Lisa Green and embroidered. The blankets will be donatd to local care homes for their residents to use, a worthwhile project. 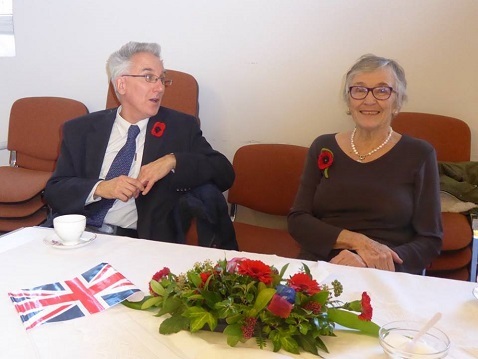 The speaker at October's Briz Valley WI meeting was Mr Ken Knowles & his Consort Marilyn. Ken is Lichfield's Town Cryer and Sword Bearer. He gave a brief history of himself and of his job as Lichfield City Council Town Cryer. 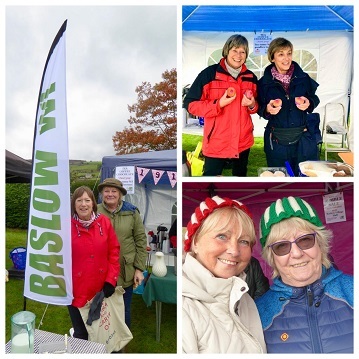 Baslow WI had a lovely day at the Baslow Community Orchard celebrating Apple Day. They raised funds for the Orchard Group and also Derbyshire Blood Bikes. 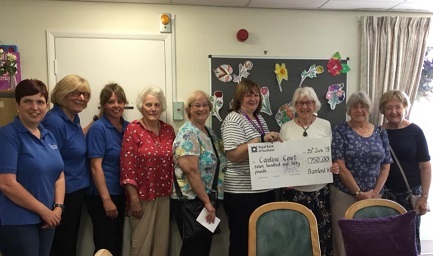 Heanor WI had a bursary from their Group to spend on something educational. 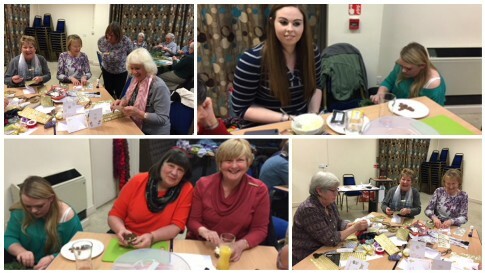 To make sure all members could benefit, they held a bumper craft day at Heanor Baptist Church today. 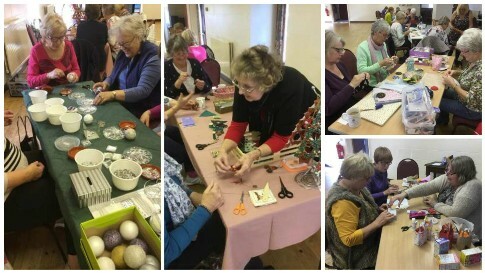 Some members were unable to attend, but there was still a very good turnout for all the crafts. Thank you to the ladies leading the crafts, which were, respectively, Folk Art and Papercraft, Chicken Scratch Embroidery, Sugar Craft and Rag Rugging. 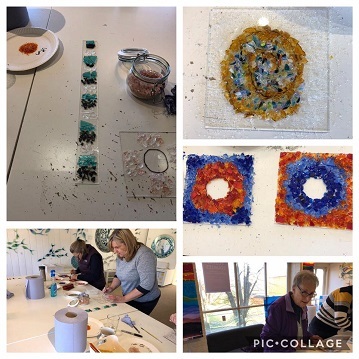 Everyone learned a lot about the crafts and had a very enjoyable time while learning. 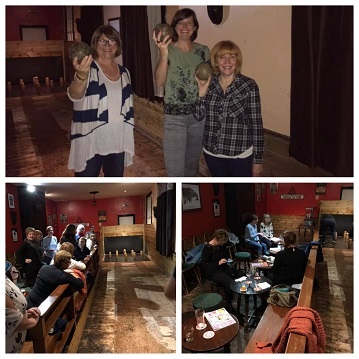 Burton Belles had a fun night at the Burton Bridge playing skittles and enjoyed chatting in between throws. The winning team took away prizes!!! Willington WI -busy within the village this week. 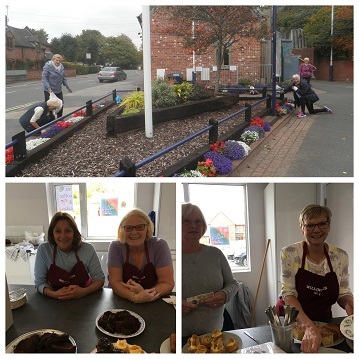 Cakes were made and sold at the Arts Festival and the station team met to do a 'group tidy'- followed by coffee and planning for winter. 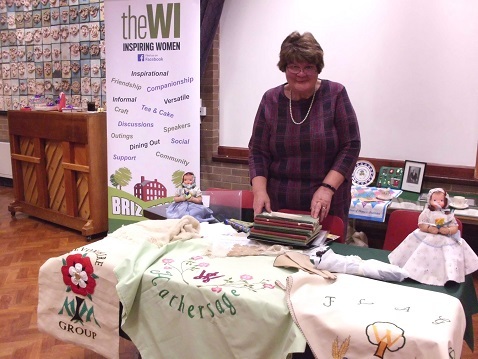 Chaddesden WI meeting - Pat Hall entertained with sketches, jokes and anecdotes. 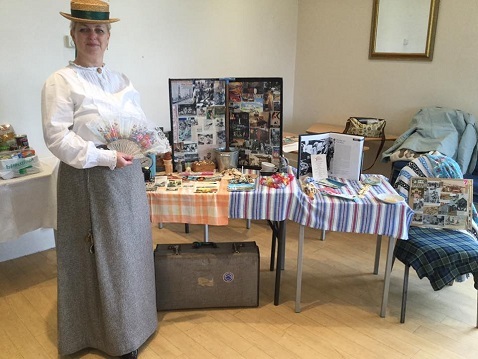 With the theme of the first World War and the WI, she became different characters. An upper class lady, a Land Army girl, a bossy lady and a worn down wife with many children. Chrissie Booth spoke about the day she went to Harry and Megan's wedding. 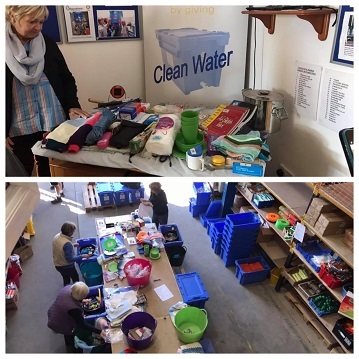 Members of Pentrich WI spent an interesting morning at the very busy Aquabox packing shed near Wirksworth. They were about to load 250 boxes for shipping to the Philippines, providing clean drinking water for people in disaster zones. 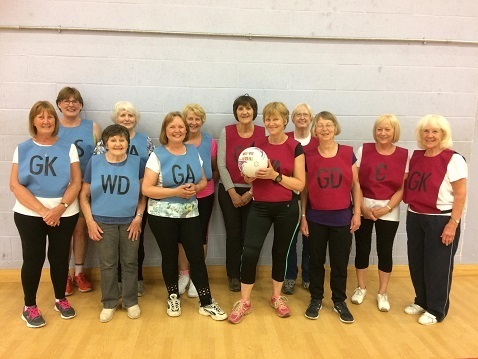 Baslow WI members enjoying several different activities for WI Sports Week, including cycling,walking netball, gym sessions and tennis. 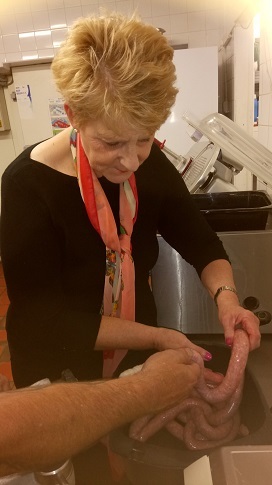 A member of Repton WI gets to grip with making sausages at The Greedy Pig's Sausage and Pie making Workshop. The pies sound very tempting! 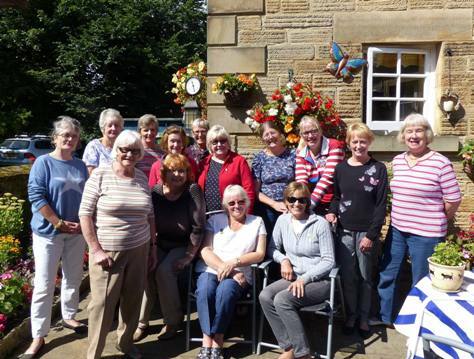 Members of Chaddesden WI made a return visit to Doveside WI - over the border in Staffordshire. Always good to visit other WIs and exchange ideas. 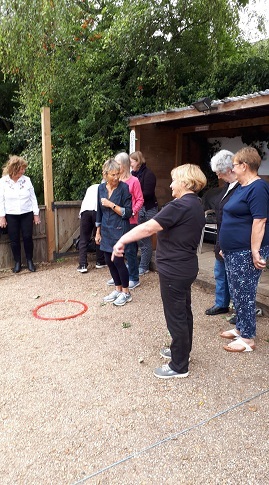 Baldock and Clothall WI - for Sports Week, an afternoon's petanque down the Orange Tree, after a very good lunch. Members had excellent coaching from Brian, Jill and Danny and all had a brilliant time. Everyone enjoyed it so much they are thinking about starting a petanque team. 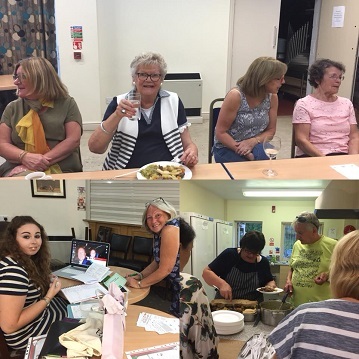 Members all had a great week, enjoyed different activities and managed to come up with a few activities that appealed to members and some are likely to continue. Baslow WI - WI Sports Week: Two 'Baslow Warriors' warming up with a little yoga. 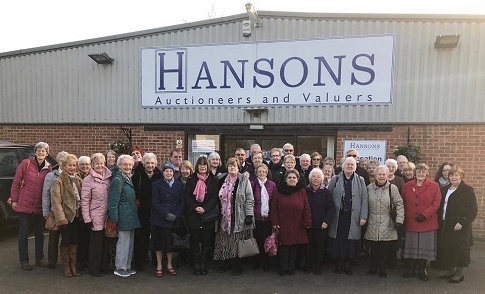 Breaston Belles on another great WI adventure- this time to Hanson’s auction rooms. 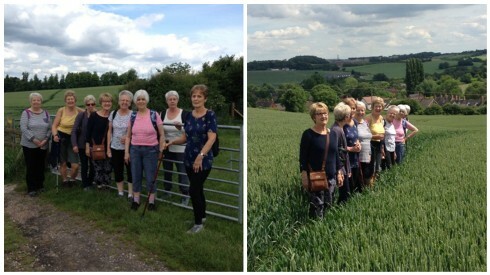 Baldock and Clothall WI As part of Sports Week six members walked the Greenway from Baldock to Stotfold, visited the Nature Reserve and went to Stotfold Watermill for a tour and lunch. 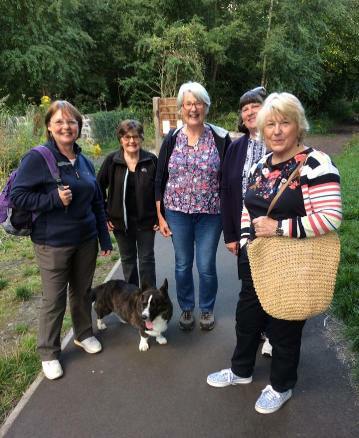 Ravensdale WI Rambling group enjoyed a lovely walk from Findern Marina to Willington and back. A new Piazza building and bridge have been built at the Marina. 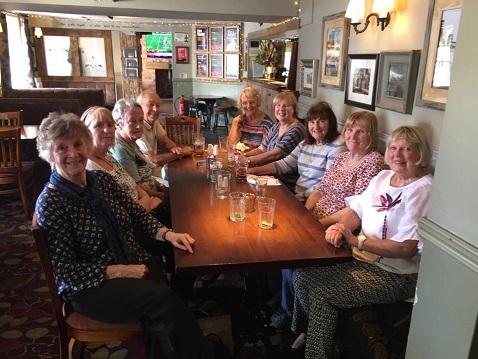 A warm day for the walk meant everyone was ready for a cool drink and lunch at the ‘Green Man’ in Willington. 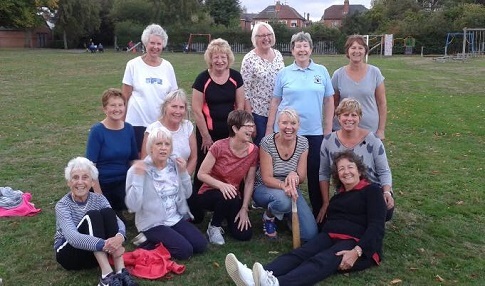 Breaston WI Sports Week- a game of rounders on Breaston Park. NB. 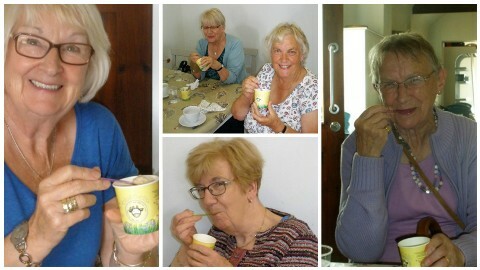 Some of these ladies had also been to an exercise class in the afternoon too ! Didn’t they do well ? 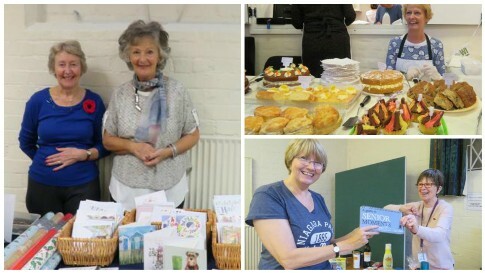 Thanks to Barlborough & Clowne WI ladies once again for supporting the Eats & Treats event. A very busy morning. Thanks to Anne and Josanne for baking the gorgeous cakes. And thanks to Viv and Josanne who helped make the tote bags. 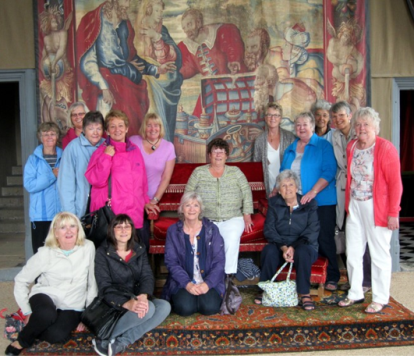 Baldock and Clothall WI members had a day trip to Denman. A cookery demonstration, lunch, a tour of the college and grounds and afternoon tea before returning home. A great day out! 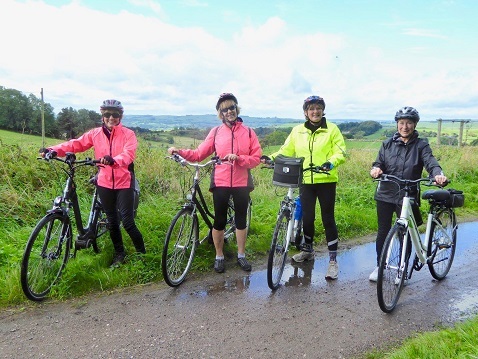 WI SPORTS WEEK - Baslow Bikers: This days cycle was not as easy going for the Bikers as usual!! 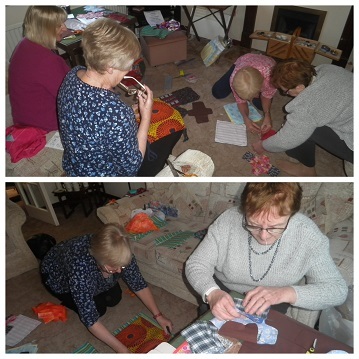 South Normanton WI Volunteers have been busy making hand made up cycled tote bags for the up coming Eats and Treats event on Tuesday 18th September 2018 at Shirebrook Leisure Centre! 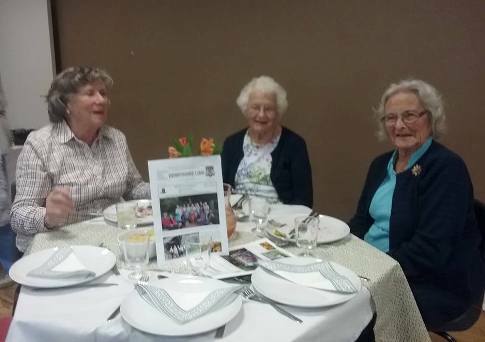 At the Risley WI September Harvest Supper the members celebrated Judy's 90th birthday. A very special lady. 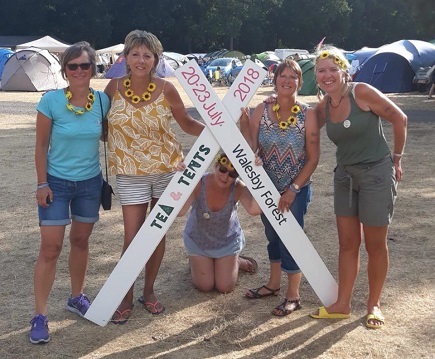 Willington WI had a busy meeting! Chatsworth, the Canine Partners puppy they met earlier in the year came back to give them an update on progress- well his handler did! 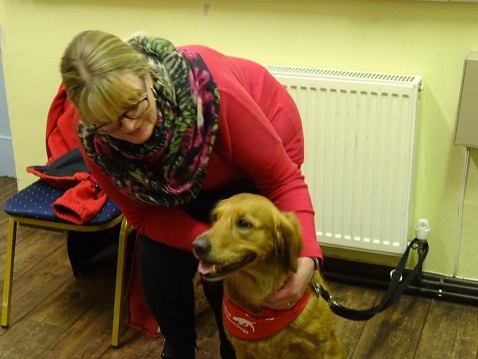 Baslow WI had a talk from David Brocklehurst, who took along Alice, his pet dog and a promoter for Medical Detection Dogs. 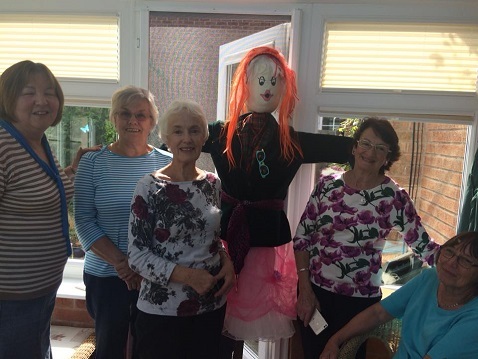 Duffield Cumberhills WI with their scarecrow for the 2018 trail in Duffield. She is Vivienne Westwood our Derbyshire designer hero. There are 70+ scarecrows this year. 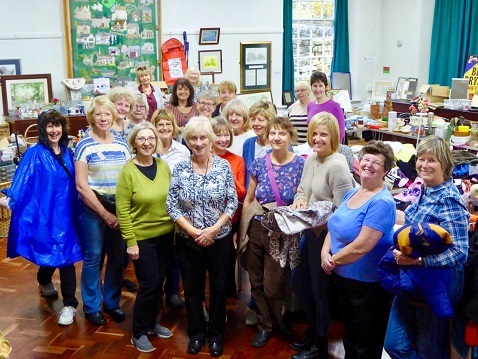 Uffa Magna - Mickleover WI at their September meeting - pleased to see so many members again after the summer break. 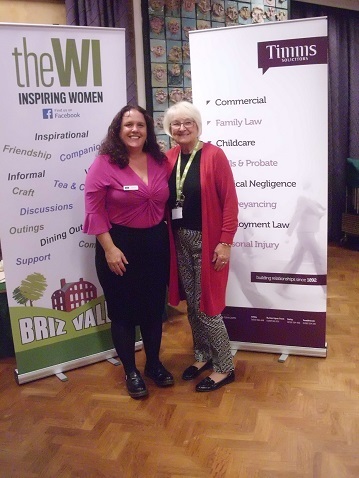 Briz Valley WI had a talk by Jo Robinson FCILEx Head of Wills and Probate at Timms solicitors. Jo gave the in's and outs of will making and how important it is to have one, if not for yourself but for everyone left behind as there are many pitfalls. And also some guidance on Power of Attorney, which is also something very important to do. There were lots of questions which Jo hopefully helped with the answers. Jo highlighted what could go very wrong without both of the above. 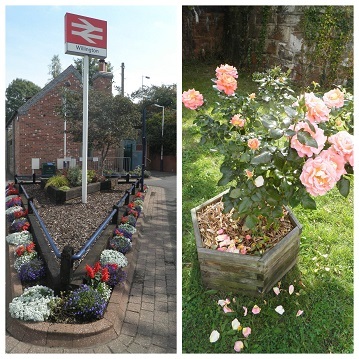 Willington WI Centenary rose in the station garden is in full bloom and the triangle looks stunning in its red, white and blue. 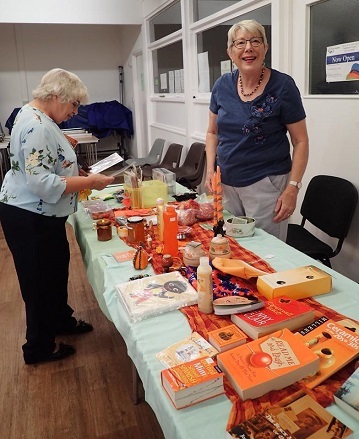 Chaddesden WI had an orange theme for their September sales table. Something different! 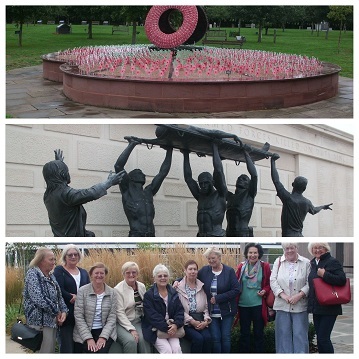 Some of the members from Briz Valley WI visited The National Memorial Arboretum at Alrewas. Pie and peas and a natter. 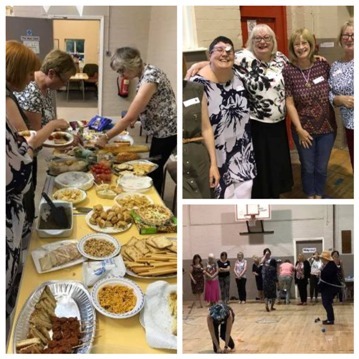 The annual August meeting for members and friends of Barlborough and Clowne WI started with a walk around Clowne followed by supper in the Community Centre. 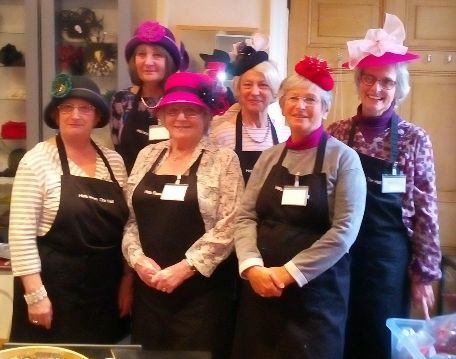 This was a lovely tea party attended by 11 of us from our WI. Burton Belles WI Two of the Belles ( Sue and Sandra) had the tough job judging the produce show at Mona Road allotments. We hear they had to taste some things several times just to make sure! 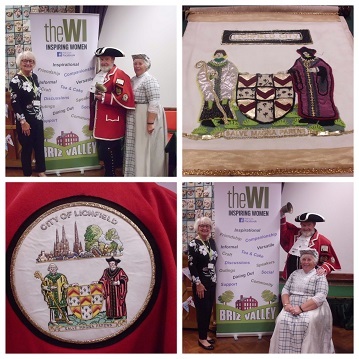 Chaddesden WI photos from the successful Hopwell group Celebration of the DFWI Centenary at Risley today. Thank you to everyone who made it such a great day. Calver and District WI August members meeting started with Barbara Dakin - Storyteller. Her stories were really interesting and everyone thoroughly enjoyed the evening. 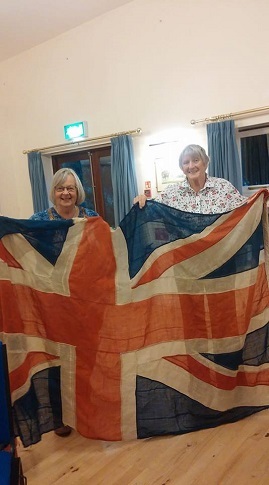 The picture shows the Union flag which was made in 1918 by the nurses at Glasgow Royal Infirmary. Hayfield and District WI August meeting was a Mystery Tour visiting, once again parts of the Peak District many had not seen before. 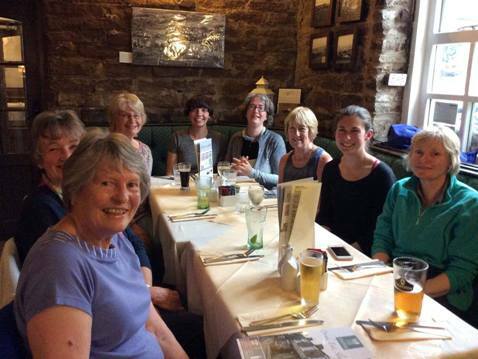 This was followed by a delightful supper in Tideswell at H&D who opened specially for the event. 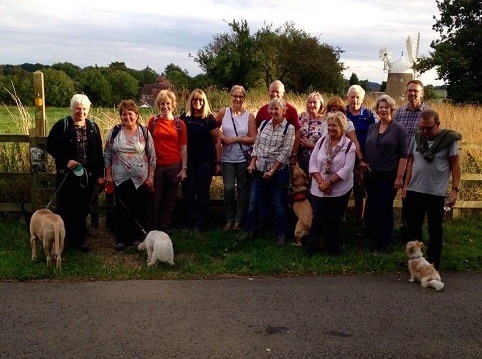 Pentrich WI members and friends enjoyed a lovely summers evening walk from Buckland Hollow up to Heage Windmill. 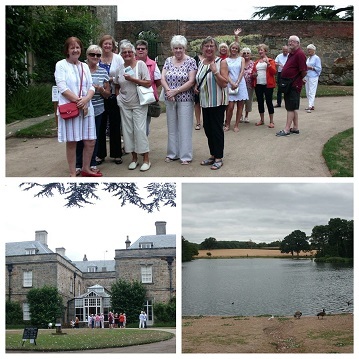 Members from Briz Valley WI (and a couple of husbands) had a guided tour of Melbourne Hall. It was a very informative tour, a lot of history and and a few family names to remember Thomas Coke, Cowper, Lamb and the present Lord Melbourne Ralph Kerr to name just a few. A lovely house so lived in, lovely paintings, furniture, glass and great to see family photographs in every room. Thank you to our guides for making it a great afternoon. Then on to Melbourne Community Hall where the ladies of the WI served afternoon tea. It was a lovely spread. 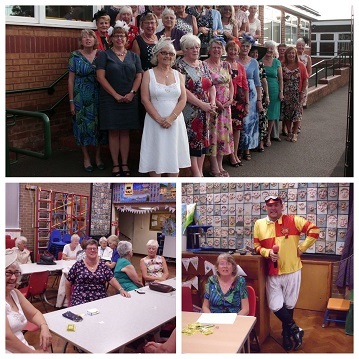 Briz Valley WI ladies enjoyed a night at the races with a fish and chip supper which everyone agreed was a great success. As everyone dressed up a group photograph was taken. Don't they all look fabulous!!! 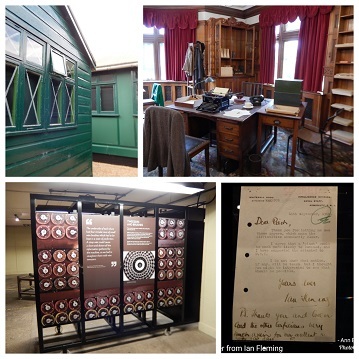 Barlborough and Clowne WI members went on a long awaited outing with friends and partners to Bletchley Park. What an amazing place this is. Well worth a visit to learn how the secrets of the Second World War unfolded and to understand the dedication and commitment of all who worked here it total secrecy. 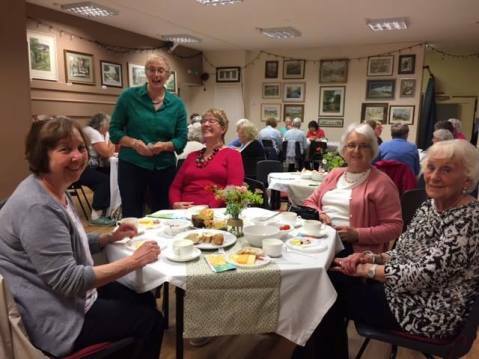 For their August meeting Shardlow WI sampled their own ‘Tea and Tours’. 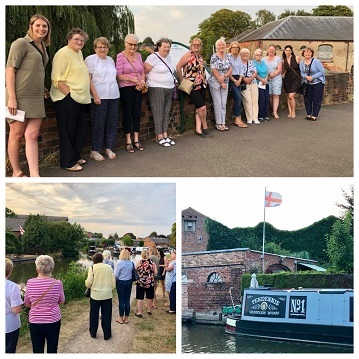 Members Alicia and Val J gave a guided tour of the amazing historical wharf, followed by a delicious fuddle in the village hall, complete with stunning sunset over the playing fields! 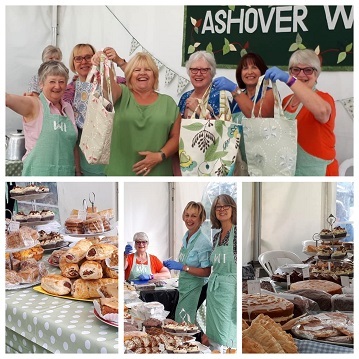 Ashover WI at AshoverShow. 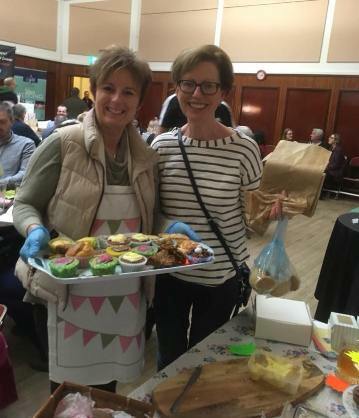 Seen here are members of the 'early bird' team plus some of our homemade cakes and savouries, which literally sold like hot cakes. Drink donations will go towards the continued Bassett Rooms refurbishment - our village meeting venue. This year there were beautiful home sewn bags for sale as well as jams and fudge. Big thank you to all our ladies, who as usual pulled out all the stops and made such a huge contribution and to those who bought produce and made a donation. Always a fabulous day for members and visitors alike. 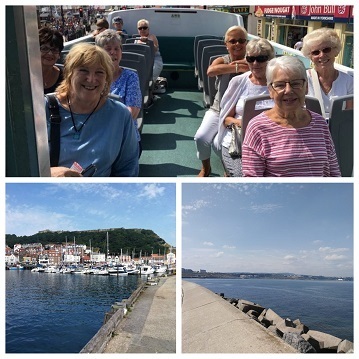 Hilton and Marston WI ladies and their friends/partners had a lovely trip to Scarborough! The weather was perfect and a staycation is the perfect way to enjoy it! Many beautiful views, paddles in the sea, fish and chips and even a cheeky drink were enjoyed! 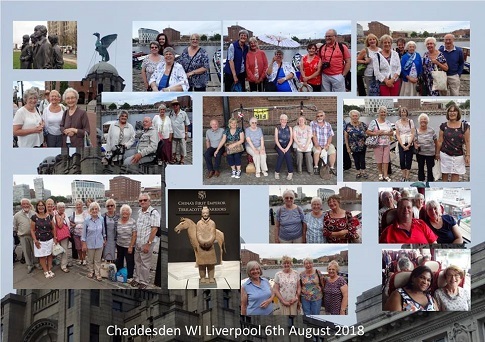 47 Chaddesden WI members, partners and friends, the Terracotta Warriors, The Beatles, the famous Liver Building and The Albert Dock - all made for a great day out in Liverpool. 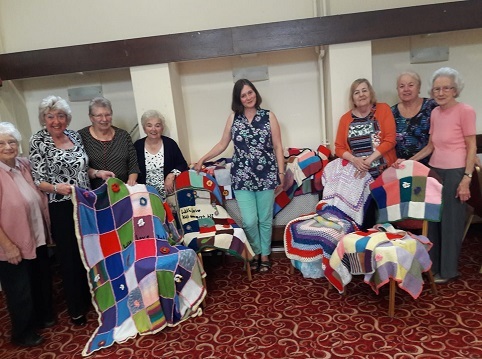 Duffield Afternoon WI members have been knitting squares to be made into blankets.This means that now every primary and secondary bed in Kabale (a town in Uganda) now has a blanket. 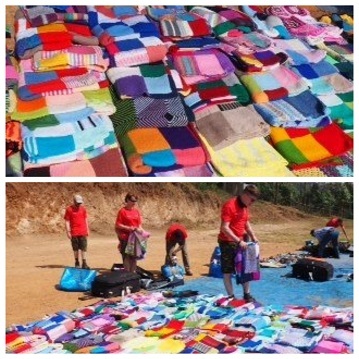 Thanks to their incredible work over the last four years there were also sufficient blankets to start equipping beds at the Equator School in the town. 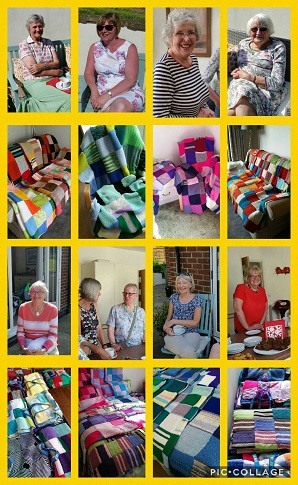 Here are photos of the blankets on display so hopefully you can spot your squares or blankets. 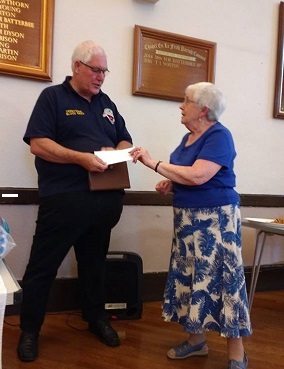 Chapel-en-le-Frith WI On 9 May 2018 Margaret Bywater of Chapel en le Frith WI presented Dave Harvey of Derbyshire Blood Bikes (pictured) with a donation of £110. 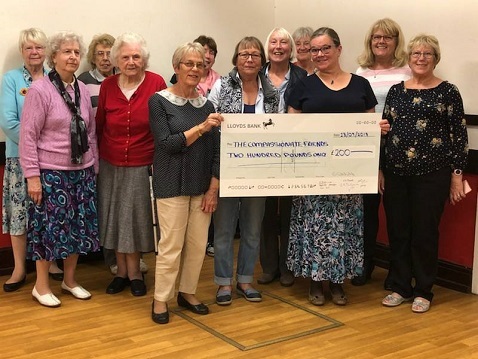 The WI received the funds in appreciation of the work that the ladies of Chapel WI perform for the Four Inns Walk and donated this to their Charity of the Year. 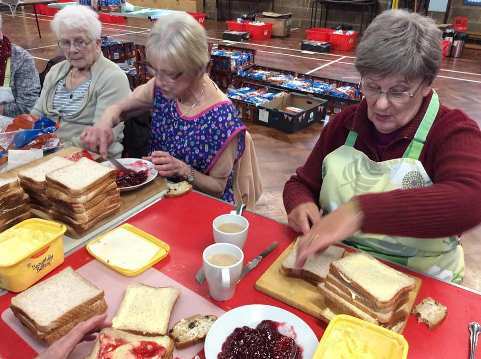 The work consists of making 100 loaves in to sandwiches and serving these and other food and drink from the Chapel Scout Hut on the day of the walk. 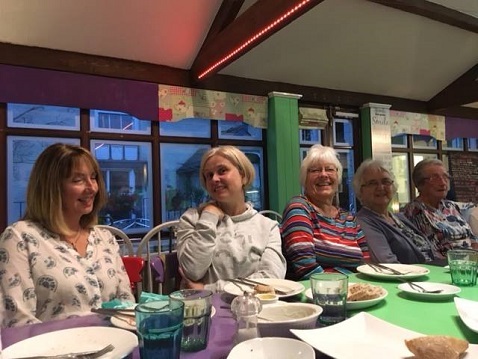 Ravensdale WI committee and regular helpers treated themselves to a meal at Nonno’s in Belper. Unfortunately our President and Treasurer had prior commitments,so were unable to attend.An excuse to go back again! 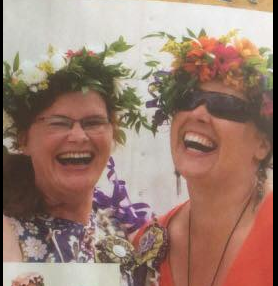 The editor couldn't resist this photo! 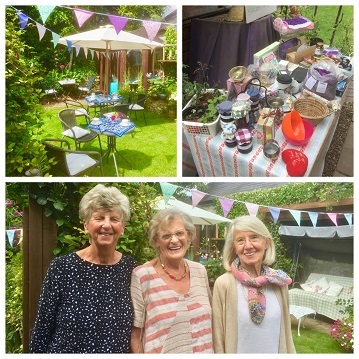 Baslow WI members supporting Chatsworth WI fundraising event - "Coffee in the Garden" Lovely to meet new and old friends and enjoy the sunshine and gorgeous nibbles with coffee. 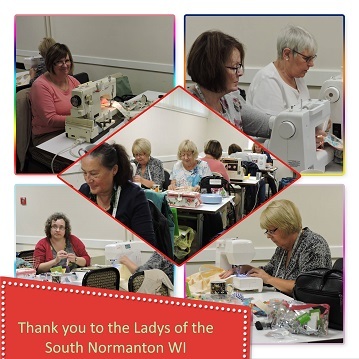 Thanks and good luck to Chatsworth WI. 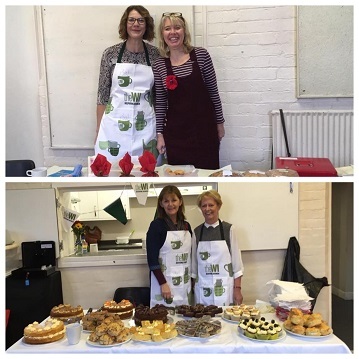 Bakewell WI Annual Tea Party - Lashings of cake made by the committee! 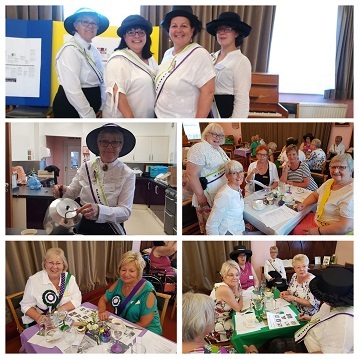 Ockbrook and Borrowash WI members attended this event on Friday 7th July a Derby University. 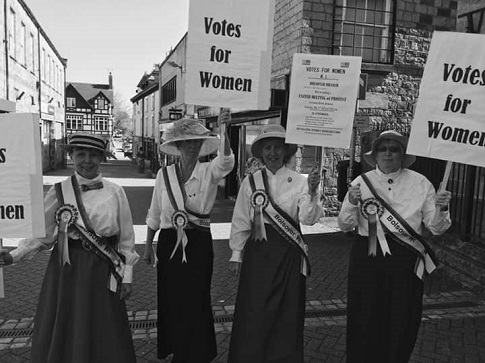 They tried to dress in the Suffragette colours of mauve, green and white and baked some cakes!! The event was chaired by our local MP, Pauline Latham and we had some inspiring women speakers including Professor Judith Lambert from the University of Derby, Jasvinder Sanghera from an award winning human rights charity, Anna Ince from Resonate a company specialising in rail and connected transport, Jacci Woodcock from the Dying to Work campaign and Georgia Vicars from Fluid Design who spoke about needing more women in technology. 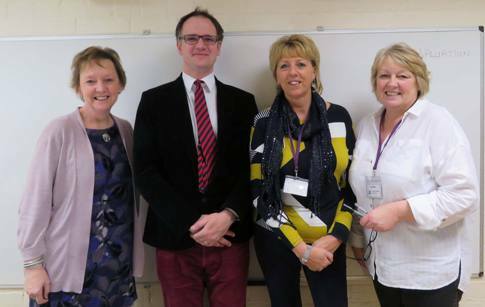 Members reported that it was a brilliant morning, thought provoking and interesting. They received a letter from Pauline Latham thanking them for their attendance after the event. 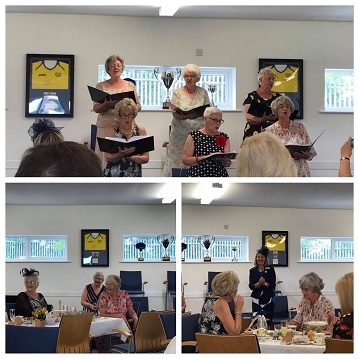 Pentrich WI celebrated the DFWI Centenary with Codnor WI at a Sparkling Afternoon Tea with entertainment by their own ladies, the Codnor Warblers. 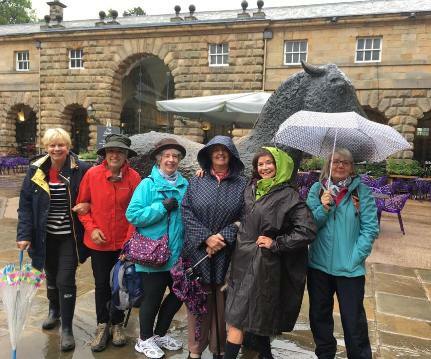 Ladies from Chapel en le Frith WI took the Bakewell Tasting Tour in July with guide Sally Mosley who showed them some interesting places in Bakewell and fascinated them with her local knowledge of the history of the town. Setting off from the Agricultural Business Centre and finishing at the Wee Dram they tasted some great local produce along the way: cheeses, pork pie, sausages, bakewell pudding, handmade chocolates and ending with a wee dram of Atholl Browse. 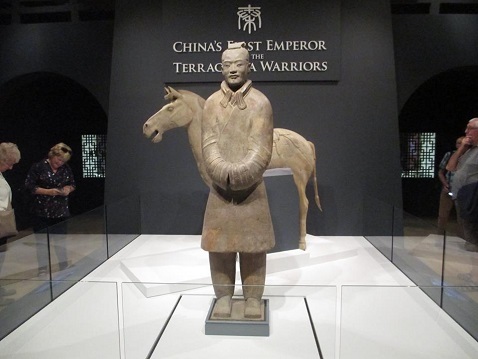 Hope WI visited the World Museum in Liverpool to see the Teracotta Warriors It was a truly wonderful exhibition, much enjoyed by all. On the journey home they had a brief visit to Port Sunlight. 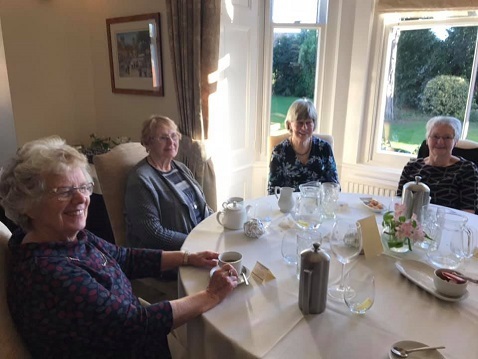 Willington WI ladies took a walk round Melbourne Pool finishing with wonderful tea and cake at Pool Cottage Residential Home. 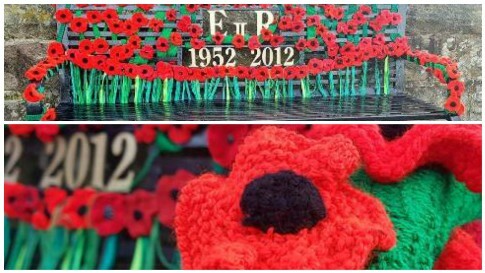 Whilst there they picked the brains of Melbourne ladies who were attaching knitted poppies to camouflage netting. 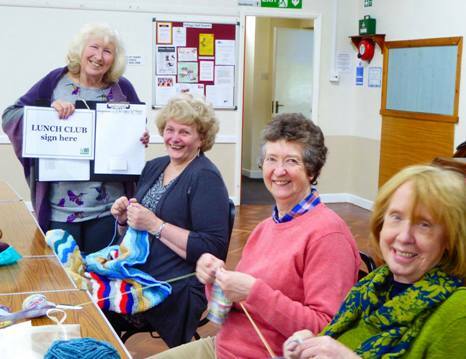 A reminder to get knitting for their station project! 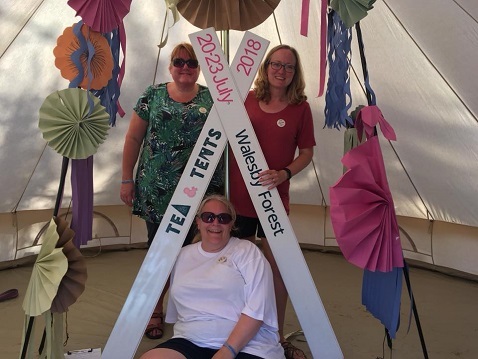 Tea and Tents 2018- Breaston WI what an amazing weekend with 500 fabulous ladies. 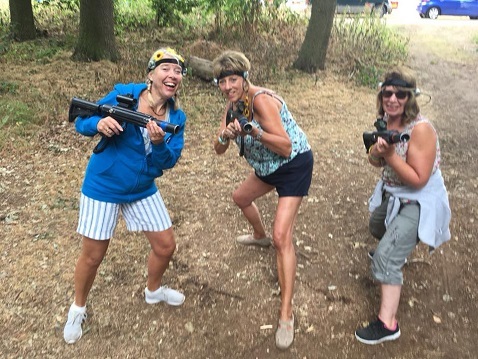 We took part in laser quest, throwing axes, rifle shooting, assault course, climbing wall. Listened to interesting speakers, watched cookery demos, made Christmas Baubles, needle felting, hoola hooped and lots more. Julie and Sharon took part in the talent show and read some of Kay’s great poetry. We ran a laughter workshop. 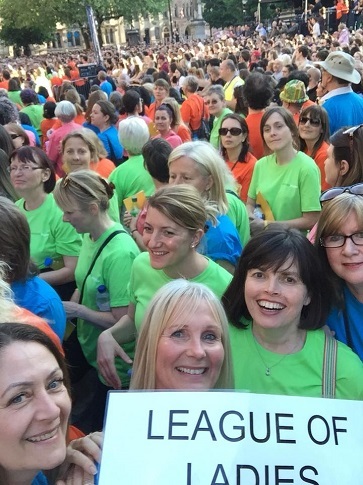 Sang Jerusalem with 500 WI ladies from all over England. 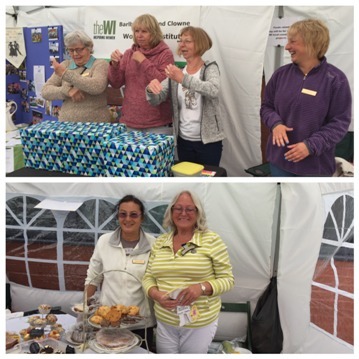 Whitwell and District WI at Whitwell Village Gala stall on Saturday 21st July. Well done ladies! 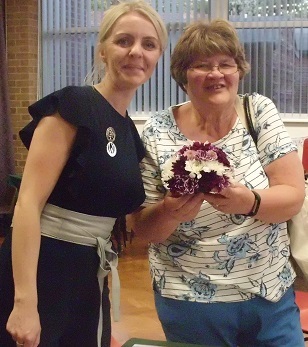 Uffa Magna-Mickleover WI - Such a lovely afternoon tea party, raising funds for their charity, the Derby MS centre. Lots of lovely sandwiches, scones and cakes and of course lovely company. Thank you so much to everyone who helped. 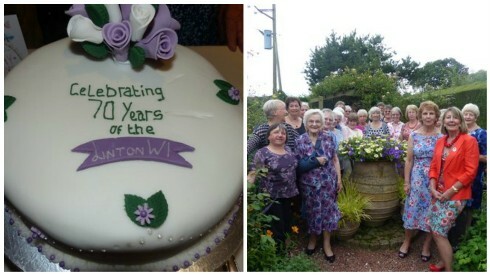 Breeston WI celebrating 100 years of votes for women which is part of Breaston’s fantastic “Breaston in Bloom” display. 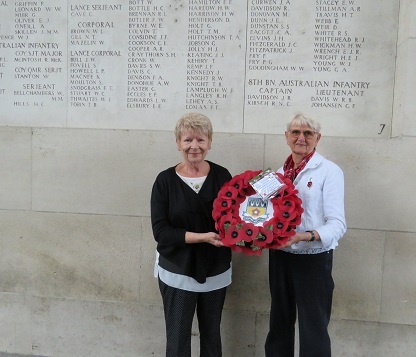 On a recent visit to Bruges a wreath was laid at the Menin Gate on behalf of the Derbyshire Federation by members Chris Cummings - Sawley WI and Sue Walker - Ockbrook Redhill WI. A very moving ceremony. Whitwell and District WI contribution to the WW1 flower festival in St Lawrences church is absolutely wonderful! Well done to everyone who contributed and helped create it, especially Dorothy for the beautiful arrangement on the window sill. 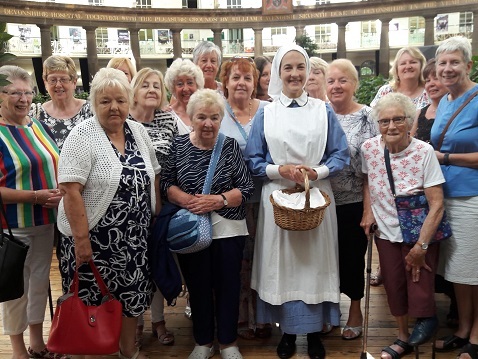 Killamarsh WI Killamarsh WI on a trip to Buxton to the dome, where we had a tour with (Vera brittain) acted by Sarah. What a marvellous tour and so interesting about Vera Britains life. 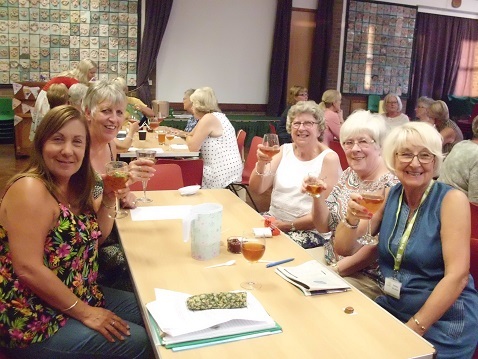 Members of Drone Roses WI attended a wonderful ‘Strawberry Tea’ event organised by Old Brampton WI in June. The Calver Cookies were out walking again in the sunshine. 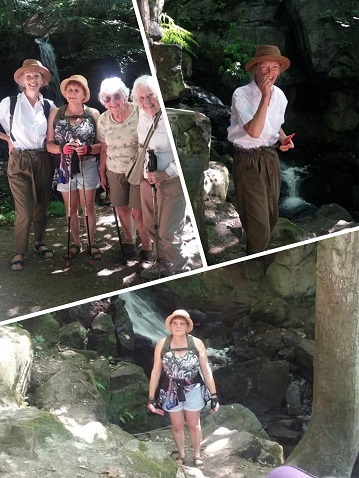 Our walk to Lumsdale Falls was hot and rather steep in places but enjoyed by all. 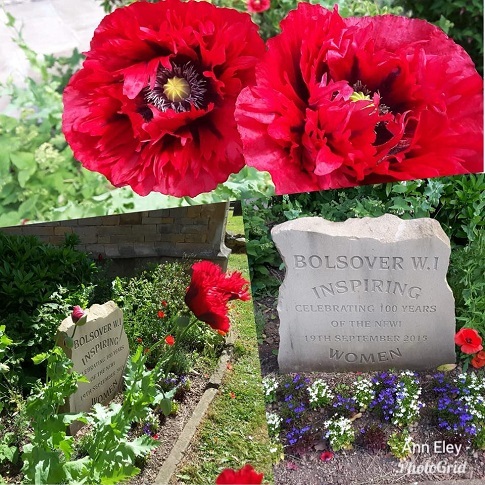 The beautiful Bolsover WI Centenary garden by the entrance door to St Mary and St Laurence Bolsover Parish Church. Photographs were taken by one of our members. 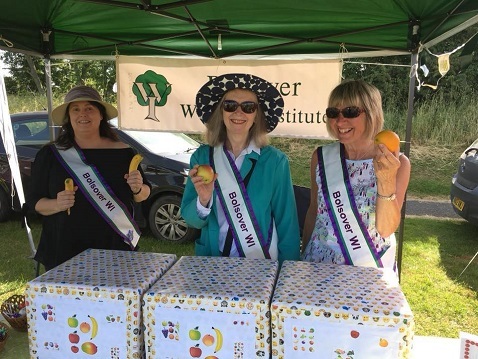 Ashover WI hosted the Centenary Walk 2018 in June. Here are the helpers behind the scenes on the day in the Bassett Rooms. This is the story Ashover WI village Church yard bench. Placed there 30 years ago by the original Ashover WI it was in great need of some TLC. So a few of us got together to slough off years of dirt and bring it back to it's former glory. It's now been returned to its original site, looking lovelier than ever - just in time for this week's Centenary Walk. 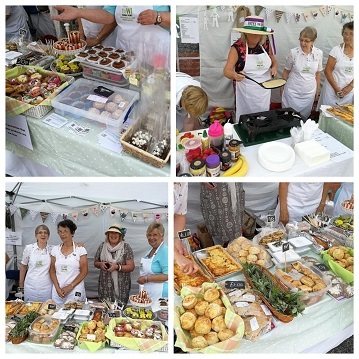 Long Eaton WI at the annual carnival with a delicious array of cake! 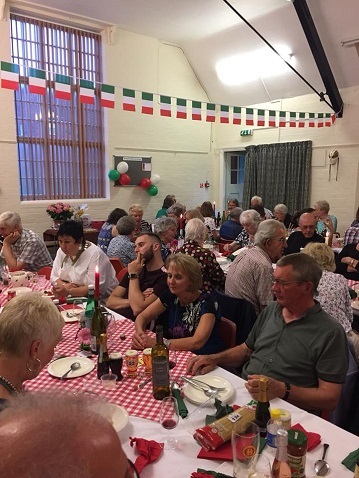 Newton Solney WI held an Italian evening with entertainment for members friends and partners - it looked fantastic! Several members Chinley and Buxworth W.I. 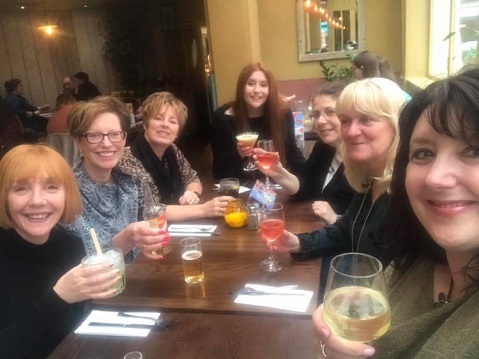 enjoyed a very interesting visit to the Hat Works Museum in Stockport last week followed by a extremely pleasant lunch at the Plaza ! 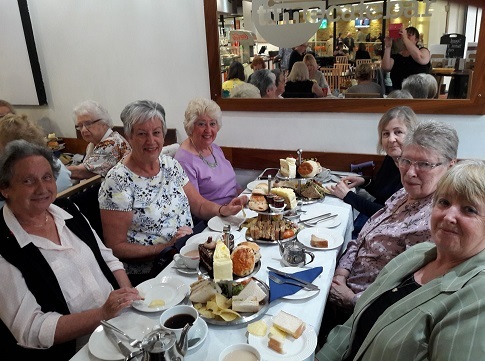 Members of Duffield Cumberhills & Duffield Afternoon WI's had a delicious Afternoon tea as a thanks for knitting blankets. 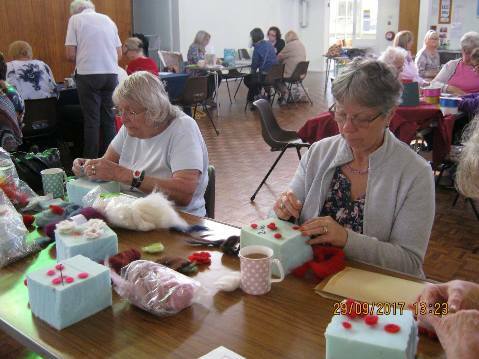 They were wonderful, all 122 of them and thanks go to all members of both institutes, who over the Winter months knitted the squares for us to sew up. Jane with her husband Peter and students from Littleover School will be taking them to Kabale, Uganda at the end of June. A new dormitory has been built for older children so the project continues next year. Please keep knitting! Old Brampton WI. 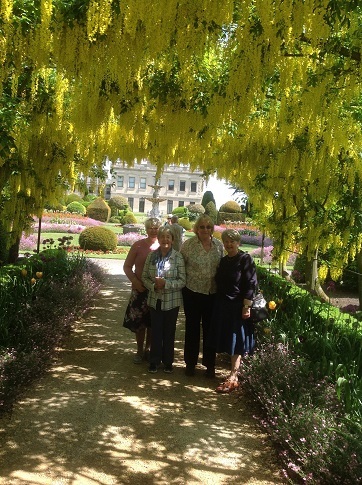 A lovely day out for 4 of our Old Brampton members at Brodsworth Hall, near Doncaster. If you haven't been before, the gardens are stunning. Heanor WI. Our lovely President, Diane, receiving flowers and a gift card from the members on stepping down after five years’ service. Thank you so much Diane, you’ll be a very hard act to follow. Bolsover WI A lovely sunny morning for our Suffragettes Hill race team publicity photoshoot. Fabulous outfits and hats! 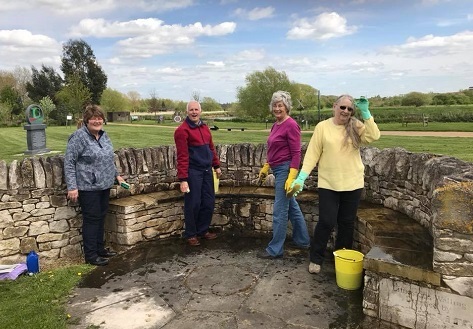 Three members from Bretby WI and WISH had a busy afternoon sprucing up the WI seat at the National Memorial Arboretum. Nice clean seats to sit on now when you next visit! 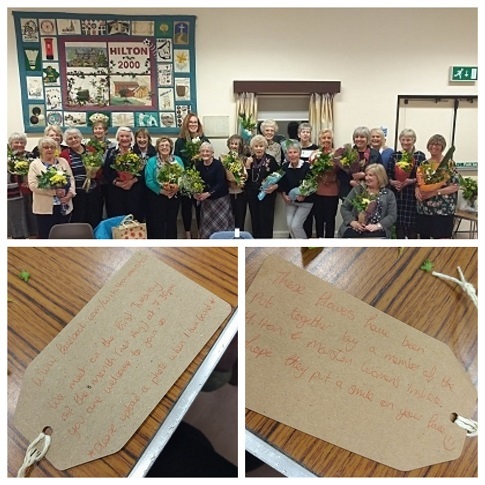 Hilton and Marston WI had a lovely meeting this month. 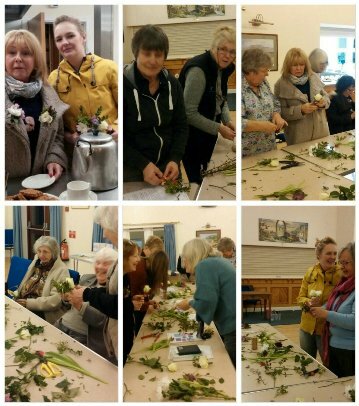 Members created bouquets of flowers as part of a national initiative to distribute flowers to those you love, those that are lonely or just because. Some members gave their bouquets to friends and family and some left them on a doorstep of a neighbor.This is something everyone can do and it is so lovely to bring a smile to someone's face! Well done ladies, all the arrangements were beautiful! Briz Valley WI turned back to Christmas 2017. As they had to cancel Christmas in December they decided to have an extra meeting in April! It was a tad surreal. But they soon got into the swing of the night by making "Mocktails". 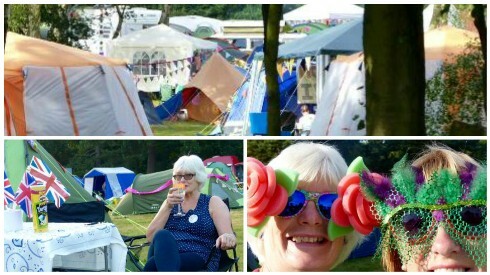 Breadsall WI. What an enjoyable evening it was at our Film Premiere! 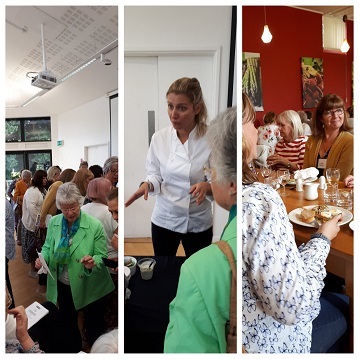 A full hall, lots of food and wine, happy people and a most brilliant film showing the changes in education over the last 100 years, It was a definite teary moment when Jerusalem came up at the end, and so many ladies stood up and joined in the singing. 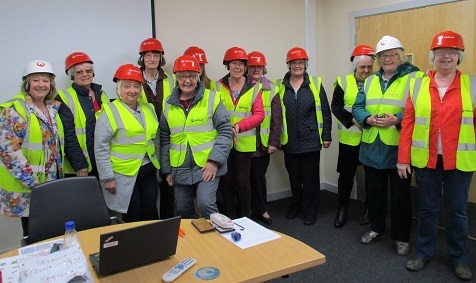 Whitwell & District WI's visit to the Veolia Materials Recovery Facility was amazing! Lesley, the Education Officer, taught us so much about what we should and should not be doing with our recycling. We learnt about the problem of recycling low-grade plastics, how to do the 'scrunch' test, what to do with hard plastics, etc. The actual tour to see the highly sophisticated sorting machinery in action was mind blowing. We are now all fired up to be better recyclers and do our bit towards the future of the planet. 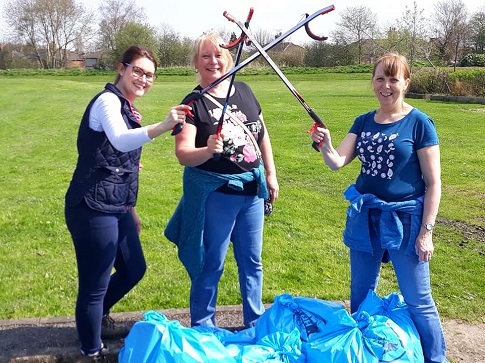 Bolsover WI took part in the Big Clean in April. 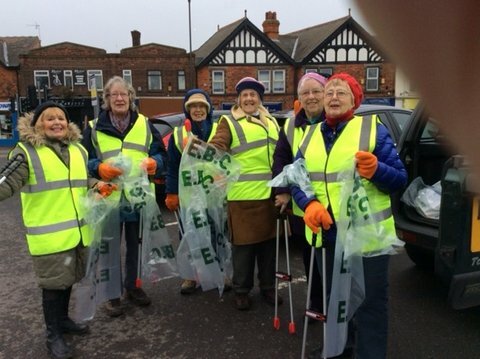 A small group of 5 managed to fill 8 bags of rubbish from Hornscroft and surrounding area. Great work clean up team! 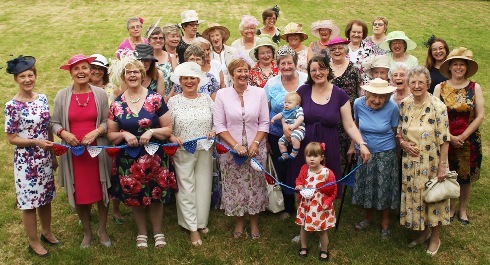 Littleover WI All of us in our finery to celebrate the Queen’s birthday, don’t we look grand!! 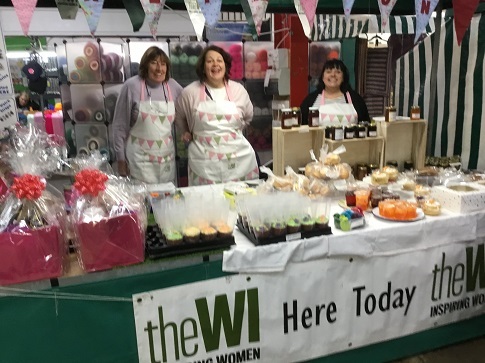 Alfreton WI Mothering Sunday stall on Alfreton Market selling amazing cakes and preserves. All homemade from fab ingredients. 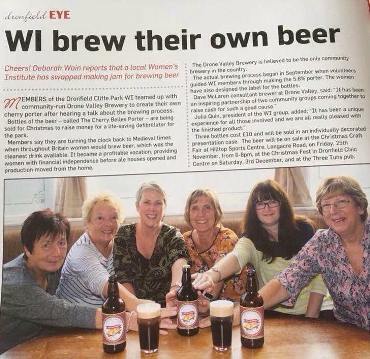 The WI doing what it does best! 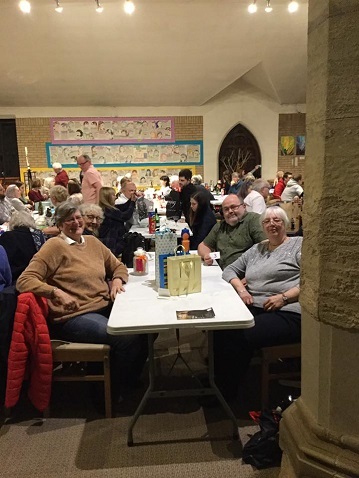 Initially a 3 way tie between Breadsall, Hatton and Pentrich A, who all finished on top with 87 points out of a possible 90, Breadsall WI was declared the overall winner when answering a tie break question gave them that final vital point. Congratulations Breadsall, and well done to everyone who took part. 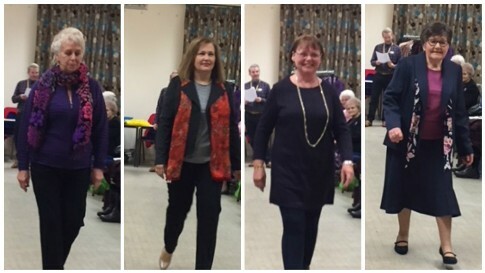 Four Darlings at Baslow WI's Social Afternoon in April 2018. WISA, it's time for tea and chat keeping busy or being lazy everyone does what they want! 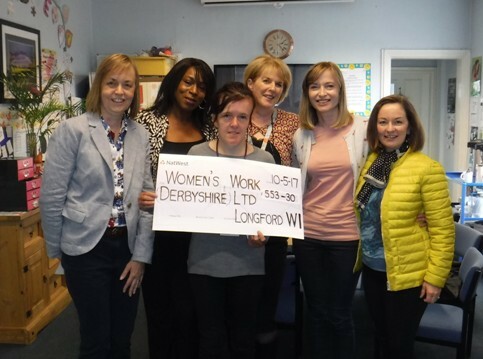 We had raised money by selling delicious cakes for a number of monthly meetings and then topped donation up to £100 which we presented to Borrowbrook. 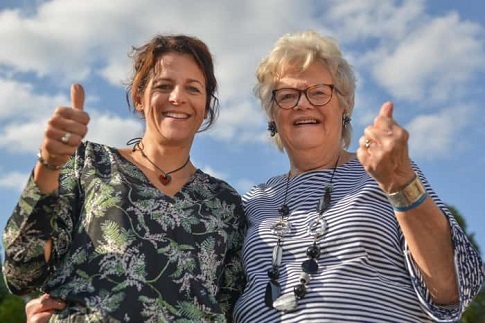 This is an organisation which helps to alleviate loneliness in older people in both parishes. This ties in with the WI resolution on loneliness. Borrowbrook were very pleased and have recently sent us a thank you letter. 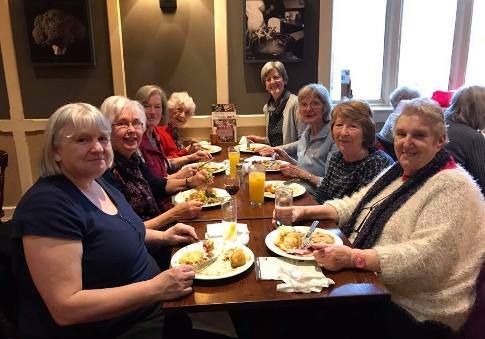 21 members of Chaddesden WI met at the Toby Carvery at the Park Hotel for sociable time with a good meal. 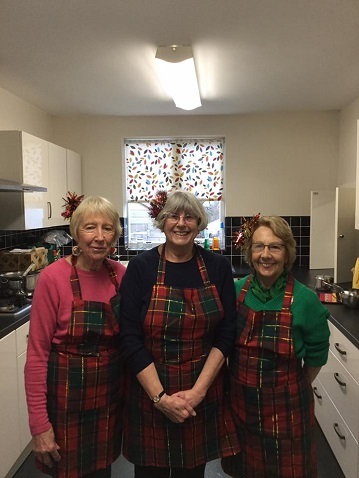 Members of Chapel-en-le-Frith WI making sandwiches for the Scouting Association Four Inns Walk in the High Peak in March. 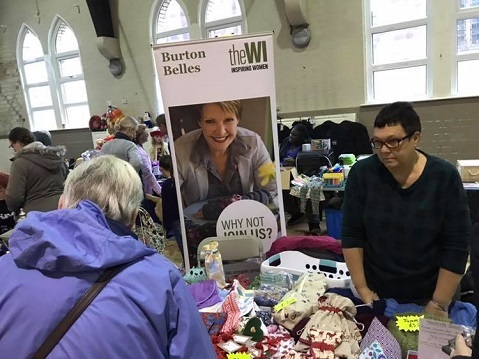 Burton Belles WI selling cakes, fudge and jam to raise funds for the Burton YMCA at the Burton Beer Festival in March. 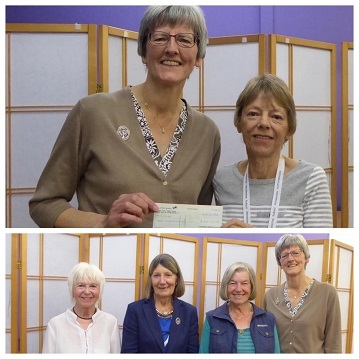 At the March meeting on Tuesday evening Patricia Quinn, President of Barlborough and Clowne WI presented a cheque for £202 to Anne Bellamy, DFWI County Treasurer as our contribution to the Saving Denman Appeal. 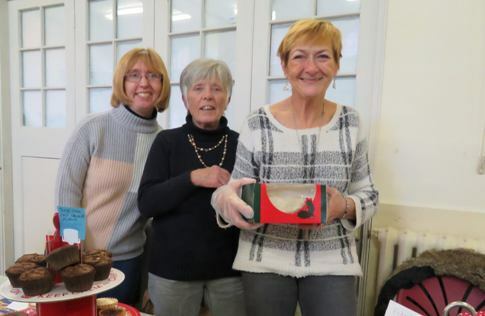 The money was raised at a recent WI Coffee Morning in the village. 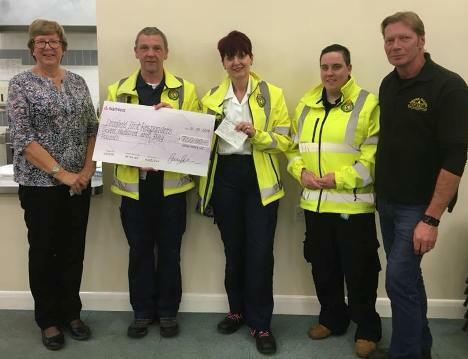 Drone Roses WI were delighted this evening to present a cheque for £750 to Dronfield First Responders. Funds were raised after our recent beer brew in conjunction with Drone Valley Brewery. 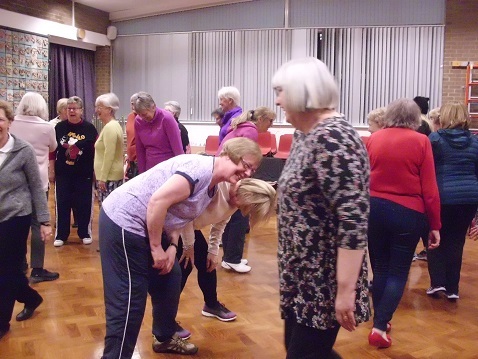 Barlborough & Clowne WI organised a walking netball session at The Arc in Clowne. 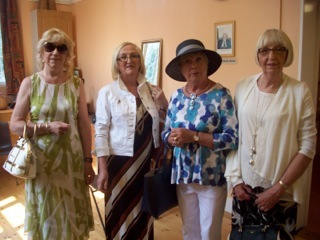 Other WI members from the De Rodes Group of WIs were also invited. 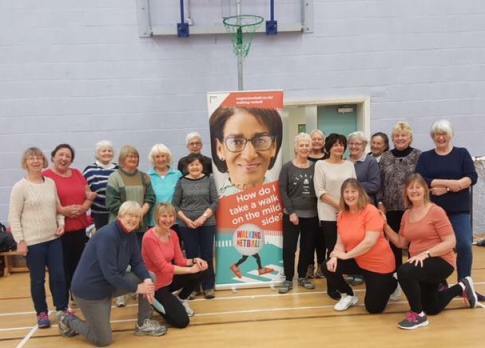 What a fantastic afternoon, thanks to Sue for organising the taster session and for applying to NFWI to be part of the walking netball project. Sue is waiting to hear from England Netball as to when our sessions will start. 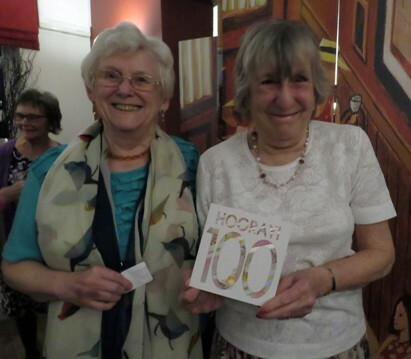 Congratulations Holbrook WI on your Centenary. Enjoy your special year. 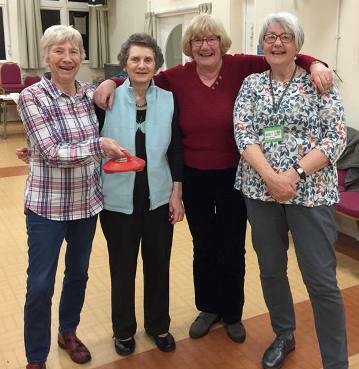 Whitwell and District WI -The victorious team from the curling evening in March. Good fun and well done the winners! 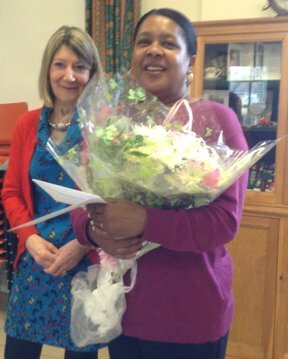 Arlene a member of the admin team at Derbyshire House has completed 20 years service - and she is still smiling. 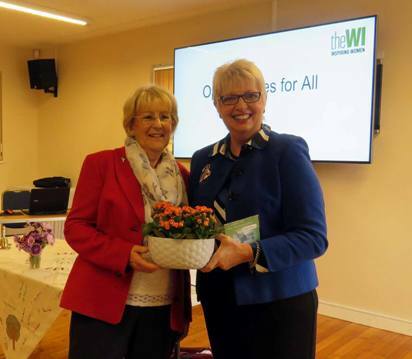 She was presented with a bouquet of flowers, a card and gift by Chrissie Booth DFWI Chairman. Braving the snow! 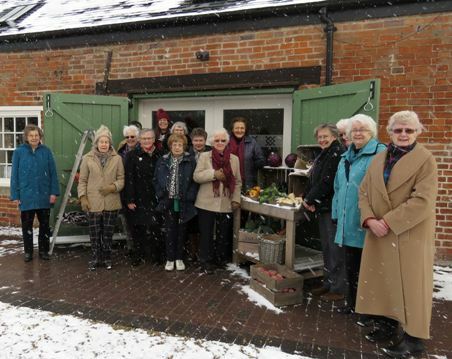 Sudbury WI members met up at 'Sweet Little' in the Courtyard at Sudbury Hall for coffee and light lunch before choosing from the range of vegetables on display. 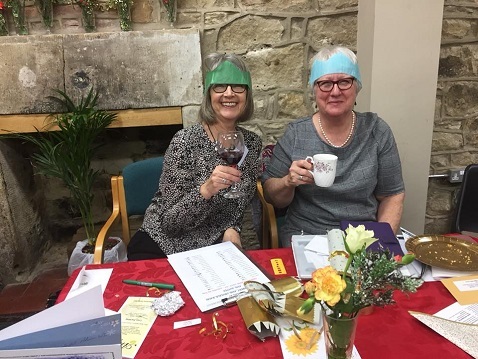 Calver & District WI have moved their meetings to the Village Hall and look how they are taking advantage of all the space they have. 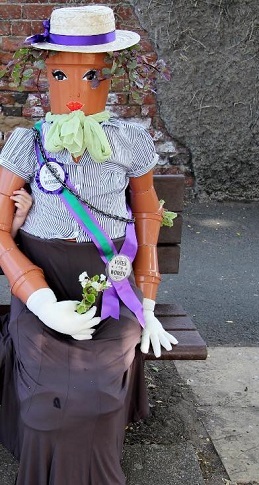 Good luck to you all with your re-formed WI. 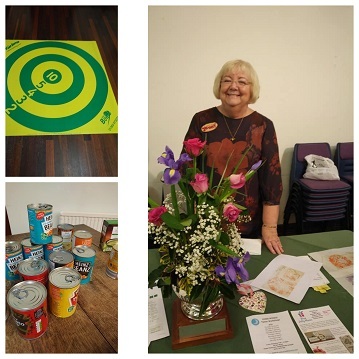 Shardlow WIs speaker was our very own Nancy Hawksworth. She whipped up an amazing 4 dishes in an hour, all including at least one of your five a day, and all absolutely delicious! 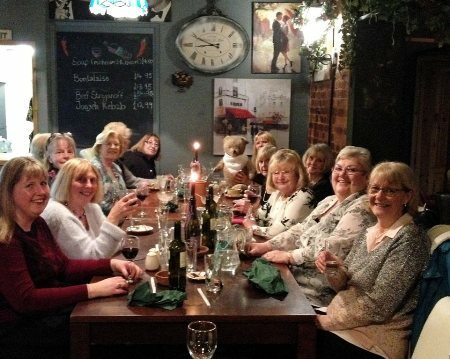 Little Eaton WI committee enjoying the annual meal out at The Clock Bistro, Spondon. Even WI teddy had his own chair and had a wonderful time! 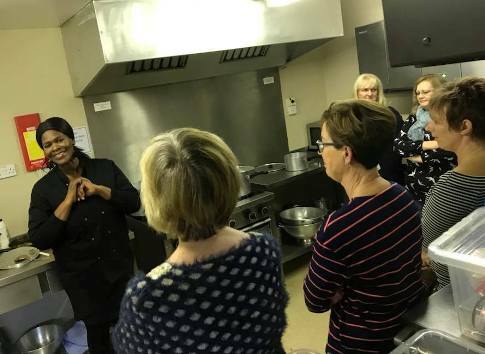 Burton Belles WI members were treated to a Caribbean cookery demonstrationnand enyoyed eating the final product. Congratulations Nancy Sallis from Tupton WI who recently celebrated her 100th birthday. 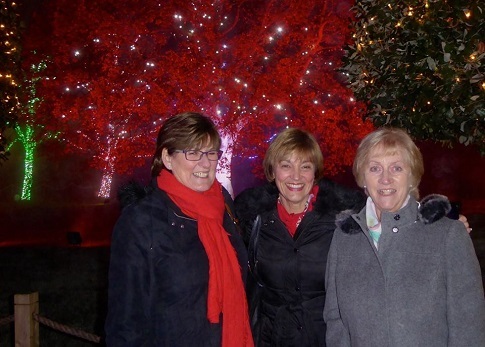 Chrissie was joined by Scarsdale Group Coordinator Jean Groom and Secretary of Tupton WI Pam Cash on a recent visit. Nancy was a former Treasurer of Tupton WI and shared wonderful WI memories. She looks forward to hearing about all our Centenary Events during this special year. 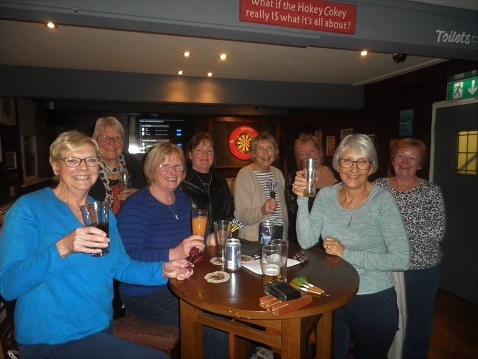 Willington WI give Darts a try! Our first darts evening was a success- in terms of laughter if not in accuracy of throwing! The regulars in the bar of the Rising Sun were kept entertained by our attempts, but we did improve as the evening progressed! We've got a month to practise before our next night. 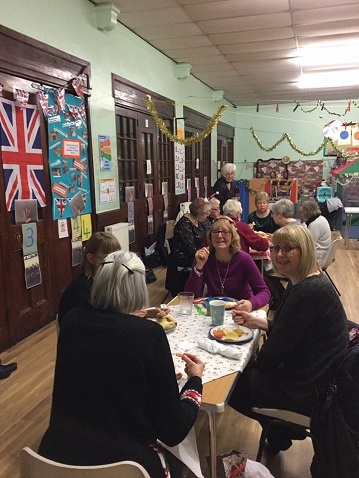 Risley WI members (Hopwell Group) held an 'in between' get together party - a great idea between Christmas and New Year. 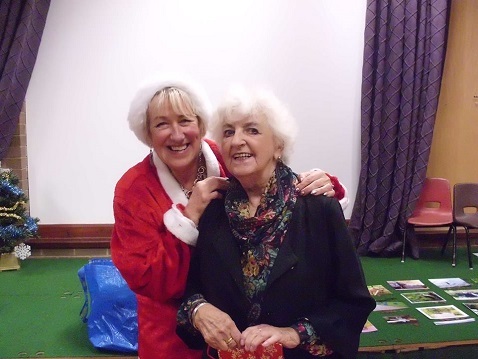 Great fun with Chrissie at the piano, lots of raffle prizes, a quiz, carols and of course, lovely food. 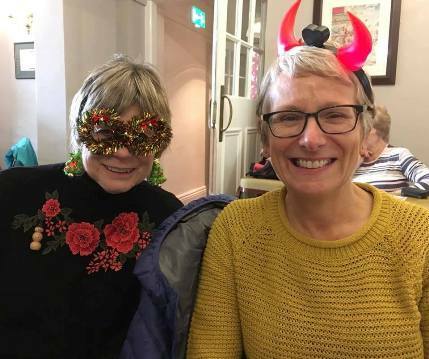 Baslow WI Darlings having some fun at the lunch stop on their Christmas walk..
Ilkeston WI held their Christmas Fair this morning. 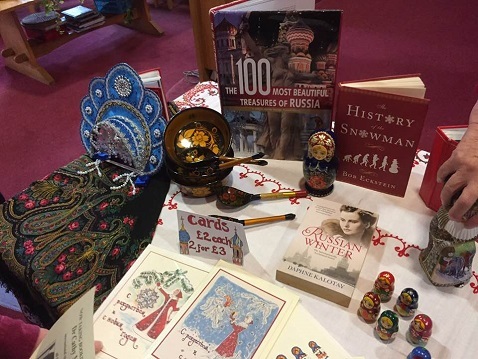 There was a variety of fundraising stalls, great refreshments and a warm welcome for everyone. Wonkatastic! 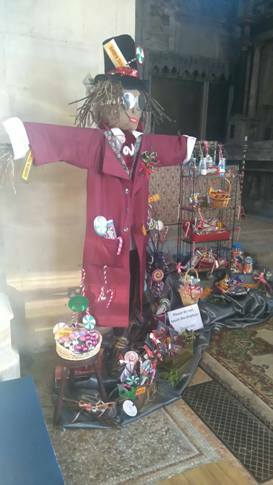 Bolsover WIs' display at the Bolsover Scarecrow Festival - After weeks of preparation and a busy few hours today, Willy Wonka and his sweet shop is finally finished for this weekends Scarecrow Festival at Bolsover Parish Church. This years theme is 'Storytime'. Thank you to all our members who have helped put together our fantastic display. 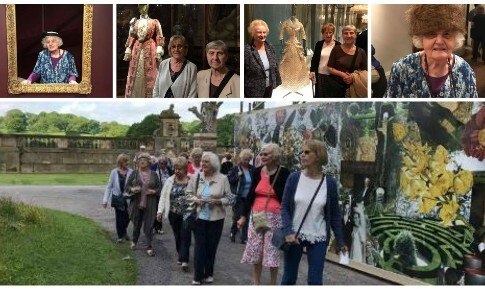 Eighteen members of Ockbrook Redhill WI visited the tale of 'Beauty and the Beast' at Tissington Hall on Wednesday night. The Hall was superbly decorated and looked magnificent. Sir Richard met everyone at the door and the group enjoyed mulled wine and mince pies and a tour of the house to see the tale unfold. They were also entertained with the reading of two amazing stories in the main hall. A wonderful evening. 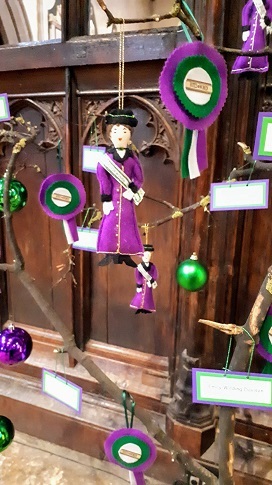 Chesterfield Town WI joined with other organisations in the town at the annual Christmas Tree Festival. What an amazing tree! 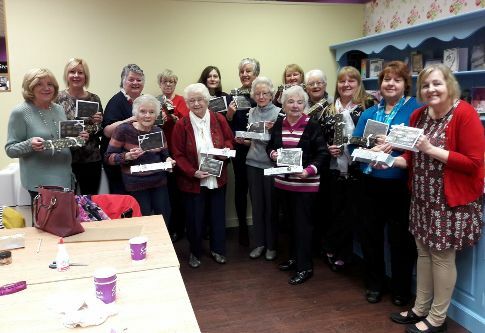 Killamarsh WI had a crafting morning at crafters companion , where 15 members made a Christmas cracker and a Christmas card. A successful morning which everyone enjoyed. 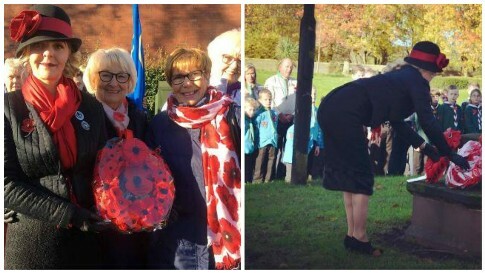 Briz Valley WI president Louise laying their poppy wreath on the St Peters, Stapenhill war memorial yesterday. 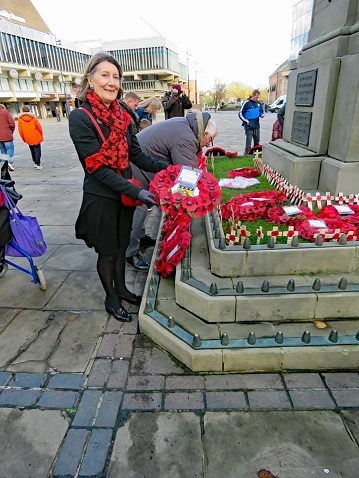 This beautiful poppy wreath was laid at the cenataph in Derby this morning by Linda Singleton on behalf of every member of DFWI. Chrissie Booth was also in attendance, both braving a fearsome wind! 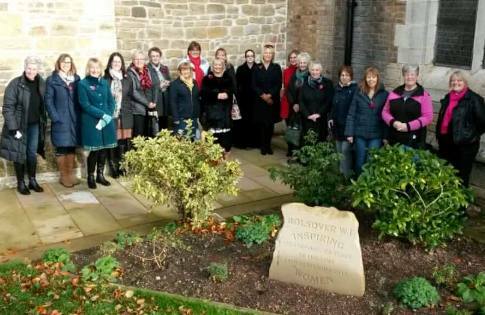 Members and Presidents past and present of Bolsover WI gathered this morning to unveil our new stone in our memorial garden at Bolsover Parish Church. 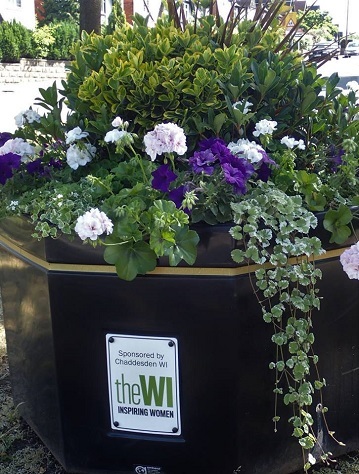 The stone commemorates the centenary of the WI which was in 2015 and is a replacement for our tree which was sadly stolen last year. This was followed by a two minute silence for armistice day at our Cenetaph. Look out for our beautiful stone next time you're passing through the churchyard. 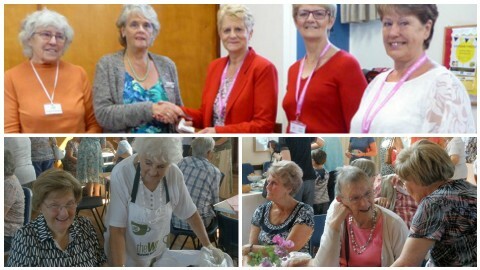 Breaston WI Fundraising Coffee morning for the community was so well supported today. So many stalls and wonderful cakes. Well done ladies. 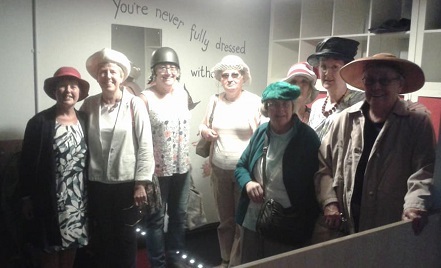 Marston Montgomery Women's Institute enjoyed a very informative and poignant visit to The National Arboretum at Alrewas in August. We were greeted by the knowledgeable staff who pointed out memorials which would be of particular interest to us. 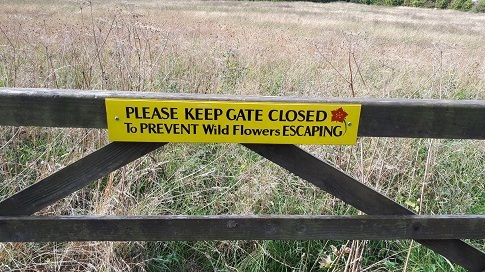 This was very welcome as the site covers an area of 150 acres and contains over 300 commemerative displays. 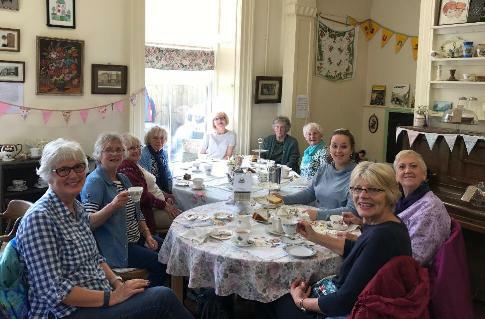 Whatstandwell and Districts WI decided to visit Bettys Vintage Tea Rooms in Ashbourne for their September meeting as the speaker was unable to come. The owner, Jacky, gave the Institute a talk on the setting up of the enterprise. Not only is it a very good tearoom but a shop selling all types of haberdashery items, plus she holds many courses in crochet, sewing, quilting, knitting etc. The talk was followed by a delicious afternoon tea. All in all a very enjoyable afternoon. 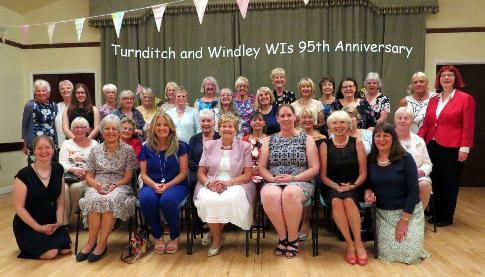 Turnditch & Windley WI celebrated their 95th anniversary in style with a cocktail and canapes evening for members and guests. 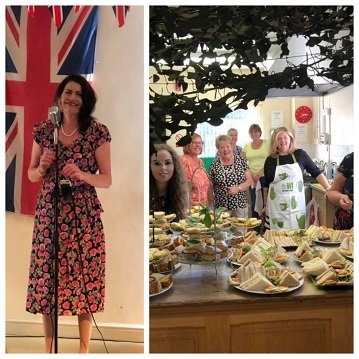 The hall was transformed with bunting, flicker lights, flowers and mood music – all a background to a most enjoyable evening of friendship and fun. Oh what glamour! Roll on 100! 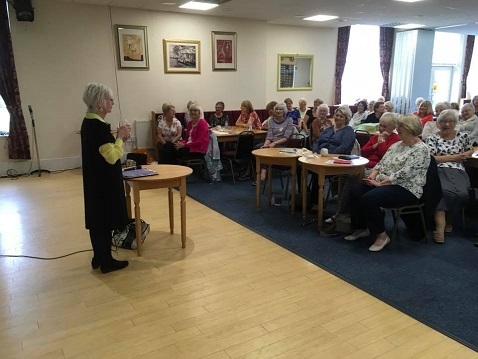 National Chair Lynne Stubbings was in Derbyshire today to talk about the many opportunities the WI has to offer and encouraged members to become more involved in their WI or Federation and join a sub- committee or help out at an event. 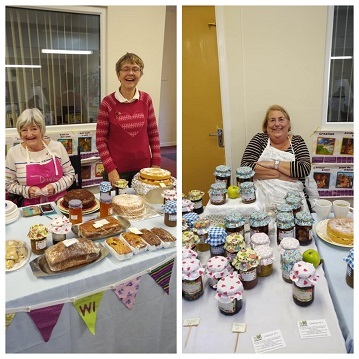 Calver & District WI have made £444 at this fundraiser. 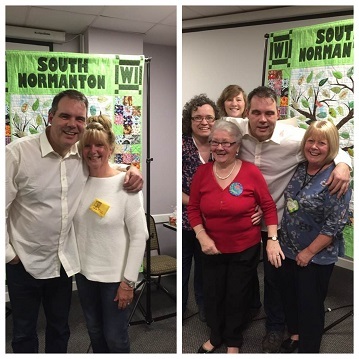 Well done on such an amazing effort and good luck to them for the future of their re-formed WI. Great photo too - thanks for sharing! 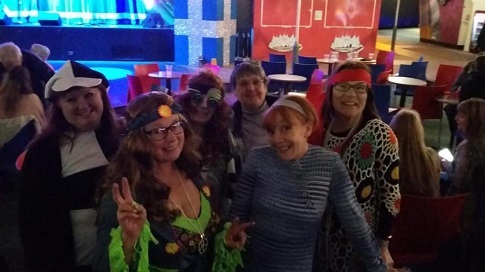 Briz Valley hosted our 60s themed evening and as ever, they'd gone to town on the dressing up!! Lots of music we could sing along to (but then completely forget to name the tune in the quiz!) and lovely nibbles. I've not had a vol-au-vent for years! Many thanks ladies. Members of Barlborough and Clowne WI supporting the Eats and Treats event in Shirebrook today. 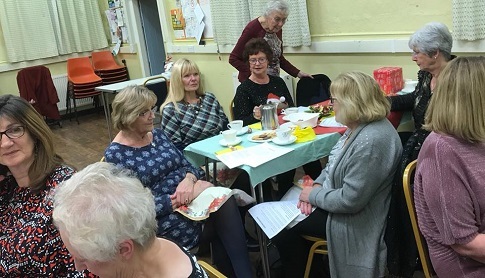 WI members have been serving refreshments at these events in the community for a number of years now supporting local organisations giving advice to the public on a variety of issues. 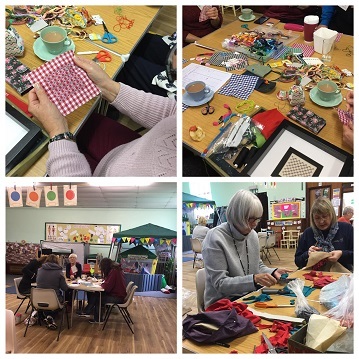 A busy morning at the Baslow WI Craft Dabble Day in aid of Denman College. 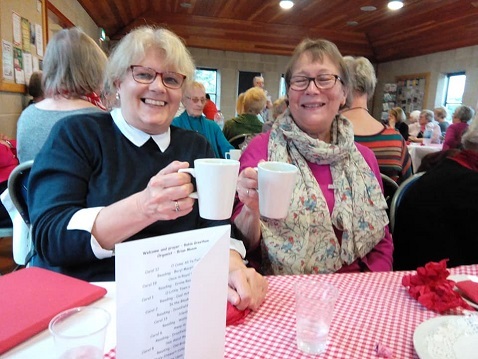 Cromford WI held a coffee morning in the village in October 2017to promote their WI. 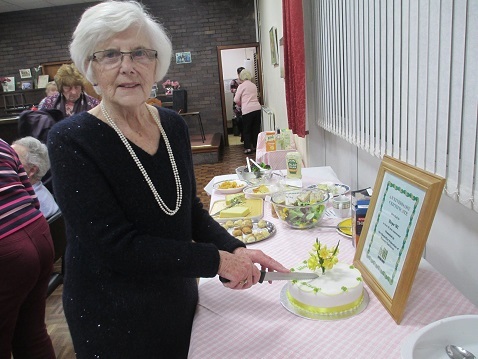 Members made delicious cakes and on display were some wonderful craft items made by members. Such talented ladies. 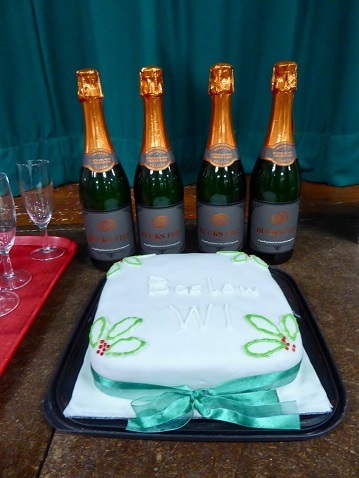 The Sherwin Singers say thank you to Cromford WI members for the cake at a recent rehersal at Derbyshire House. Special treat during tea break - delicious. 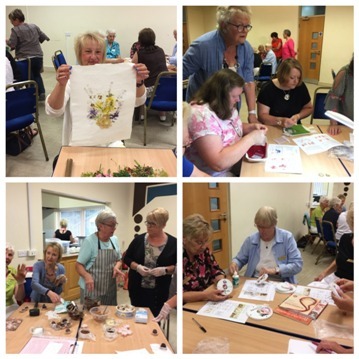 Bolsover WI ladies showing members how to make felt flowers at the Rutland Group Dabble Day. 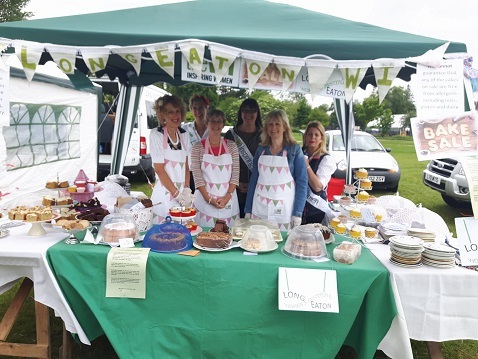 The event raised £110 for Chesterfield's Macmillan nurses. Well done!! 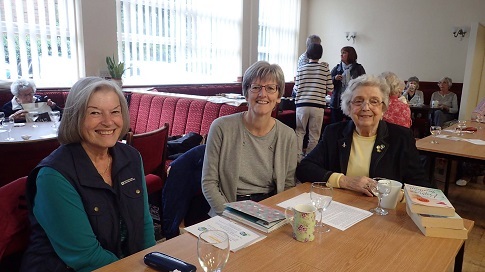 Briz Valley ladies enjoying a very worthwhile day out at the Derbyshire Federation Meeting. Raffle sellers had a very healthy day and on our selling scarves for Denman we managed to raise £1100! Well done girls you were brilliant! 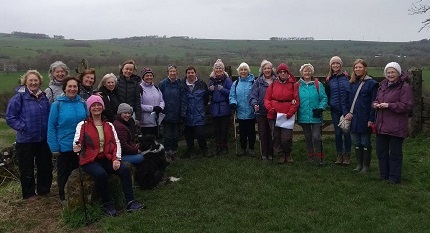 Hayfield and District WI A group of 33 WI members, plus 1 very brave husband, from the Cumbria Westmoreland Federation on holiday in the Peak District came this morning to Hayfield. We had arranged 2 different walks, according to ability, which due to wet weather had to be tweaked a little. After setting out in rain it dried up and the sun came out. 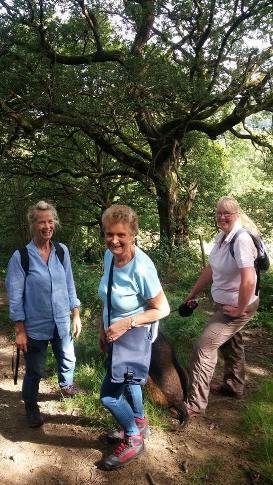 We were pleased to welcome Chrissie, DFWI chairman, who joined one of the walks. Returning to the Village Hall a substantial lunch was served. 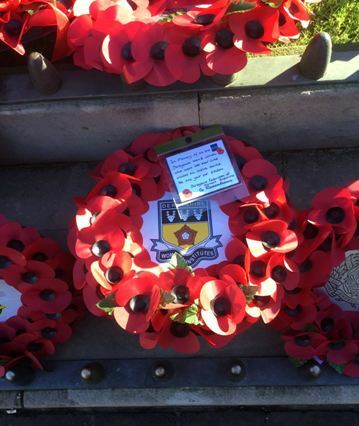 Many thanks to all our members who contributed in any way to a very enjoyable day. 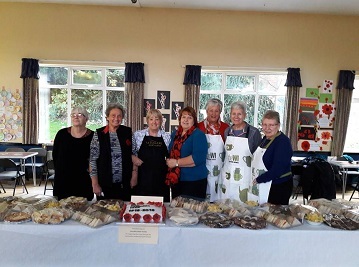 SAVING DENMAN: Baslow WI held a lunch in aid of the 'Saving Denman Appeal'. We were pleased to welcome friends and family and also our Derbyshire Federation Vice Chair & Denman Ambassador, Diane McHarg. 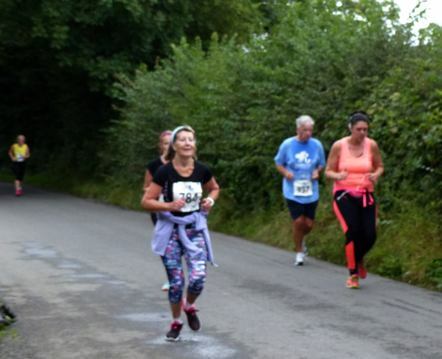 This event, ticket sales and raffle, raised in the region of £240 which added to funds raised earlier this year takes the total to approximately £700. Well done to everyone involved. 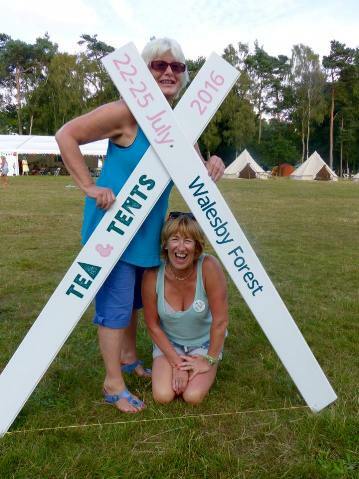 Two members of Pentrich WI doing their thing for chosen charities! 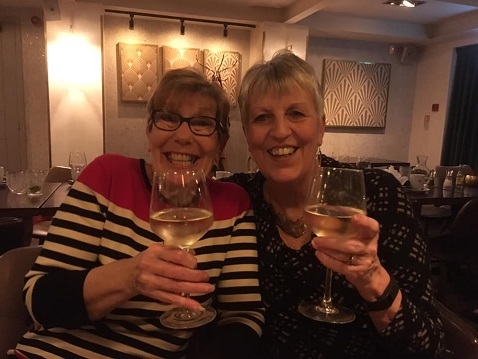 Deena is doing the Cancer Research UK Peak District Hike and Pauline is doing a parachute jump to raise funds for Dukes Barn at Beeley, an outdoor classroom for children with disabilities. Good luck to you ladies! 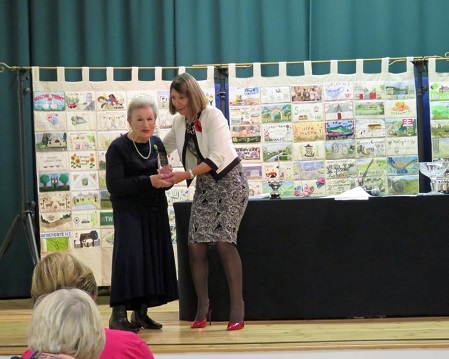 Willington WI have been awarded silver in the 'It's your station' category. A great achievement in our first year as station adopters. 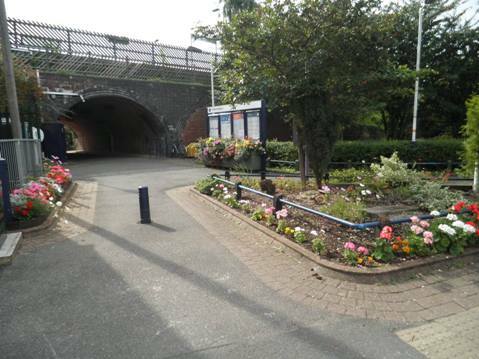 Thank you to all villagers and travellers who stop us to comment how lovely the station area looks. We're thrilled with how the plants have flourished and look forward to receiving our award at a gala dinner at the Roundhouse next month. 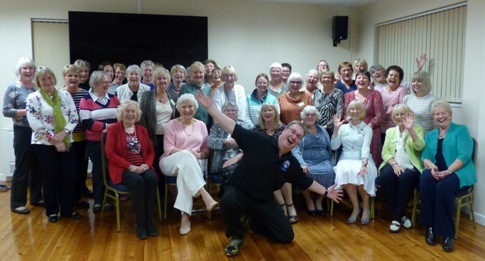 Smisby WI members at their Open Meeting when Kevin from Derby Mountain Rescue Team was the speaker. 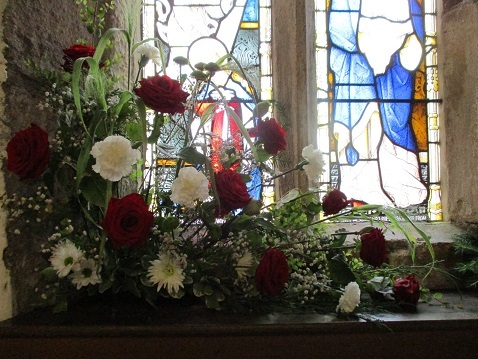 Sawley Flower Festival. 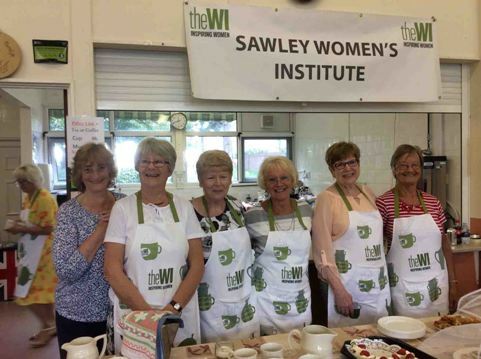 Sawley have been doing this each August Bank Holiday for the community over many years. 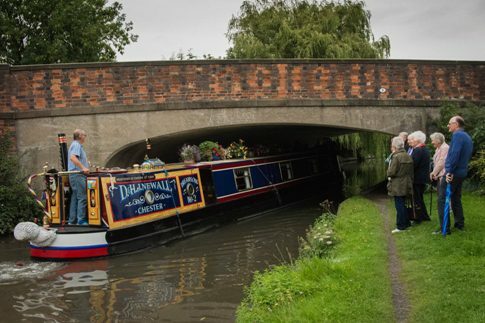 Egginton WI enjoyed a guided walk around Shardlow where the 3 Shardlow WI Guides told us stories about the development and demise of Shardlow as a busy inland waterway. They also provided us with a tasty supper. 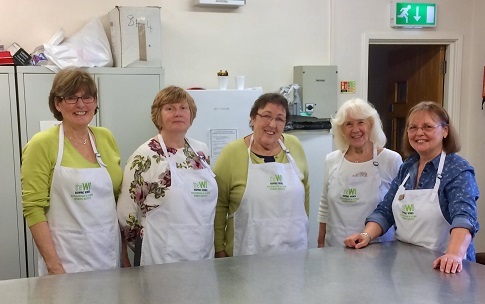 Many thanks Shardlow WI for your expertise in tourism and cooking. 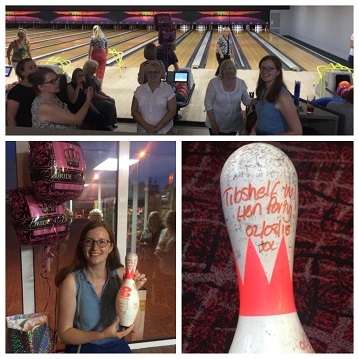 Our members and guest had a memorable evening. 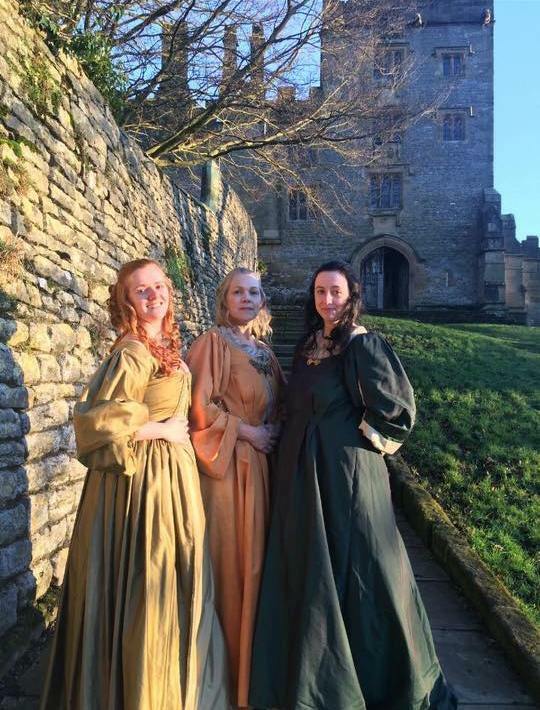 Swanwick WI visited Tissington Hall for a private guided tour of the 17th century hall, we didn't meet Sir Richard as he was not at home today! The village was beautiful the sun shining & most of the visitors had not yet arrived. 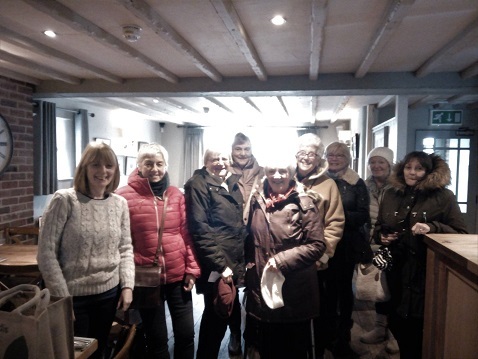 After our visit we went onwards to Ashbourne where members had time for lunch, shopping or both. 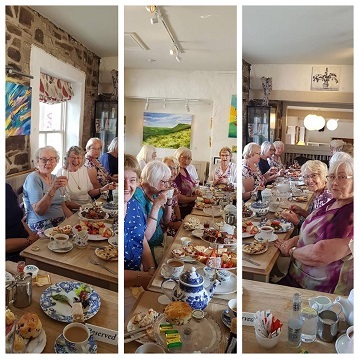 Some of us went to Betty's Sewing Room & Vintage Tea Room's (as advertised in Link) readers if youv'e not gone for tea I can highly recommend it: service, atmosphere & food gorgeous! 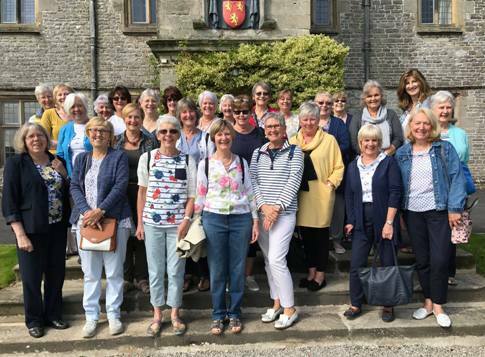 20 members of Briz Valley WI made a visit to Tissington Hall and Gardens during August 2017. 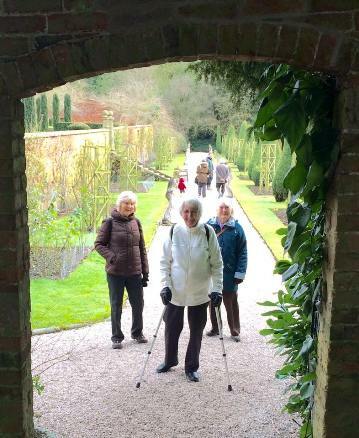 They started off the tour with tea and coffee in The Herbert Tearooms then had a guided tour round the Hall and the beautiful gardens. 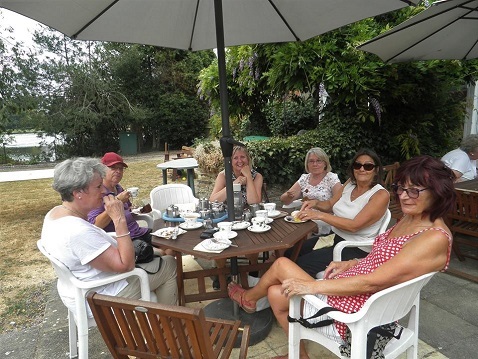 Members of Breaston WI enjoyed a lovely afternoon tea in Ashford in the Water. 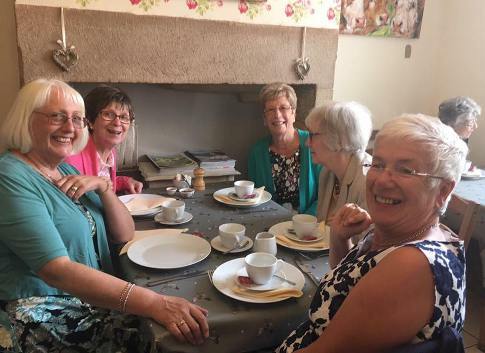 Coffee and cake with Chatsworth WI. 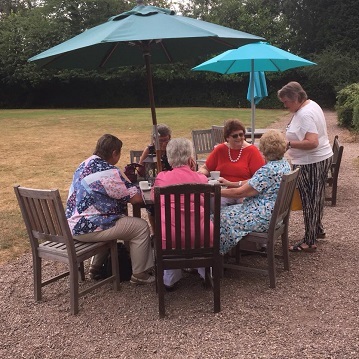 It was nice to meet up with members from Beeley WI, Calver WI, Breaston WI, Baslow WI and Chatsworth WI in Mary's lovely garden in glorious sunshine. 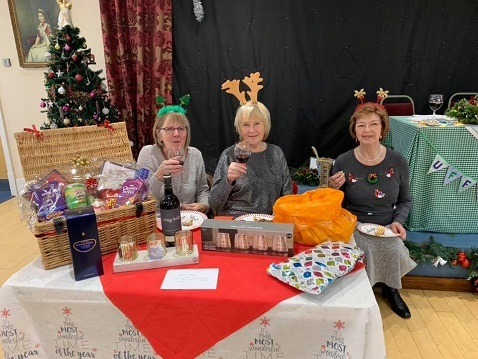 Lovely refreshments served up by Mary and friends with super prizes on the tombola. 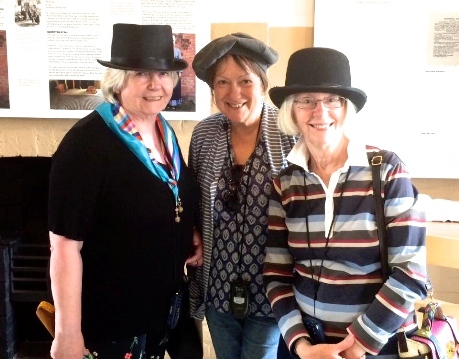 It was great to see members from Calver WI - Louise, Helen & Sue. 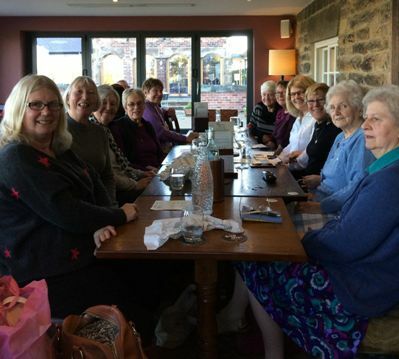 Wadsley WI enjoyed a visit over the border from S Yorkshire into Derbyshire to Chatsworth and called in to meet some friends (made via Facebook) at Baslow WI. I suppose this means we should change the page title to News from around the Counties! 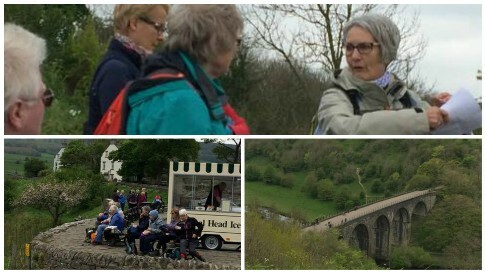 Members enjoyed a six mile walk today with Calver W.I. walkers. Thank you Louise Roberts for leading the walk. Making a difference in the community. 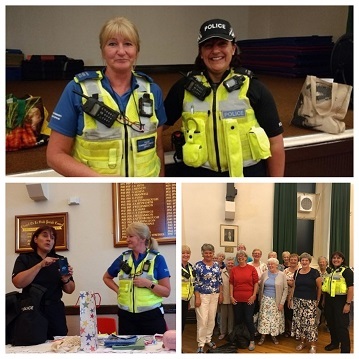 Once again 6 WI members from Barlborough & Clowne WI supported an Eats and Treats event for the over 55's. 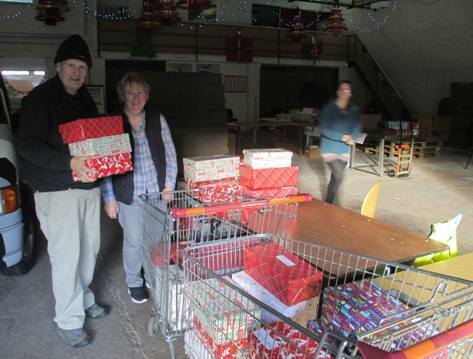 This time they were at the Post Mill Centre in South Normanton. 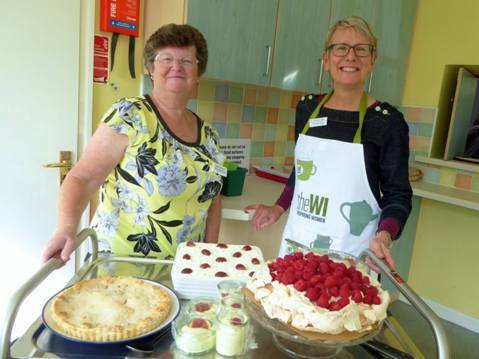 Over 70 people attended and they were very thankful for a cuppa provided by the WI. See the case study to understand more about the work being done locally by Eats & Treats. 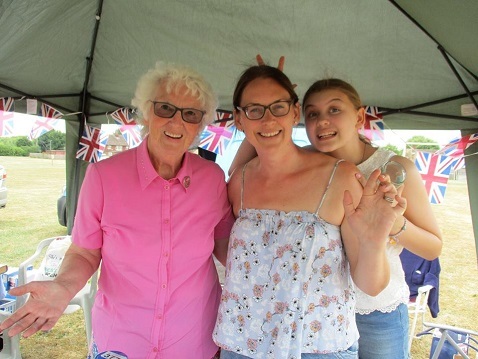 SOMETHING AMAZING HAPPENED TODAY AT BASLOW WI - THANKS TO FACEBOOK! Alison from Country Women's Association Castlemaine, Victoria, Australia turned up at our meeting. 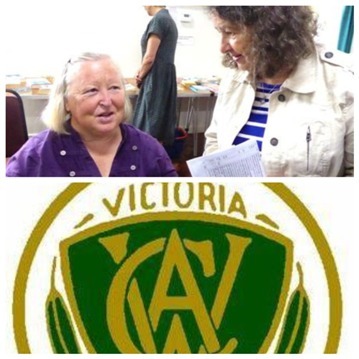 CWA is the equivalent of the WI in Oz and we follow each other on Facebook. 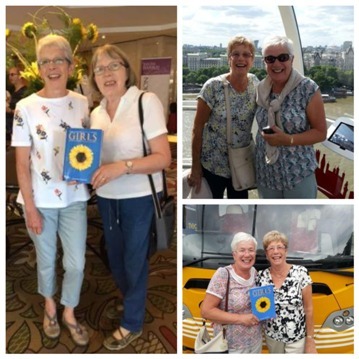 Alison was in London and told her family she had to go and visit friends in Baslow! What a lovely lady and a great surprise. Members of Pennine Group enjoyed a glorious day at the National Memorial Arboretum in June. 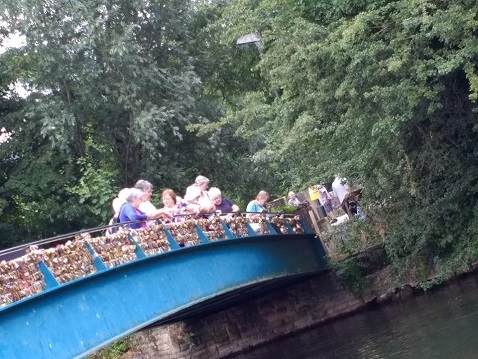 These ladies, pictured at the WI seat, were quite scary as they sped round on their mobility scooters! 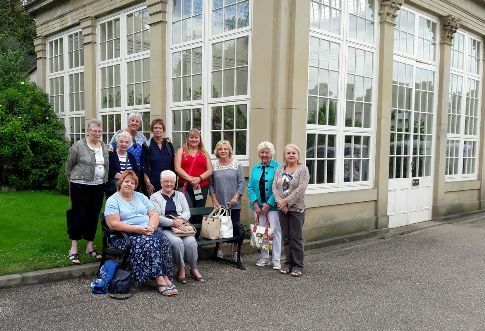 Killamarsh WI on a very interesting trip around the Sheffield Botanical Gardens. We had a tour guide to tell us all about the gardens and it's history. Another successful trip. 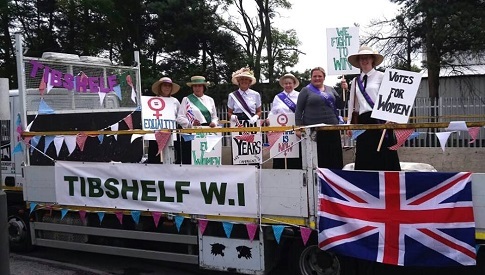 Bakewell WI makes the headlines at Bakewell Carnival! 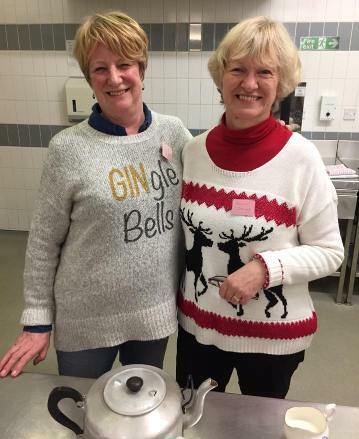 Tweedle Dee and Tweedle Dum, Gill Roberts and Rachelle Maltz-Jones members of Bakewell WI. Photo: Jason Chadwick. 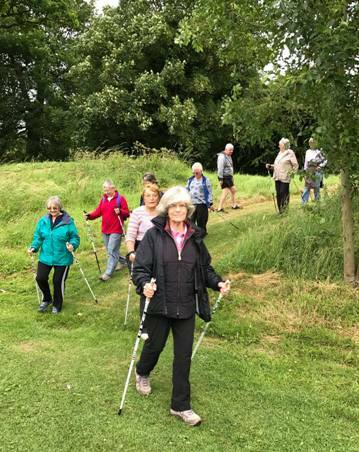 Some of our members enjoying a morning trying out Nordic Walking in Whitworth Park, Darley Dale. 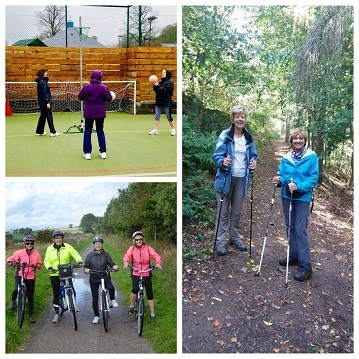 Brilliant exercise for mixed abilities & you get lots of lovely fresh air. Best quote of the morning was 'Well that's the best £7.00 I've spent!' Thank you and well done ladies. 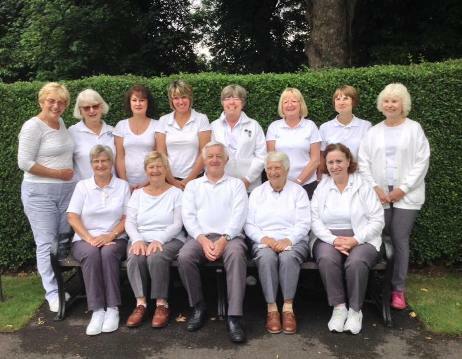 Derbyshire Federation Bowls Team (and coach!). Played at Southwell Bowls Club today in an Inter-Federation bowls match between, Notts, Lincs, Leicestershire and Rutland Federations. A very enjoyable day, sadly we didn't win, but gave a very credible account of ourselves against some very good and very experienced players, all of whom play flat green bowls regularly, while here in Derbyshire we mostly play crown green bowls (much harder!). Well done ladies, you were a credit to Derbyshire! 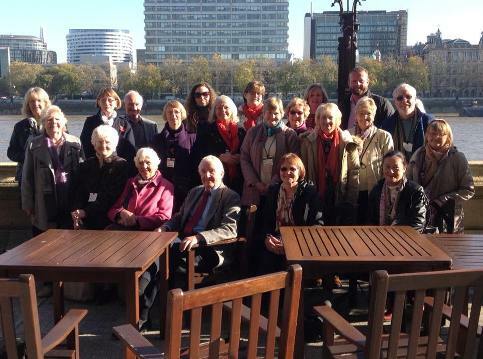 Some of the De Rodes Group who visited Manchester and the BBC at Salford Quays.. 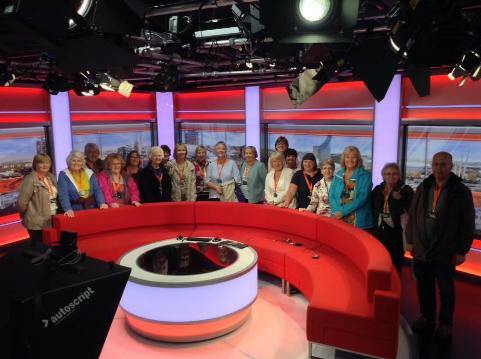 The weather was awful, but we were made very welcome on the BBC tour. Some of us also visited the Imperial War Museum which was thought provoking and worth a visit. Others also managed the Lowery Gallery and shopping!! 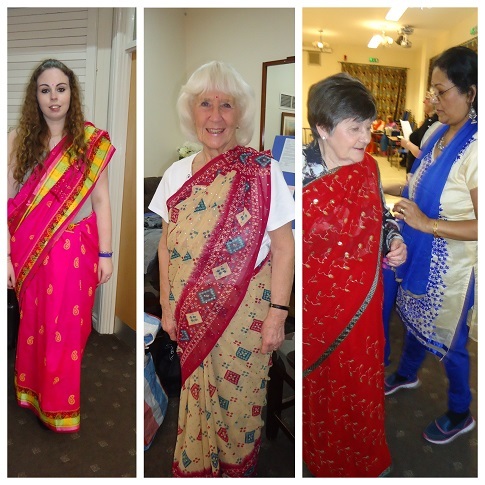 Activities included rifle shooting,dancing,weaving and other crafts. I hear there was plenty of yummy food and the odd drink too. Hayfield & District WI hosted the annual Kinder Group Walk. Intrepid members braved the wind and rain to complete two seperate walks finishing with a well earned supper. 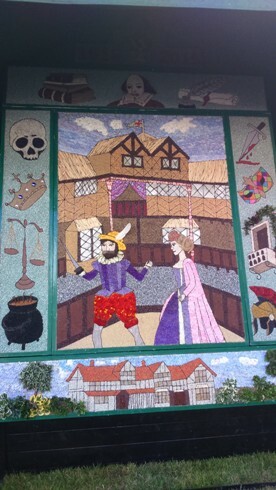 Whaley Bridge WI's first ever knitted welldressing is complete! 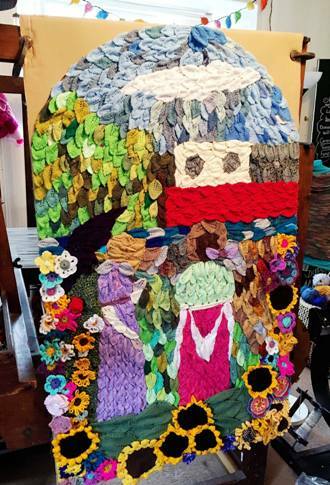 Hundreds of knitted petals combined to create a Jane Austen inspired scene all done by members of our Threads group and some fabulous customers. All donations collected during the week will go to help victims of the Grenfell Tower fire. 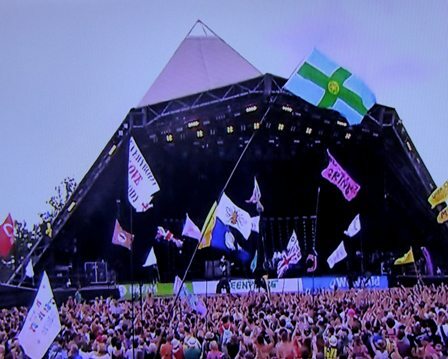 The editor does not know which members of which WIs were there - but this photo of the Derbyshire flag at Glastonbury just has to be included! 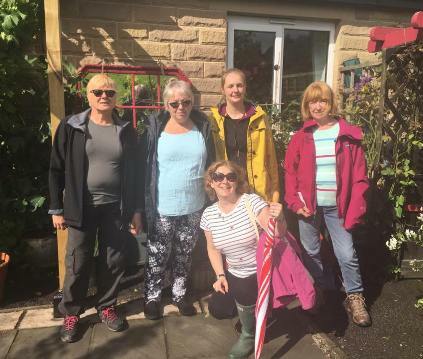 Walton WI enjoyed a lovely day out in Eyam which included a private visit to 'Wild in the country' , a cut flower garden grown by Mrs Gill Bagshawe who opens up her garden for the NGS and who has recently appeared on Gardeners World. This was followed by a meal at Eyam tea rooms before heading for a private tour around the Eyam Hall Gardens. 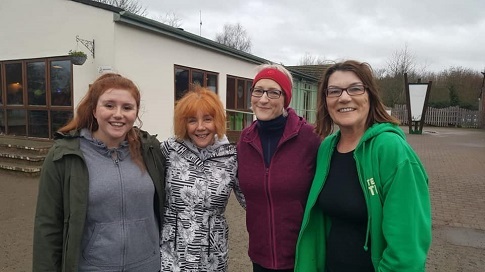 Denise Porter from Old Glossop WI with Barbara & Kath from Charlesworth WI were host to the 5 ladies on the right who are walking from Liverpool to Hull - Trans Pennine Trail - Saving Denman Appeal. Walk started again at 8am this morning. 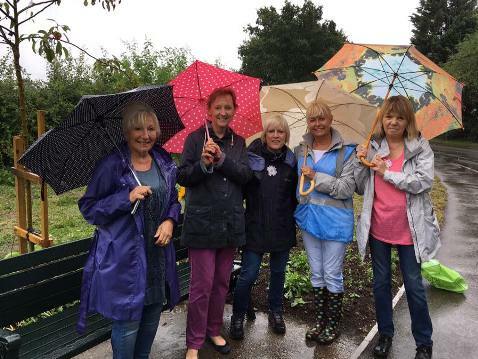 Well done ladies and hope it stays dry. 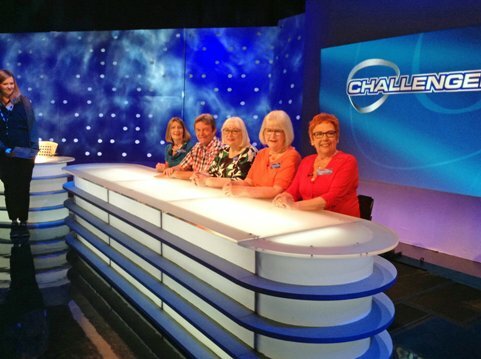 Our very own Barbara Bailey is sitting third from the right in the photo. 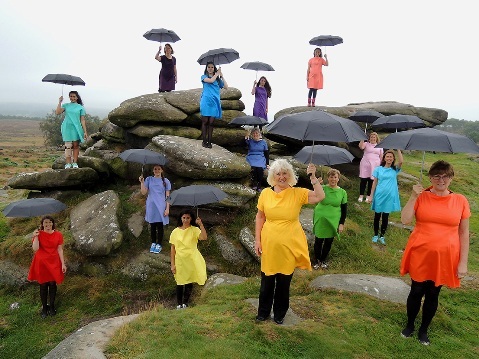 Pentrich WI visited Chatsworth to see the new fashion exhibition, well worthseeing. The gardens were as beautiful as ever with preparations well underway for the RHS flower show in June. 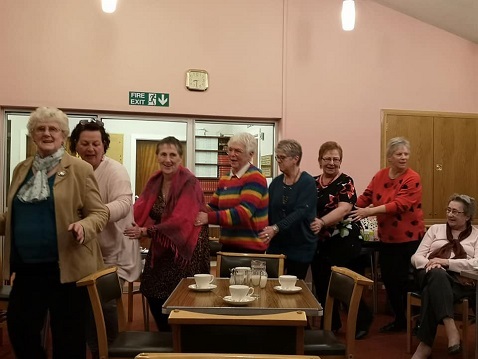 Bolsover WI ladies doing what the WI does best - joining in and having fun for a good cause! 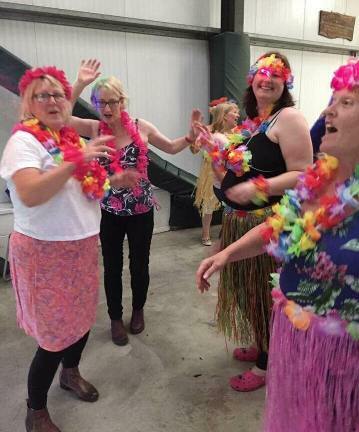 Hulland and District WI members enjoying the entertainment provided by Tribal Belly Dance Moon Hare . 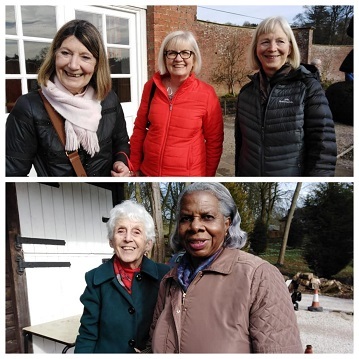 Repton WI had a fabulous Spring Meeting with the Ukulele Crazy Band getting our toes tapping and us singing along as they entertained us with melodies from The Beatles to Pachelbel. 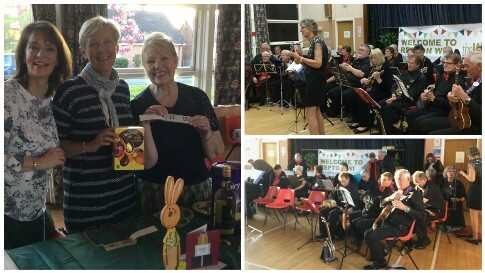 Some of our Repton members were playing in the band so it made it an extra special event plus we had an Easter raffle which involved chocolate! 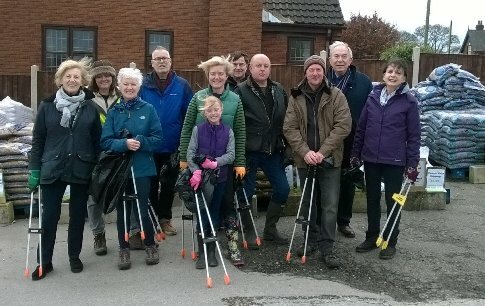 Members of Shipley W.I join forces with members of the Community for giant litter pick in our beautiful parish. 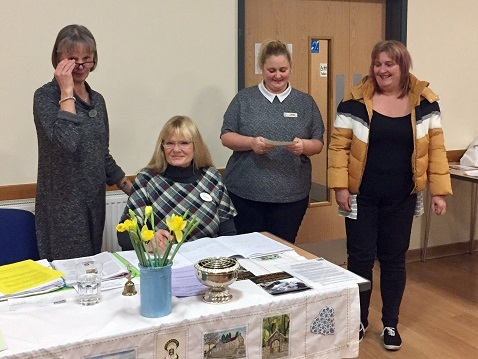 On Thursday 9 March 2017 six WI members were on hand at Clowne Community Centre to support the Eats and Treats event for disadvantaged and vulnerable people aged 55 years or over living in the Bolsover District. We expected around 30 people but 64 people attended. It was an extremely busy day. 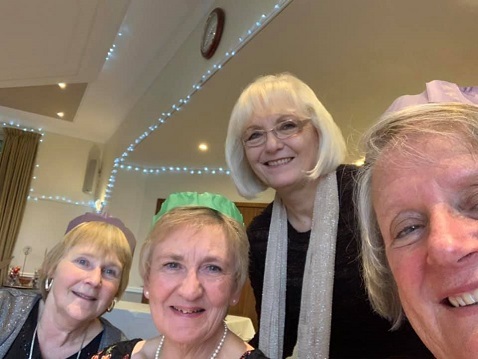 Barlborough & Clowne WI members Sue Ammon, Joyce Brown, Liz Mangle, Viv Rhodes, Doreen Wright and Flo Smith from Bolsover WI were all rushed off their feet. 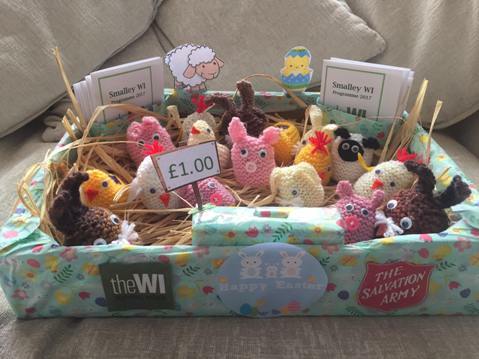 The ladies of Smalley WI have been very busy this week with the launch of their "Easter animals". 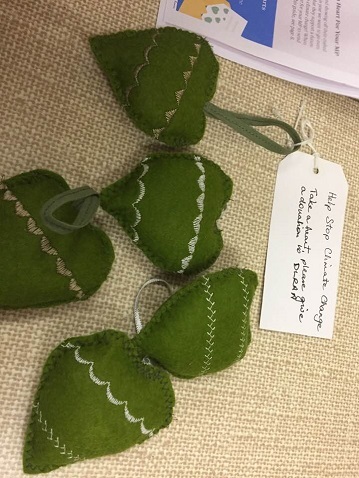 Look out for our beautifully knitted or crocheted little eggs around Smalley and the local area. Only £1.00 each. Proceeds split between our 2017 charity The Salvation Army and Smalley WI. 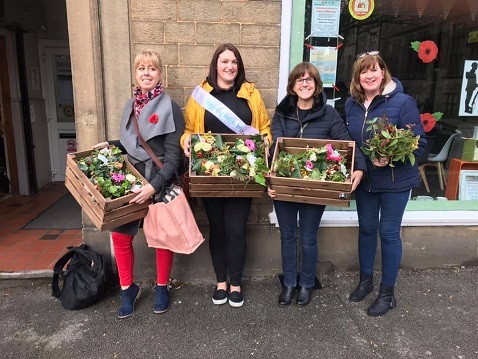 The ladies of Belper WI rose to the challenge of creating the floral displays for the Annual Council Meeting at the Winding Wheel with some very unusual arrangements. Well done ladies. 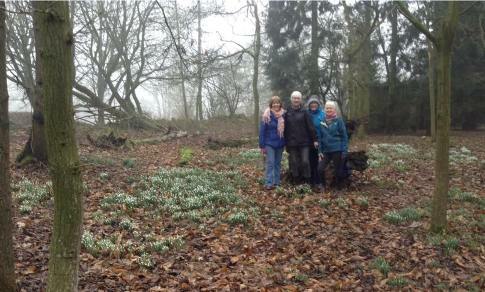 A group of Duffield Cumberhills WI members went to Hopton Hall to see the lovely snowdrops. 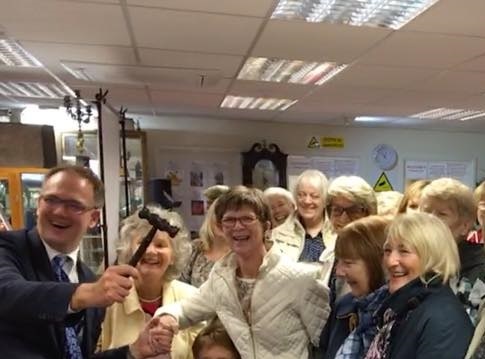 .Breaston WI held a fantastic Community event this month when Charles Hanson came and valued more than 70 items for members. 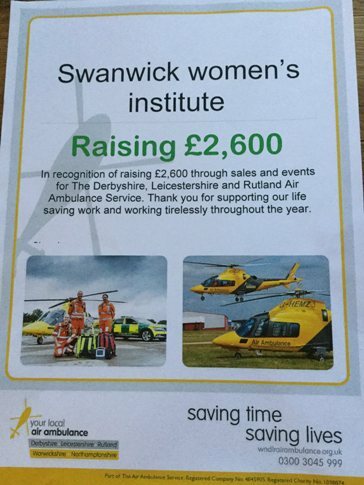 Swanwick WI have raised an amazing £2,600 for their chosen charity 2016, the Derbyshire, Leicestershire and Rutland Air Ambulance Service. Well done ladies. 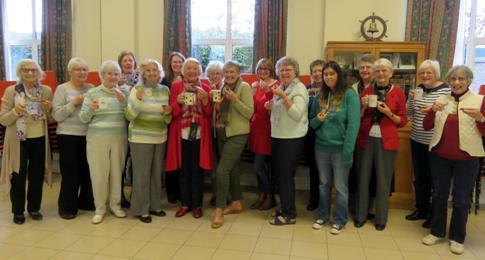 Members of Tibshelf WI with the 'Show the Love' hearts distributed at their latest meeting. 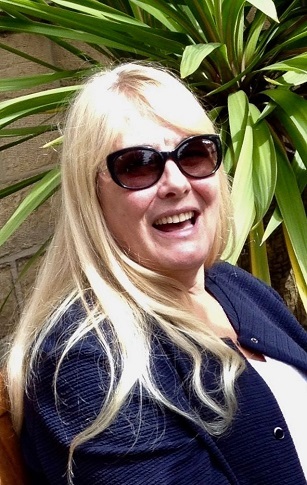 Maggie Bristow has stood down as Trustee. 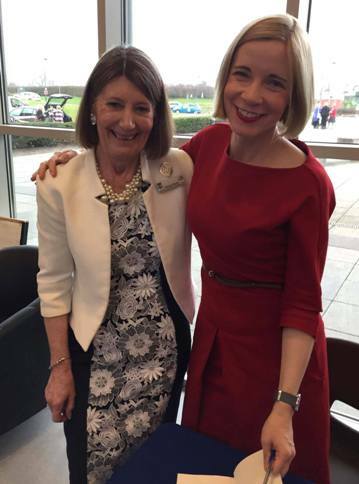 She has worked tirelessly and so very hard for the Federation and was our County Treasurer for several years. Well Done Maggie and enjoy retirement. 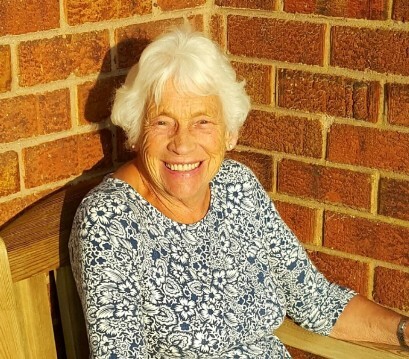 Congratulations to Jean Holland from Mosborough WI who has been awarded the British Empire Medal in the Queen’s New Years Honours list for her tireless work in the Mosborough community. 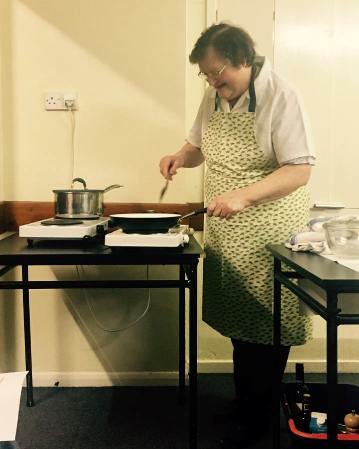 Whether through her work for St Marks Church,Mosborough WI or her roles on various committees,she is at the heart of village life. 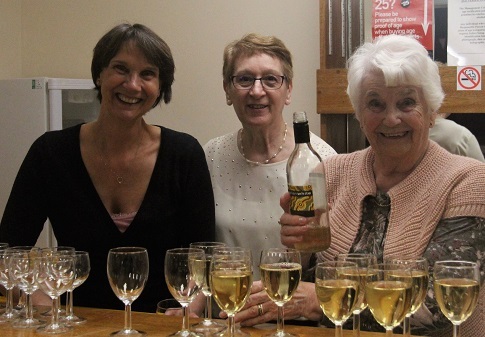 Youlgrave WI found a unique way to help raise funds to repair the village church roof. 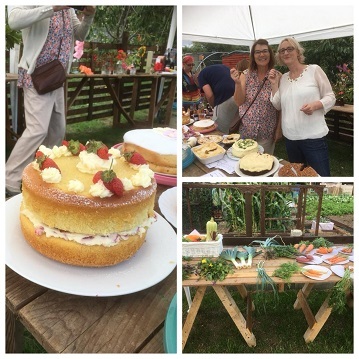 In true WI fashion they baked cake - but what cake! 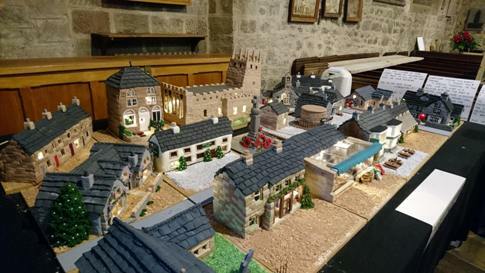 Cakes in the shape of village buildings were raffled off to raise cash. 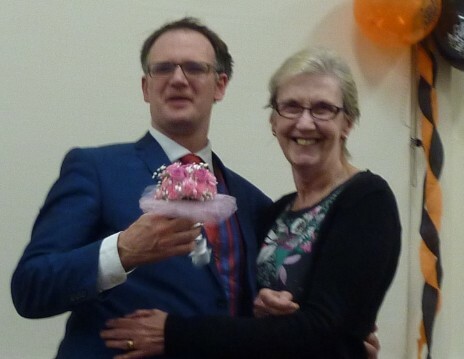 Windyridge WI member Pauline Agar presenting a 'nosegay' to Charles Hanson at the recent Hopwell Group event. 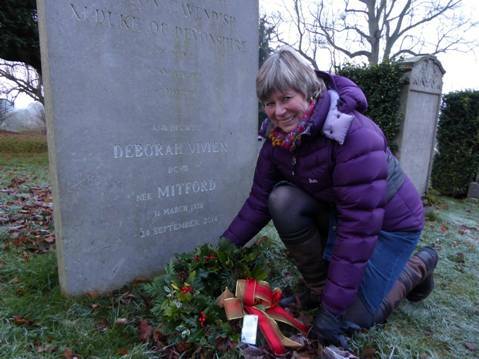 Baslow WI member Judith, has made a Christmas wreath for the grave of the 11th Duke of Devonshire and his wife Deborah who were both great supporters of the WIs in Derbyshire. 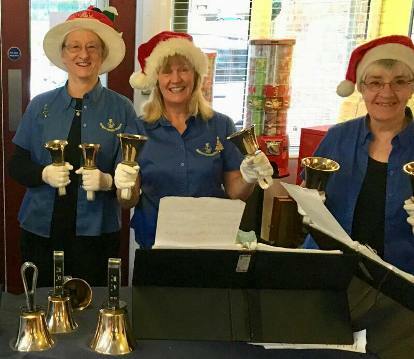 Ilkeston WI - CHRISTMAS EXTRAVAGANZA. All income from this event will be shared between the Flamstead Centre and the Air Ambulance. Well done ladies for your work in the community. 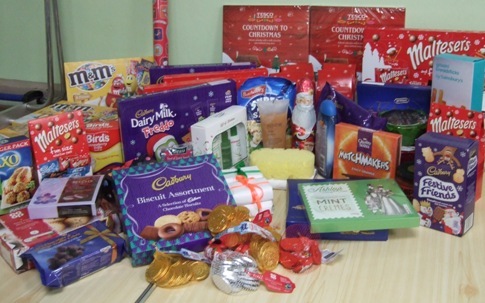 Tupton WI Reverse Advent donations - chocolate and toiletry treats. We decided a few years ago to support our local Trussel Trust food bank and monthly make a collection of different items. Members are, not surprisingly, very generous! Several members have also volunteered to collect at local supermarkets. 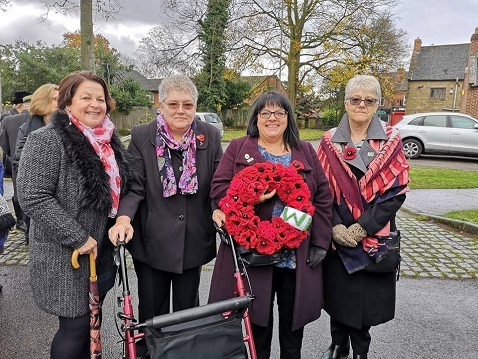 In the July edition of the WI Life there was a call for members to remember the women who died in service in the two World Wars by taking part in the CWGC Living Memory Project. 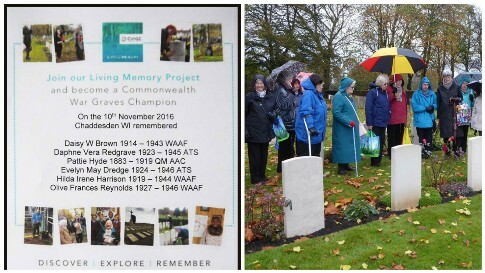 Chaddesden WI discovered and explored the six service women buried in Nottingham Road Cemetery, Derby and today remembered them by laying tributes on their graves. 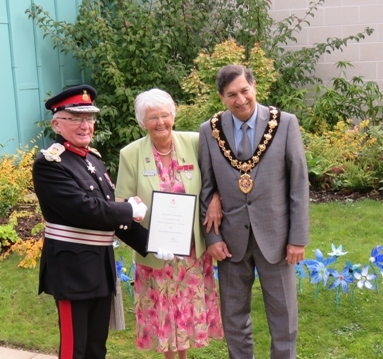 Former County Chairman Barbara Parkinson BEM receives her Medal from the Lord Lieutenant of Derbyshire Willie Tucker during the reception held at Treetops Hospice where Barbara is a volunteer. Congratulations Barbara and Well Done. We're very proud of you. 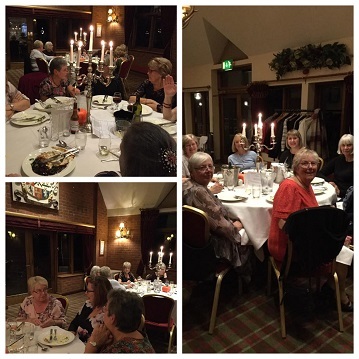 Barlborough and Clowne WI hosted the DeRodes Group autumn meeting in October 2016. 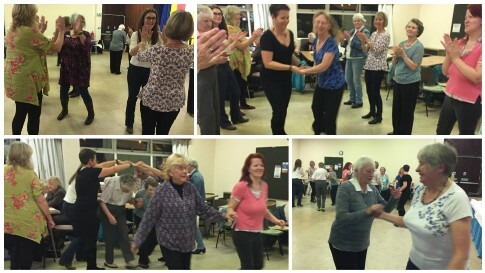 A fun evening Barn Dance had everyone up on their feet and burining off the calories from the supper provided! A new WI for BREASTON. 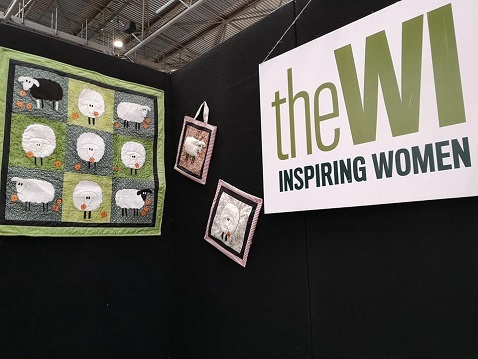 The WI is very popular in the Village of Breaston and there is a waiting list to become a member. At a meeting today over 40 ladies came to learn more about what the WI has to offer and hopefully they will all soon be members. 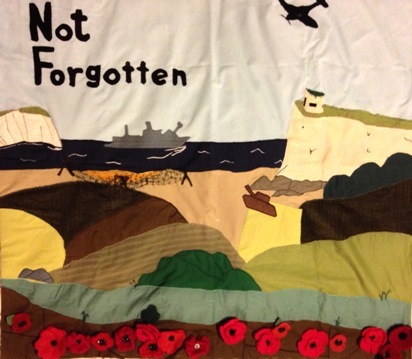 Clay Cross WI This is our lovely wall hanging, made by Chris and with a few poppies on that the WI ladies have made. 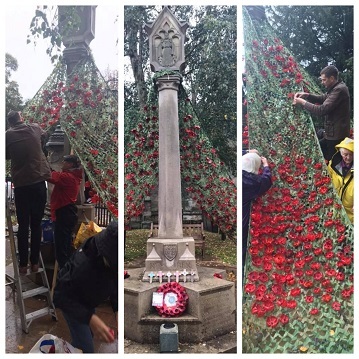 We would like more poppies added, so if you would like to contribute one, the hanging will be dispalyed at the The Rykneld Turnpyke on John Street in Clay Cross from the weekend. Poppies can be made from anything at all. Come down and pin one on. You don't have to be a member of the WI or even a woman! The more the better. 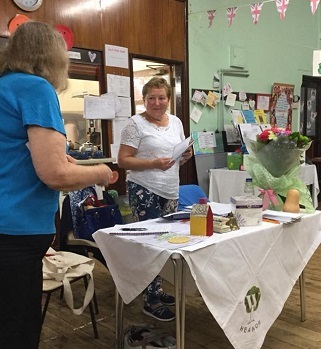 Stapenhill WI ladies like icecream – especially Bluebells!! 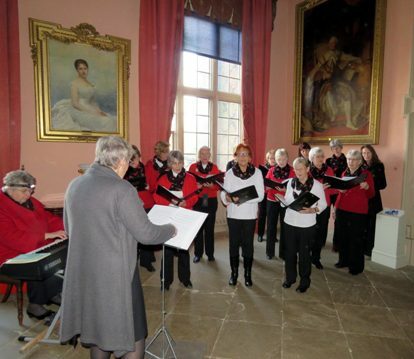 June Blurton, President of Oakwood WI, in the Star Chamber at Bolsover Castle surrounded by her ‘Ladies in Waiting! cakes. The children had a fantastic time decorating the cakes, dressing up and making flags and bunting plus singing ‘God Save Our Gracious Queen’ and Happy Birthday your Majesty. 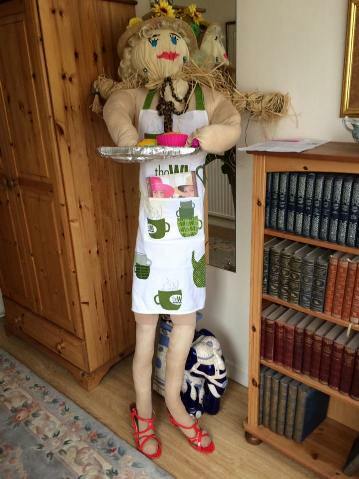 Meet Celia, the Duffield Cumberhills WI entry in the Scarecrow trail of the Duffield Arts Festival I think we wi be seeing quite a lot of Celia over the next few weeks! 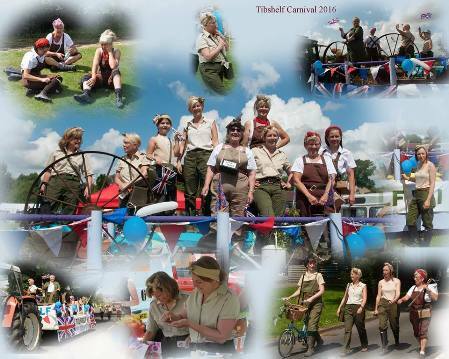 Little Eaton WI at their Annual Carnival - and they won 1st Prize! Well done. Several Trustees went to the screening today. It was great to see what happens - 121 of the youngsters seen todayhave had an ecg and if a potential problem was found then are seen by a doctor- all this input comes from CRY. The time given up is amazing. 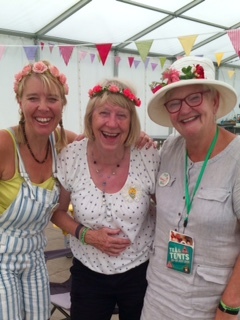 Margaret Harrison at Tea and Tents 2016 with other WI members - Margaret is in the middle! 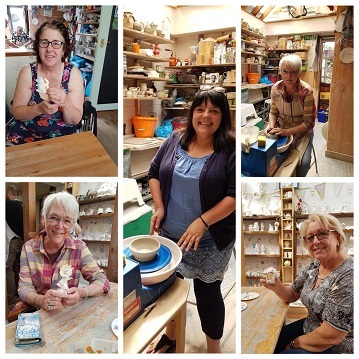 Dethick Lea and Holloway WI had a fabulous craft session with Angela Thompson at Tissington Glass. 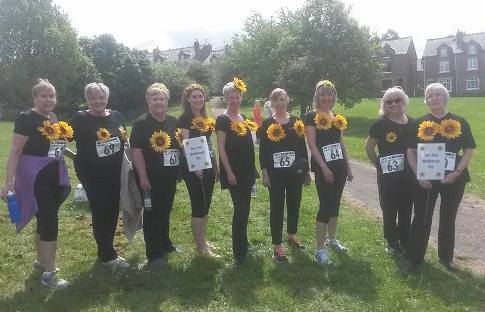 Loscoe Ladybirds W.I entry in the 'Ey Up Mi Duck' race to raise funds for Sight Support Derbyshire. They obviously rose to the challenge to turn a giant plastic duck into a ladybird! 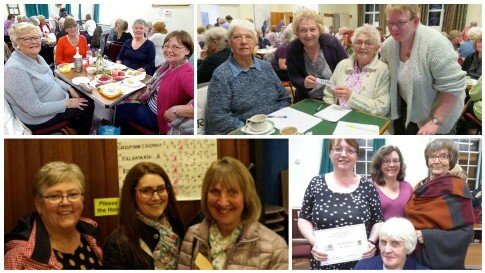 Heanor WI raised £835 for the Derby Breast Scanner The donation was raised over the last twelve months by holding various charity events, including a coffee morning and a Quiz with Pie and Pea Supper, which were both very well supported. 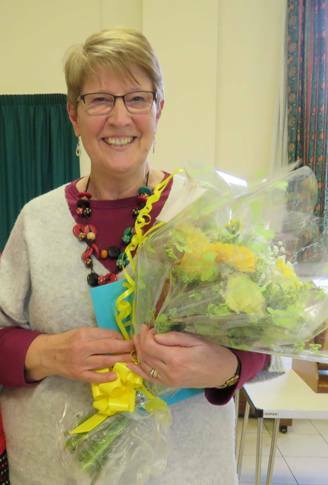 Celia Dyson won £100 First Prize in the WI Monthly Prize Draw. 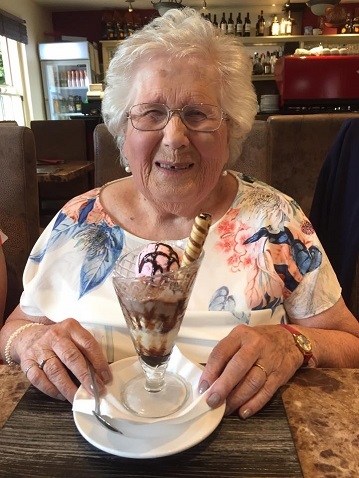 With the winnings she enjoyed a family meal at Le Mistral in Wirksworth. 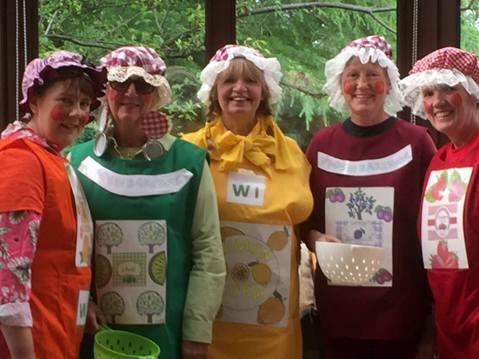 Littleover WI members dressed for the occasion to celebrate the Queen's 90th Birthday followed by strawberries and cream, shortbread and Pimms! 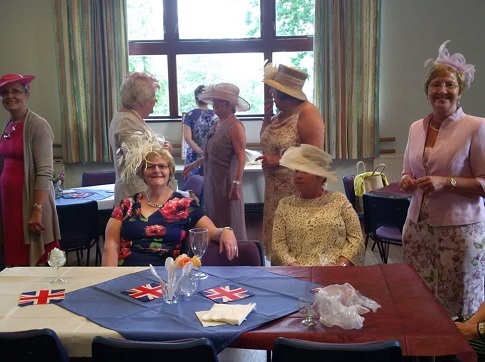 Killamarsh WI coffee morning celebrating the Queen's 90th birthday. countryside giving fabulous views over to Breedon on the Hill. 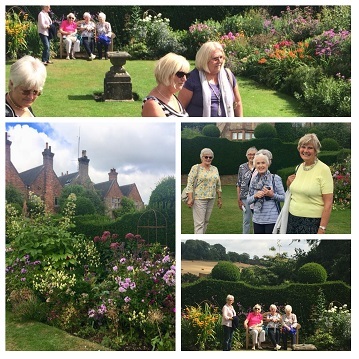 Members of Tissington & District WI had a very enjoyable visit to the Weleda Gardens at Ilkeston on the 22 June. 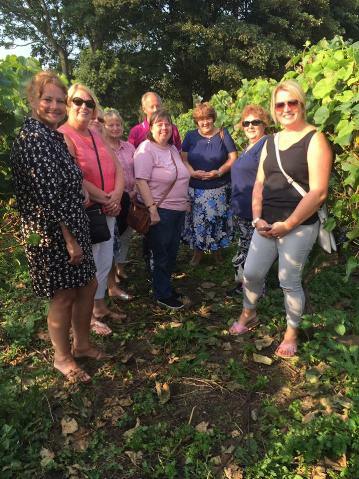 Members were given a guided tour of the gardens and wild life meadow, with a very informative talk about the work of Weleda UK, their biodynamic gardening methods and the plants which are used in their products. 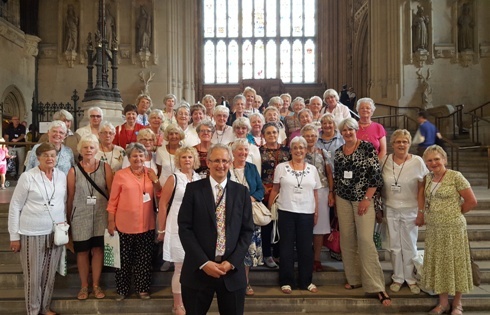 Fairfield WI members plus friends from other WIs in Peak District visit the Houses of Parliament -courtesy of their MP Andrew Bingham. 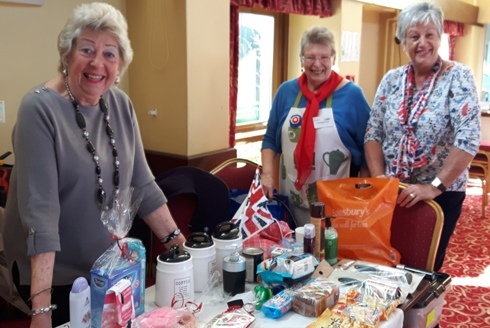 Risley WI celebrated the Queen`s 90th Birthday wearing Red,White and Blue. 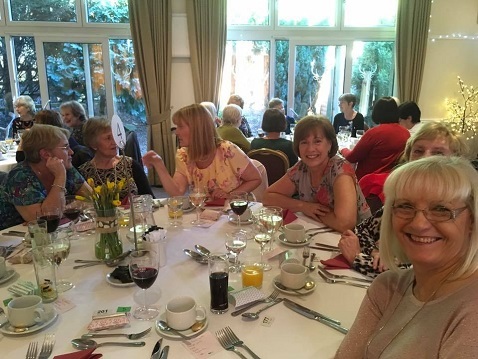 A sumptuous Buffet Lunch and Quiz was organised by the Risley WI committee. 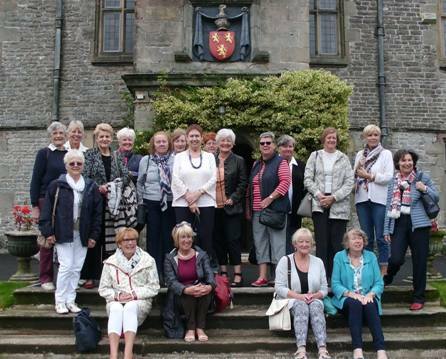 Shottlegate and District WI enjoyed a private tour of Tissington Hall, followed by high tea in the Herbert Tea Rooms The trip was courtesy of Mary Harrison who had left a small legacy for WI members to enjoy. 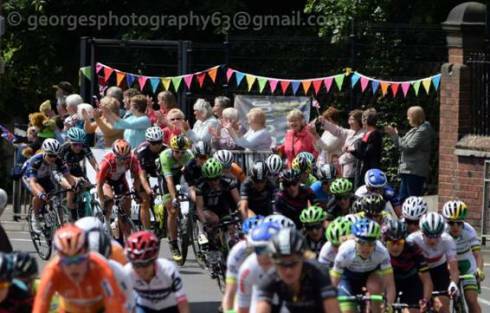 Newhall & District WI welcoming the Aviva Women's Cycle Race through our Village on 18th June 2016. 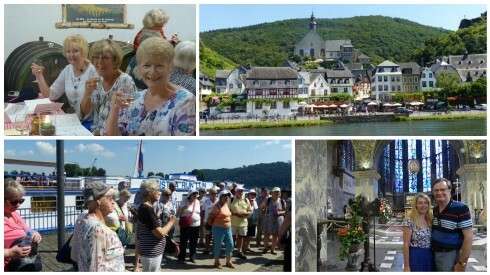 A group of 45 members and husbands recently enjoyed a holiday to the Moselle Valley. Leaving by train from Sheffield, Chesterfield and Derby Stations to St Pancras the group then went by Eurostar to Brussels and then onto Aachen by coach. The following four nights were then spent in Kinheim with visits to Koblenz, Cochem, and Trier. Cruising on the river and enjoying superb weather made this a brilliant holiday. Let us be honest - we all wish we had been there! 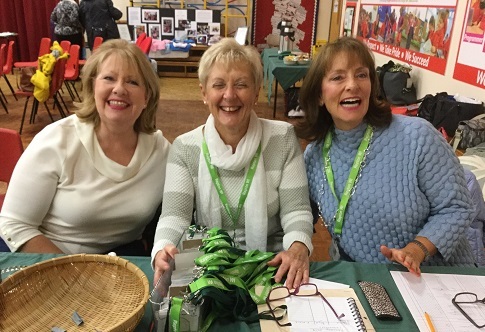 Barlborough and Clowne WI members were at Brockley School, Shutlewood on Saturday promoting the WI at a Community event. Dennis Skinner, our local MP, spent some time at our information stand. 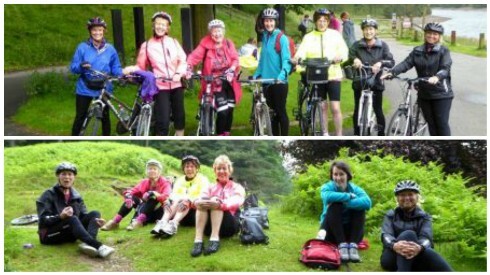 Liz from Barlborough WI joined six ladies from Baslow WI on Thursday 7th July, for a bike ride round Derwent Dams approx. 17 miles. 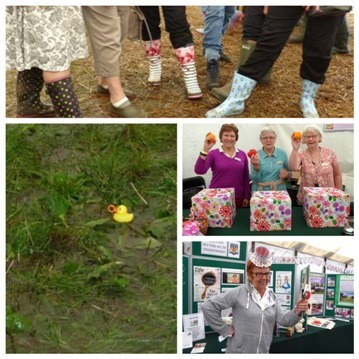 We all thoroughly enjoyed our day despite the rain, most annoying as it never rained in Clowne! WI ladies in action! 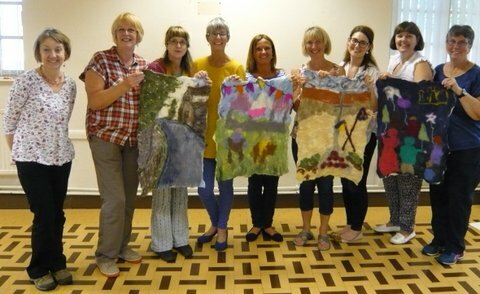 Bolsover WI involved in producing a felted hanging destined for the local library once embelishments have been completed. 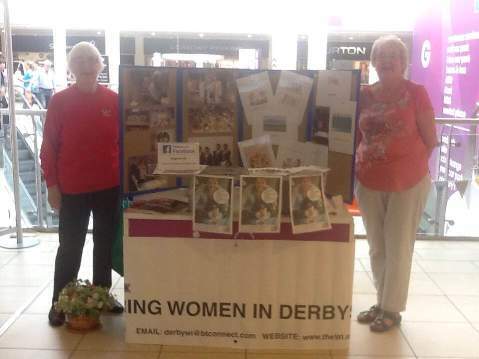 Beighton WI promoting the WI in Crystal Peaks Shopping Centre, Sheffield in June 2016. They have done this for the last three years with some success - their current President was recruited during their first promotion event. So it does work! 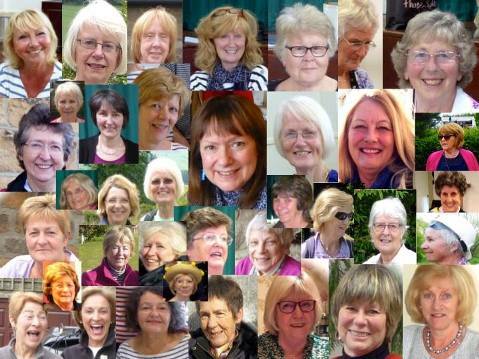 Baslow WI Ladies were sent to the Workhouse at Southwell in June 2016 We can only hope that they were eventually allowed home for 'Good Behaviour'? 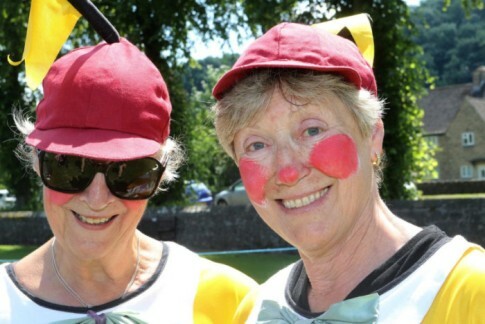 DFWI 'Fun and Games' at Chinley - A brilliant video of the antics at the 'Funand Games'event in the north of the county.